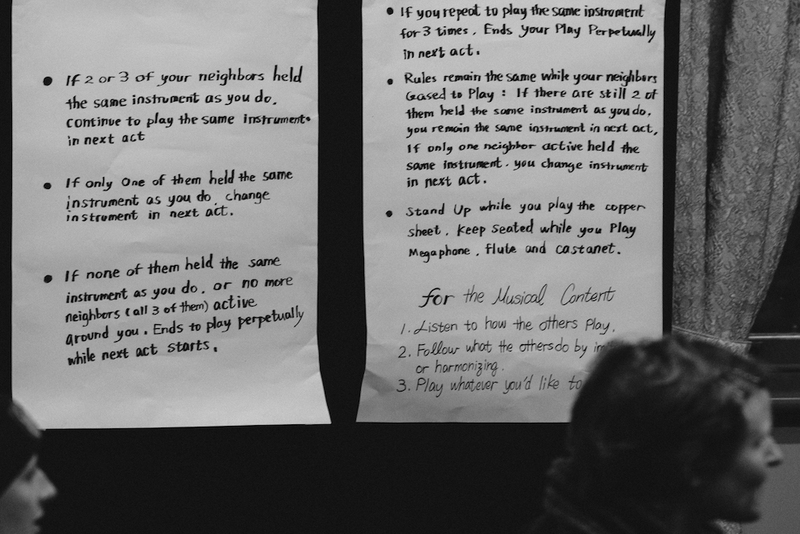 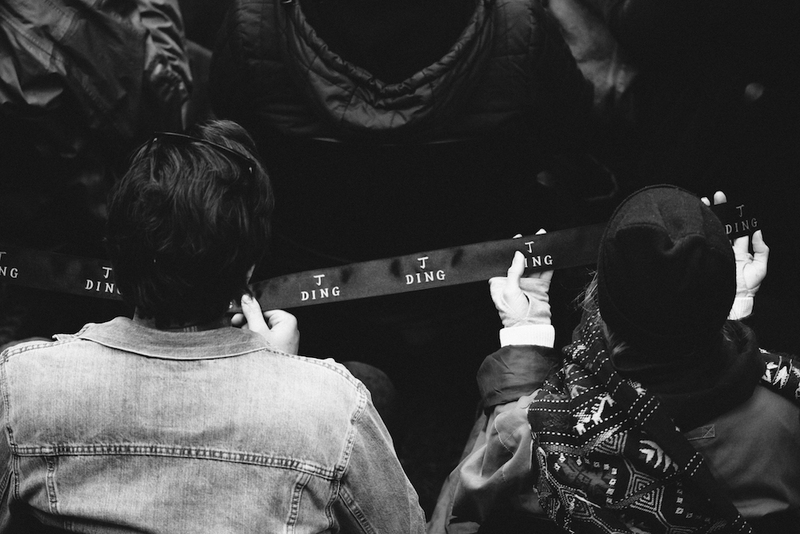 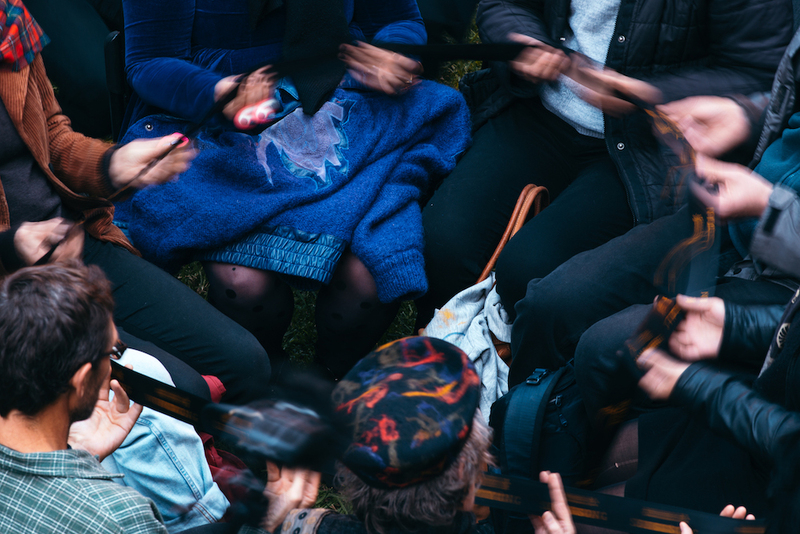 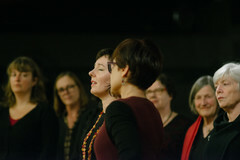 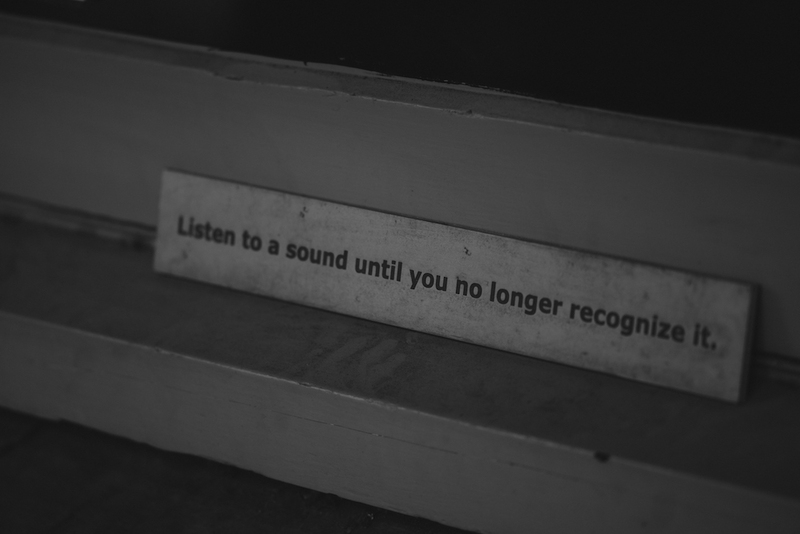 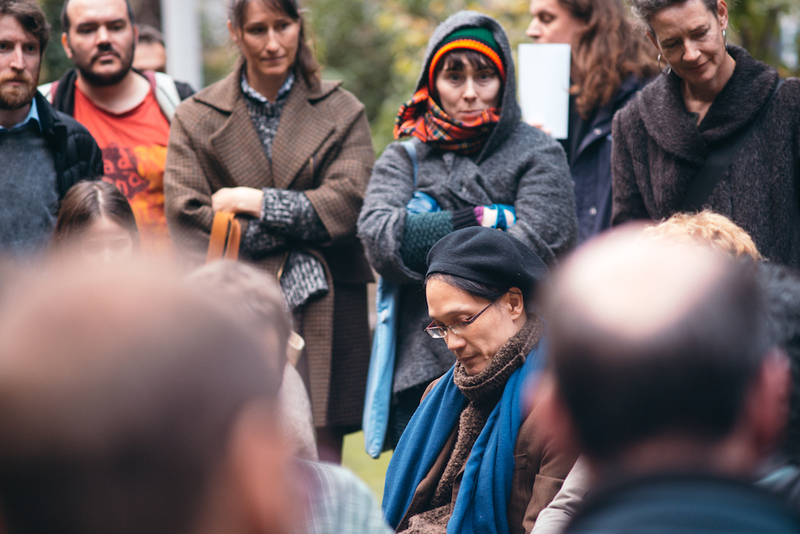 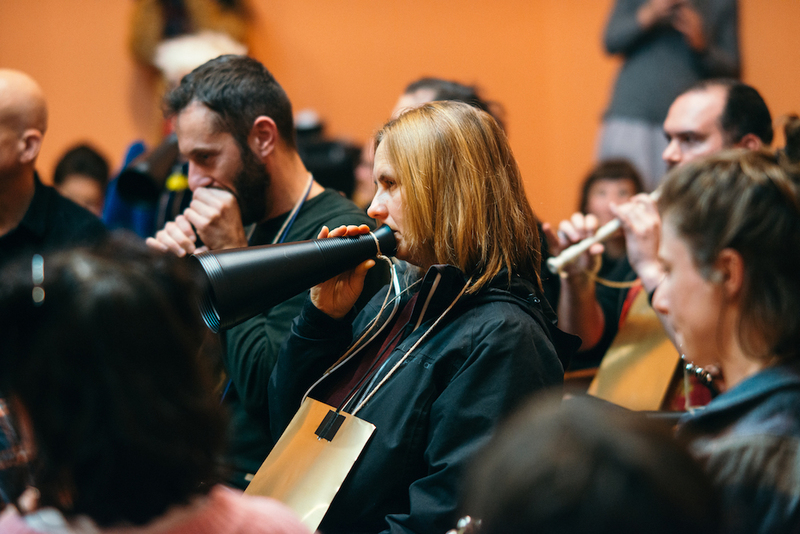 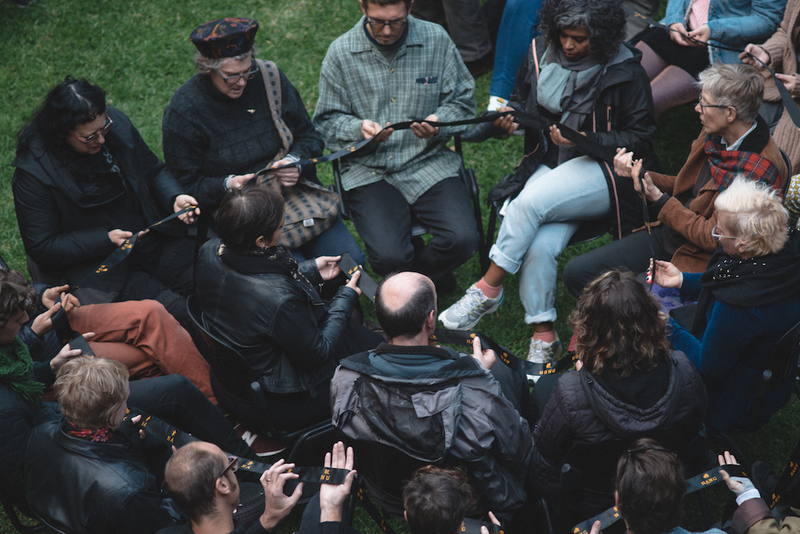 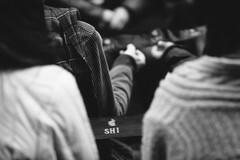 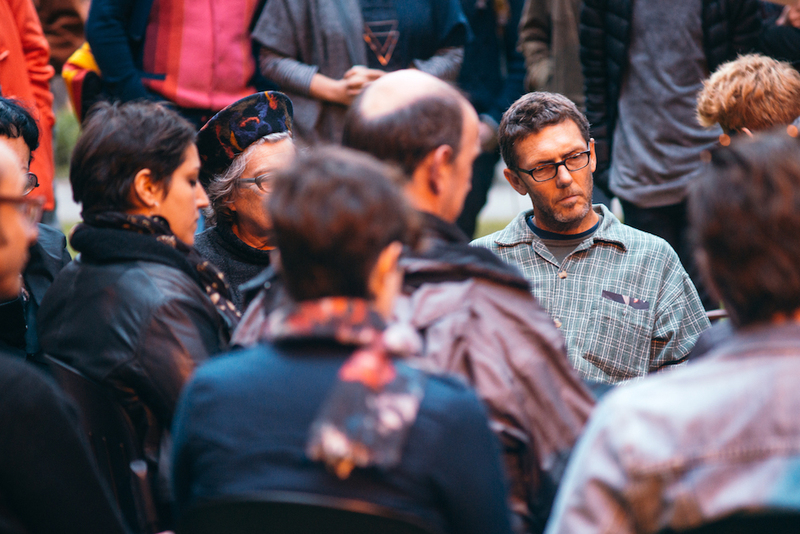 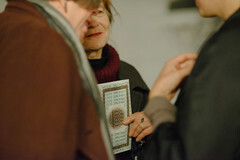 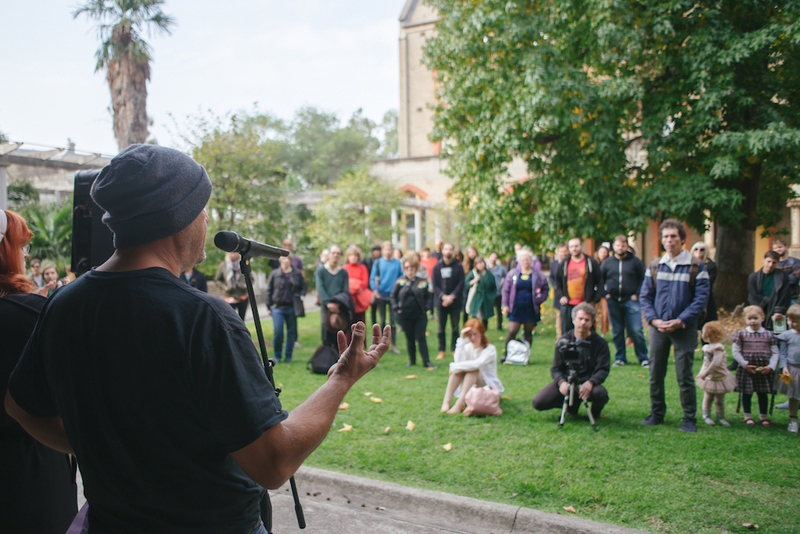 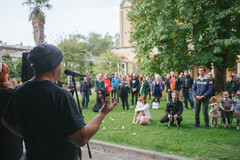 Polyphonics have much artistic and social potential: to make difference audible, to ‘sound’ disobedience, choreograph dissonance, and explore the harmonies possible when we bring voices together (and apart) in a shared space. 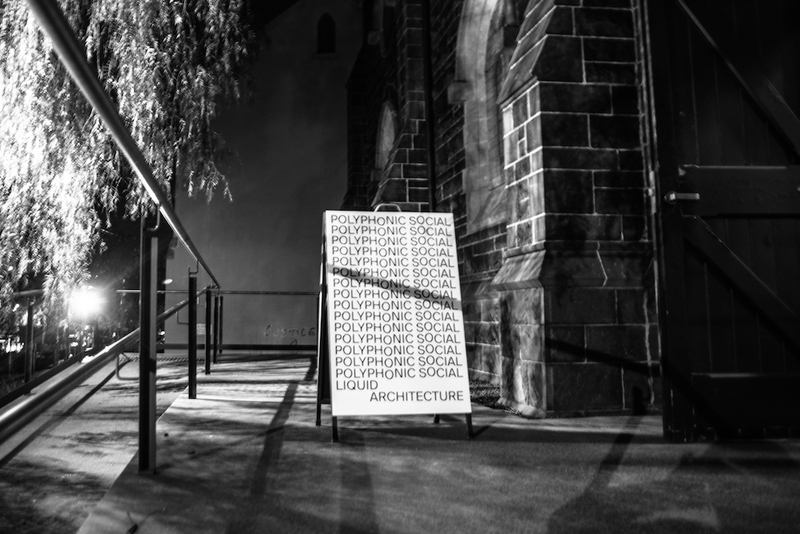 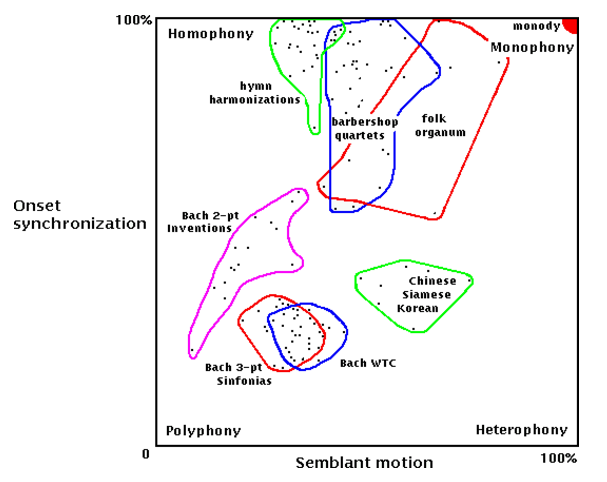 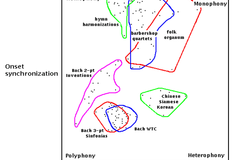 Polyphonic Social is an annual Liquid Architecture project with the proposition that artists think about polyphony in a vastly expanded way. 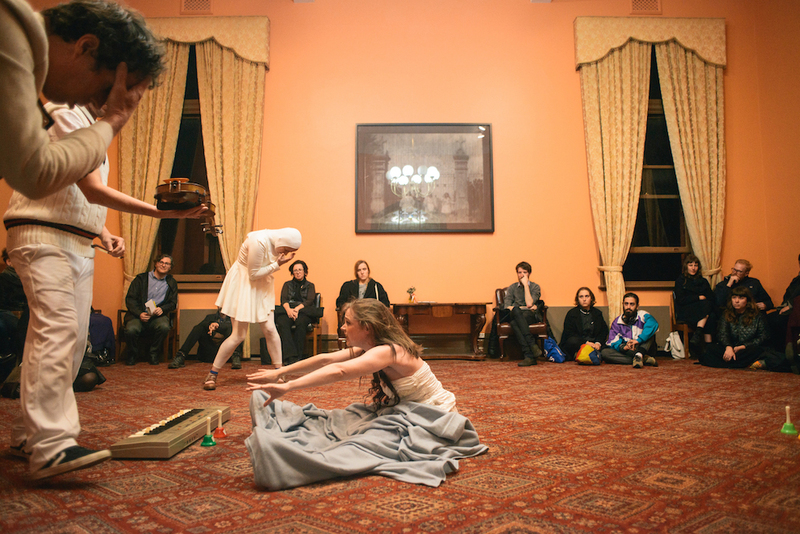 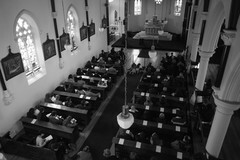 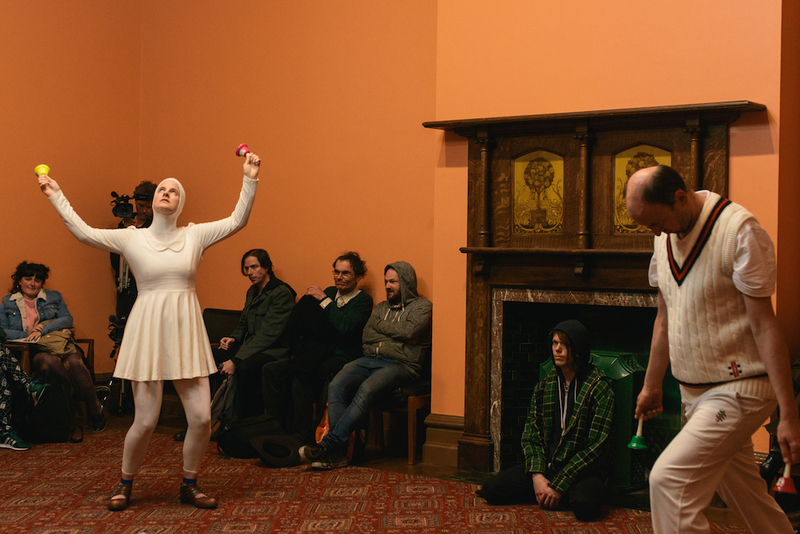 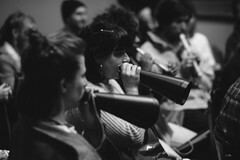 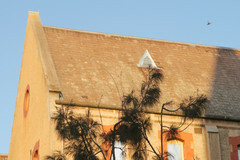 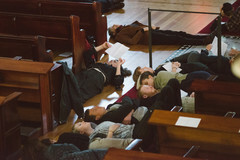 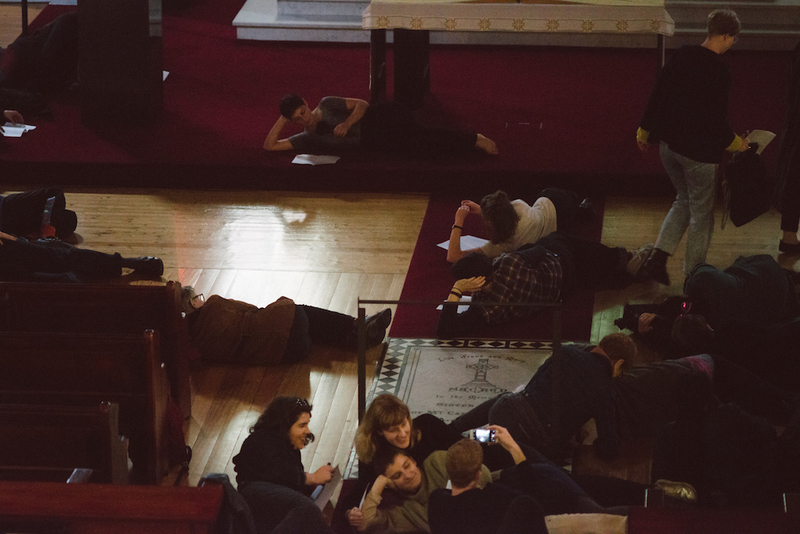 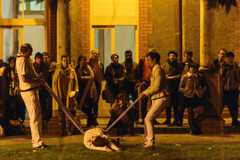 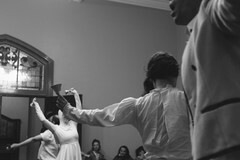 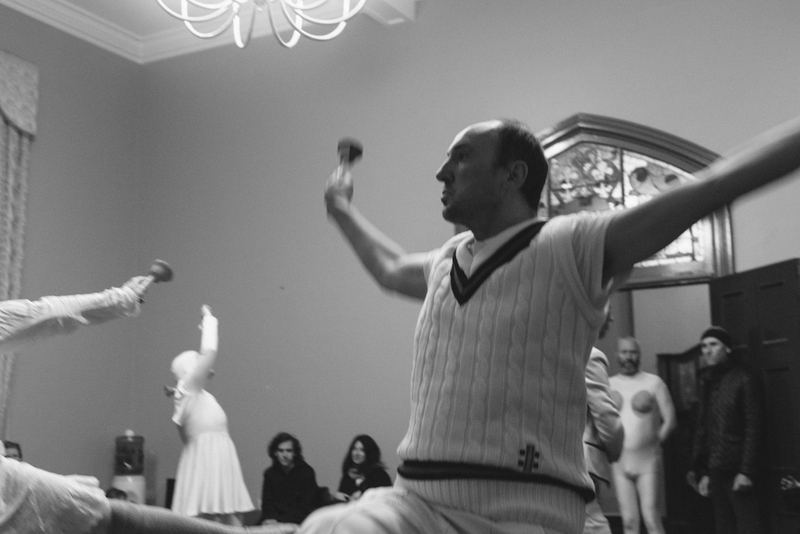 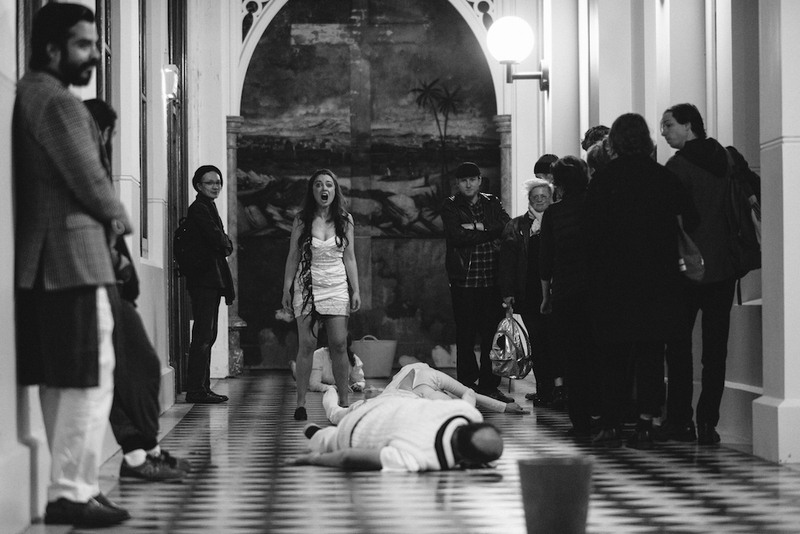 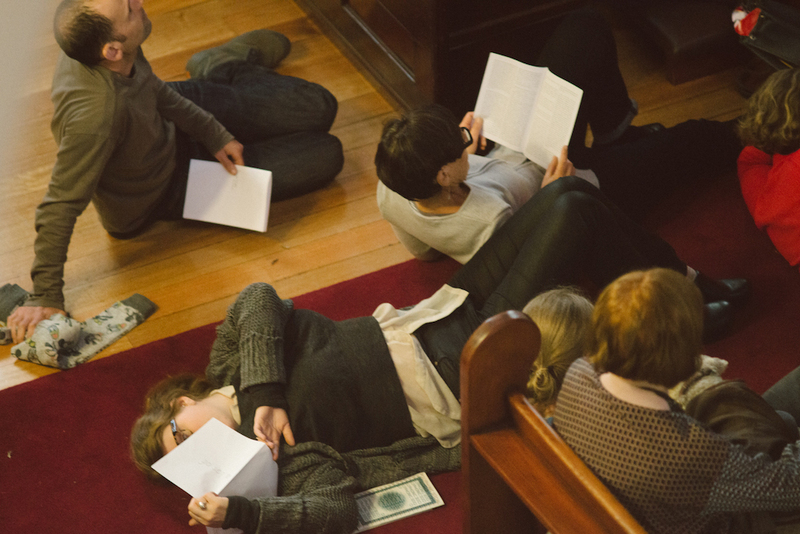 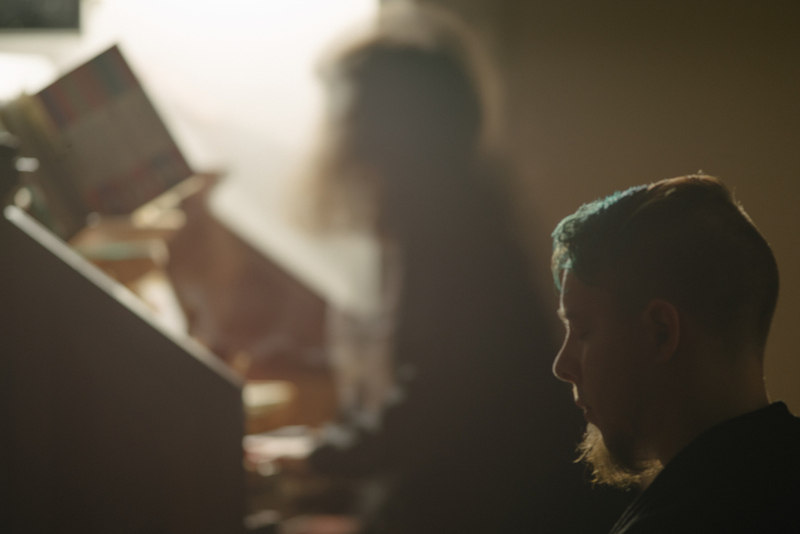 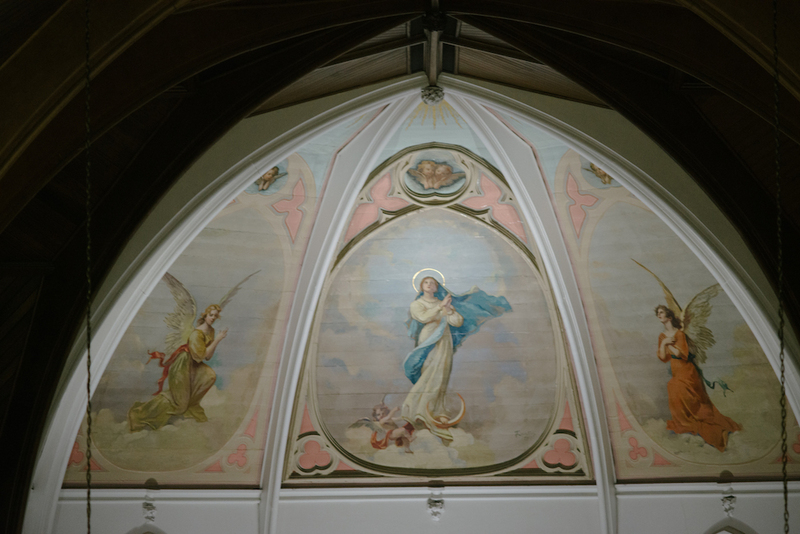 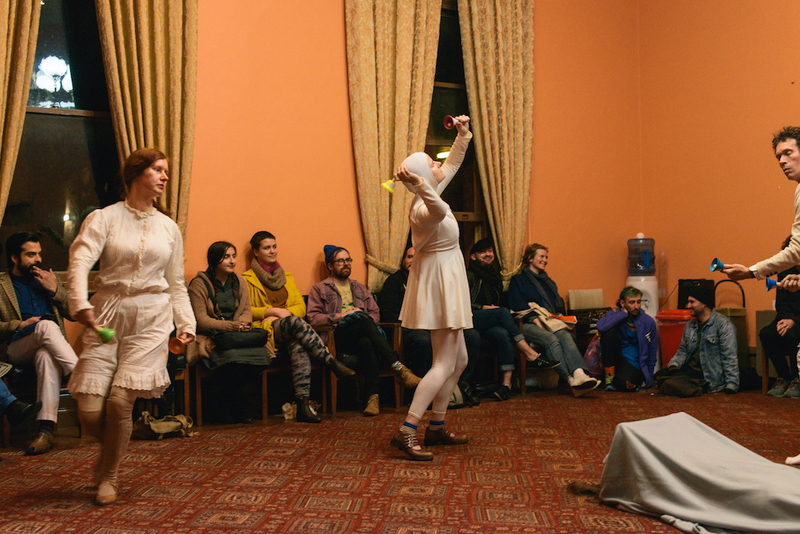 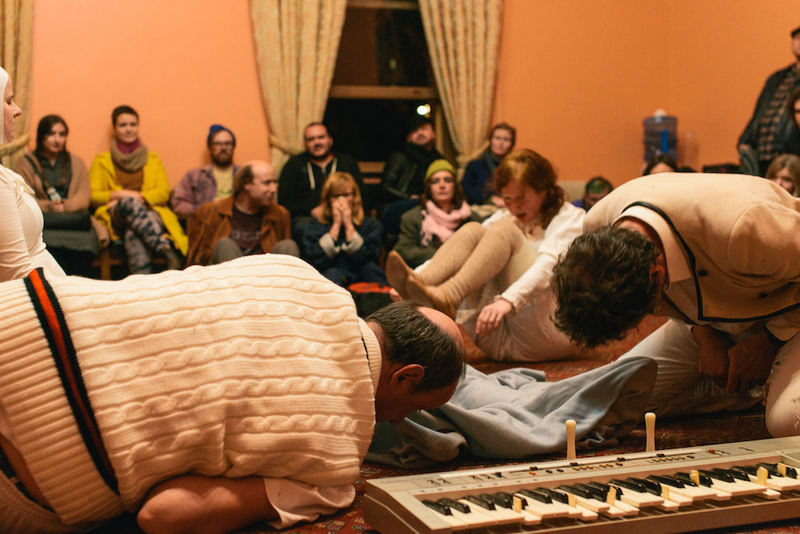 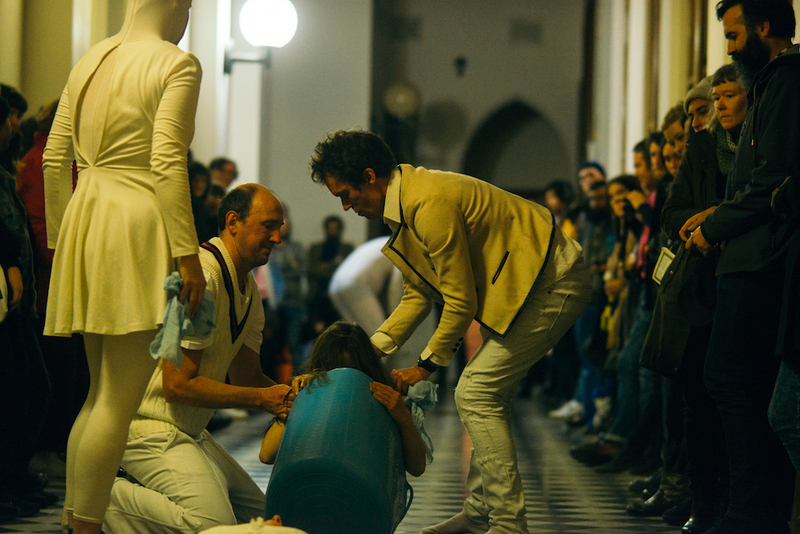 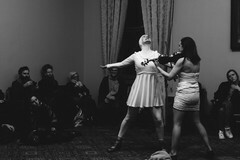 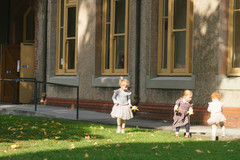 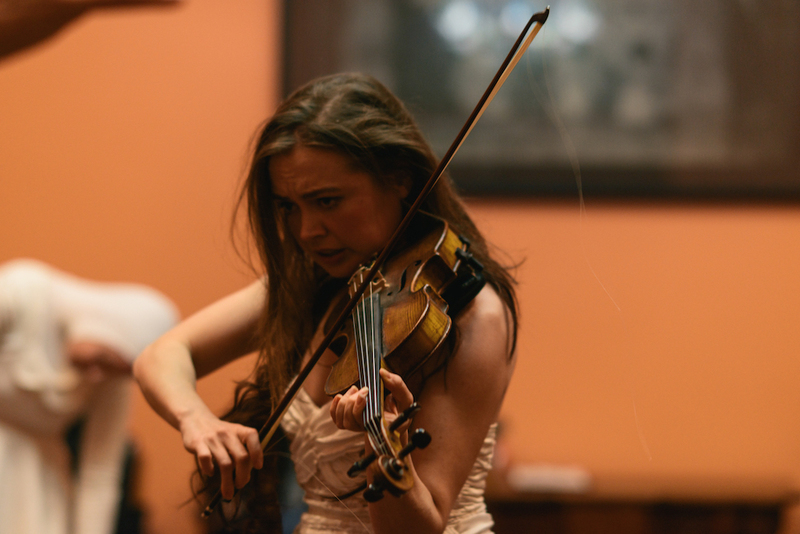 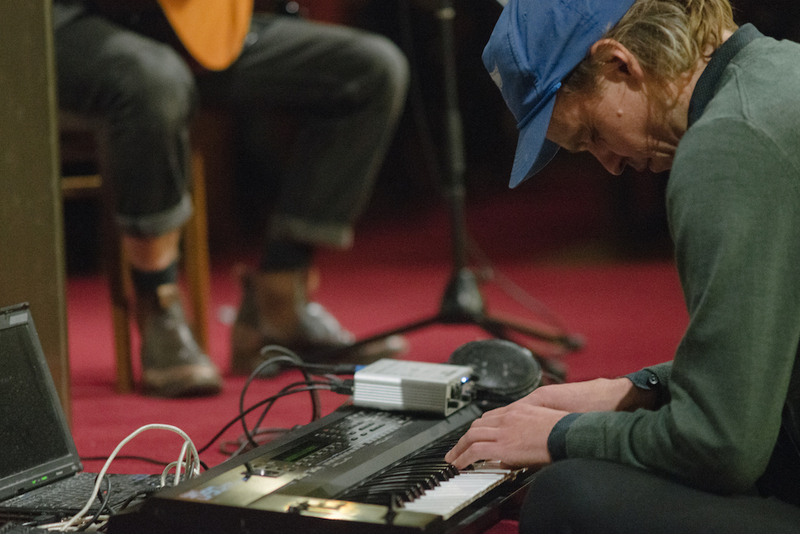 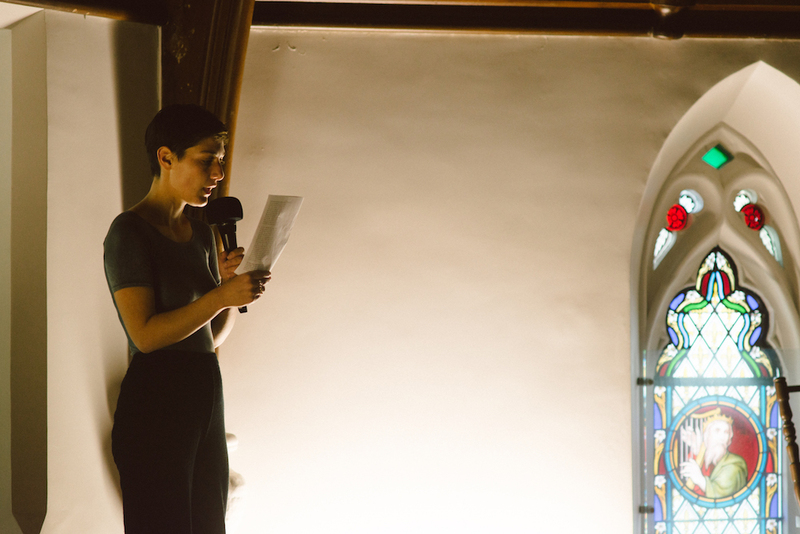 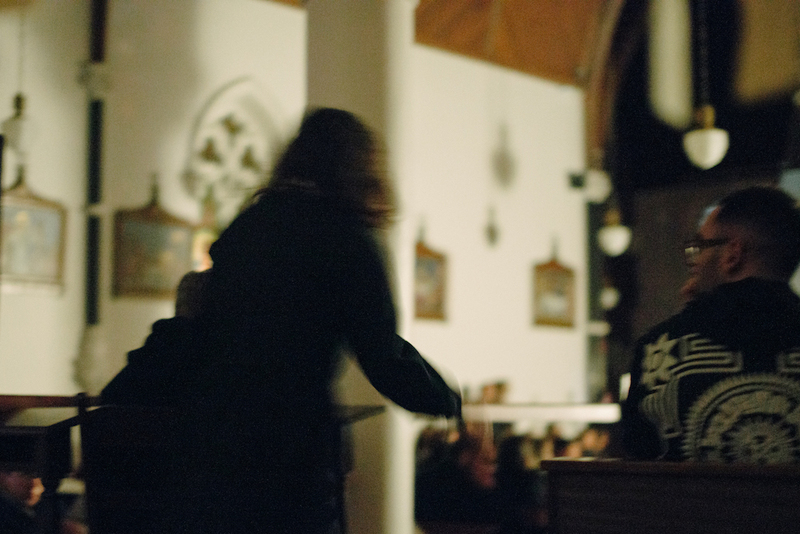 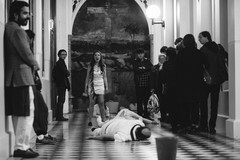 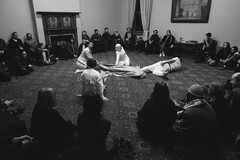 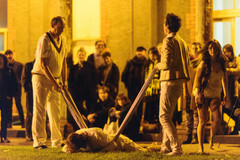 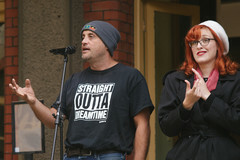 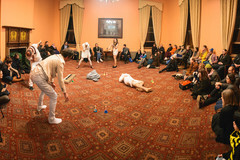 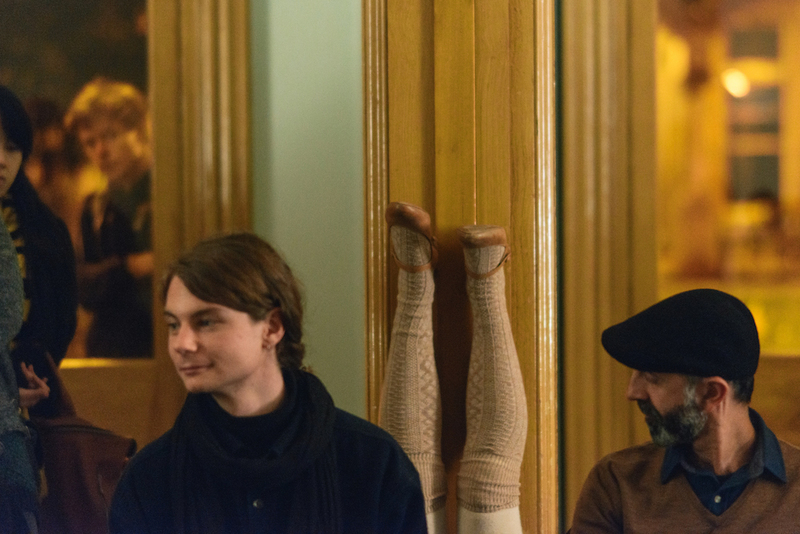 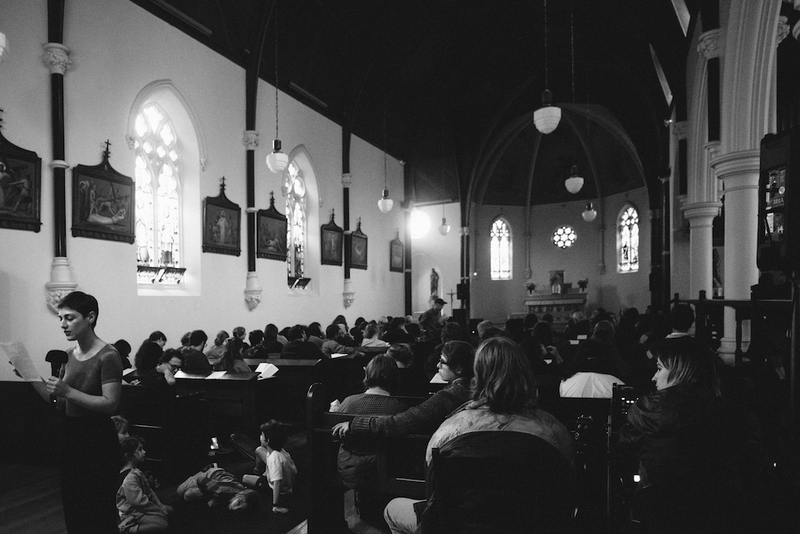 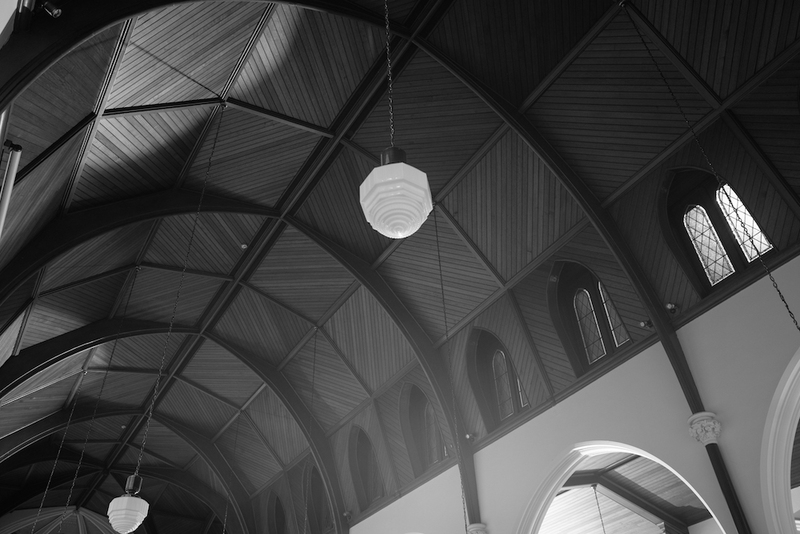 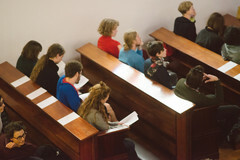 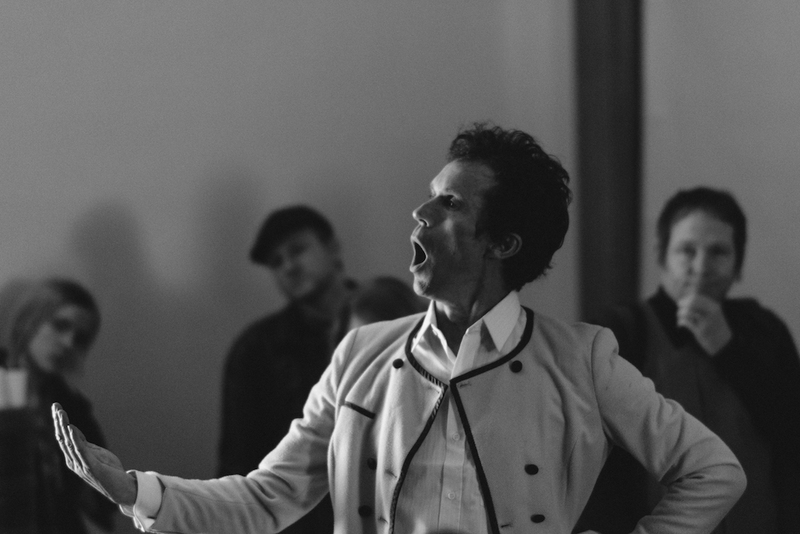 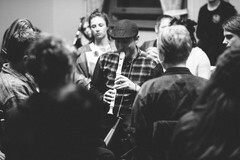 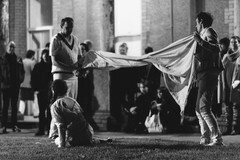 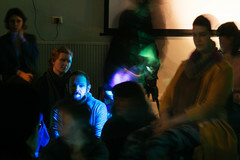 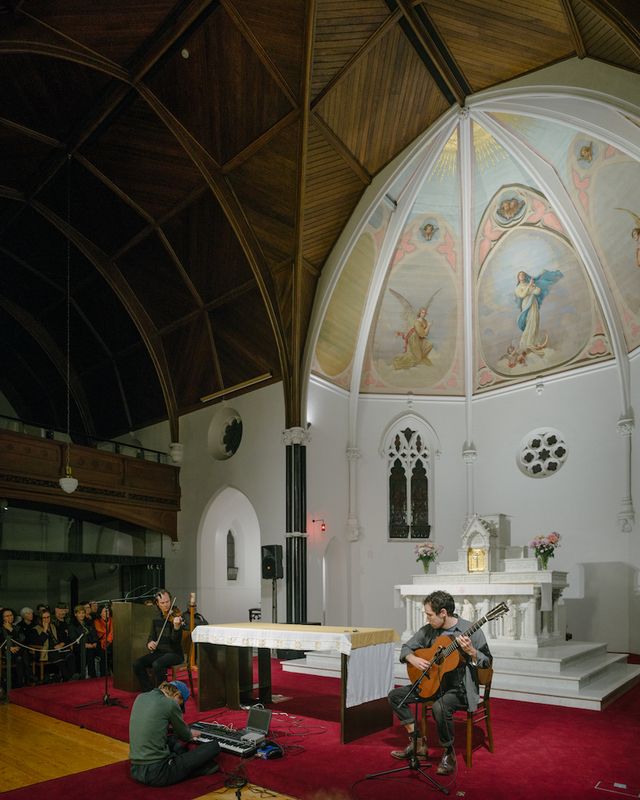 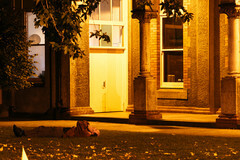 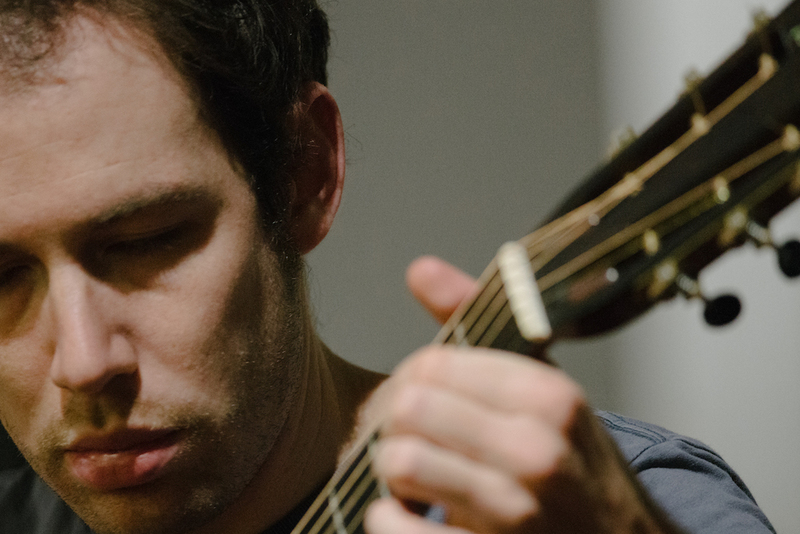 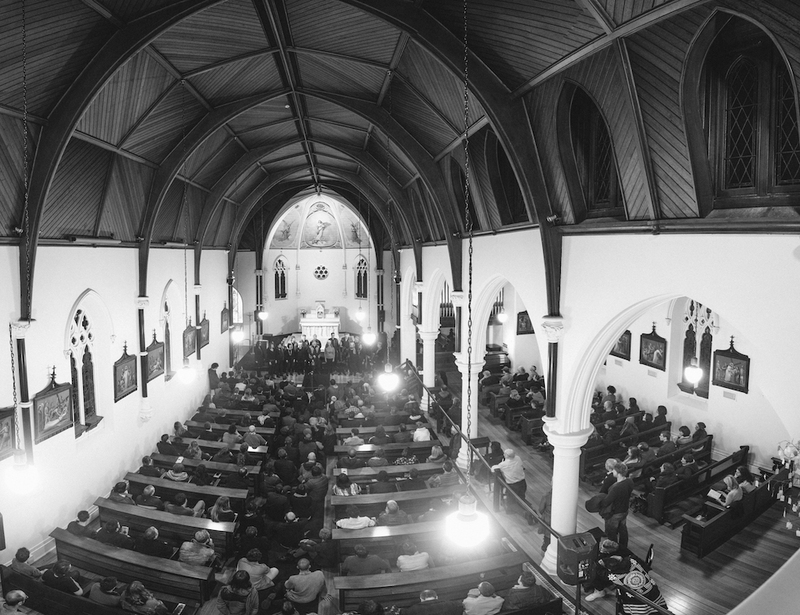 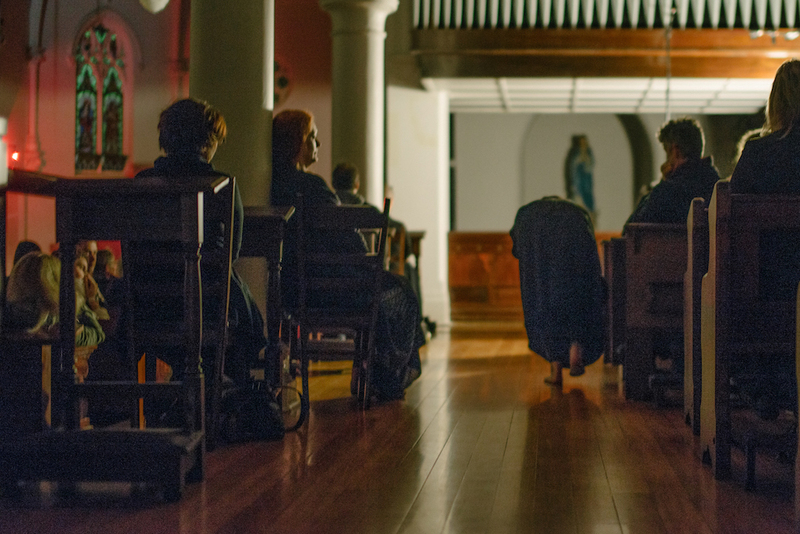 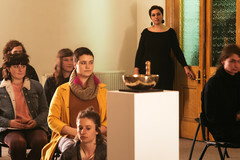 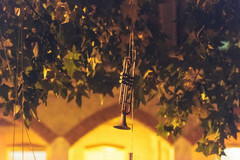 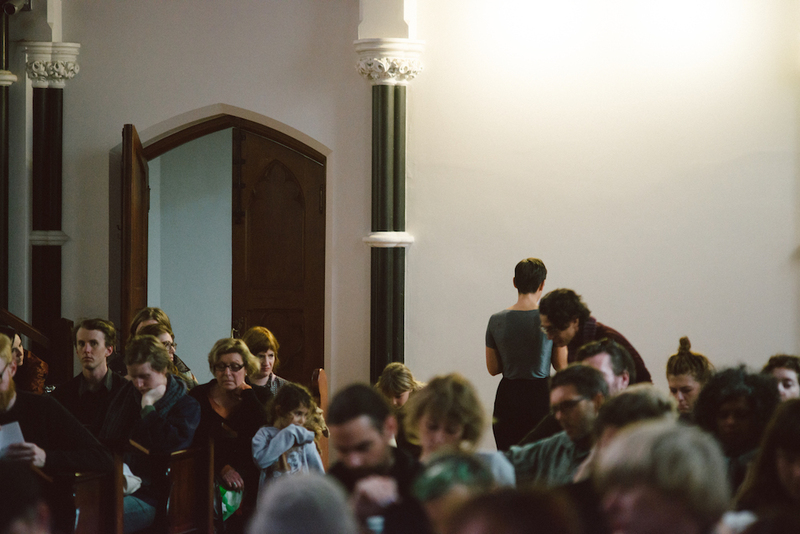 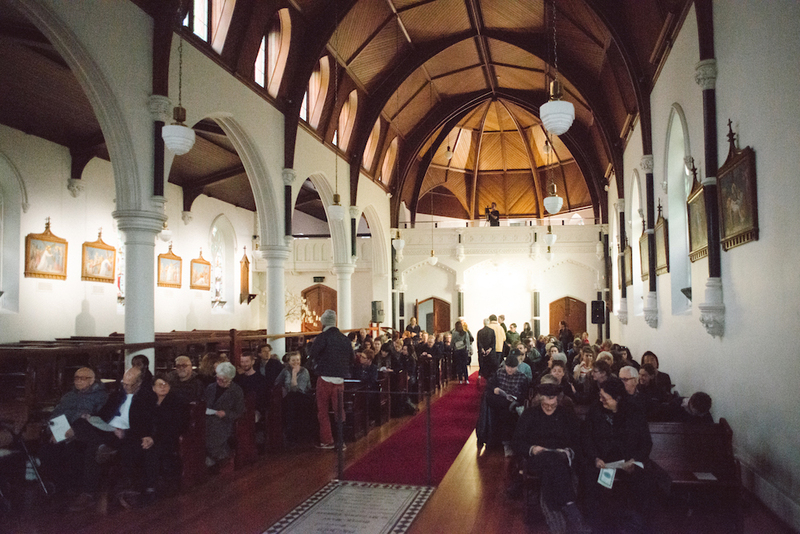 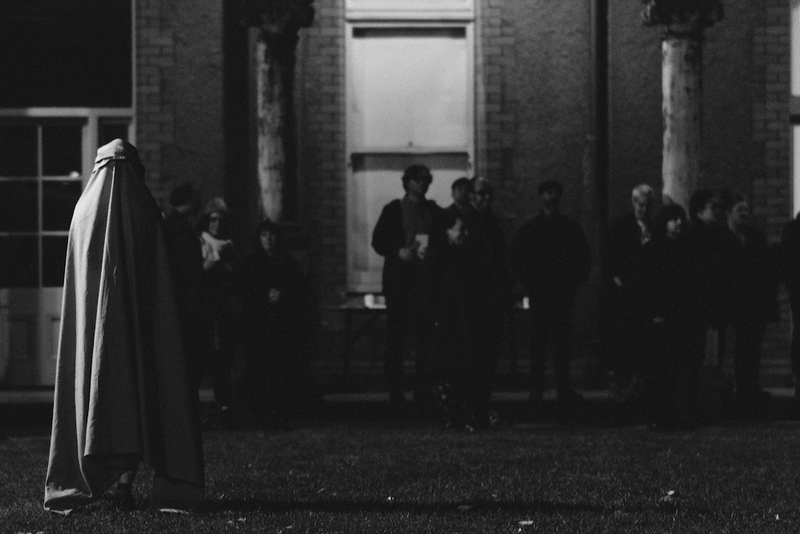 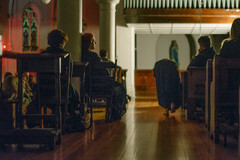 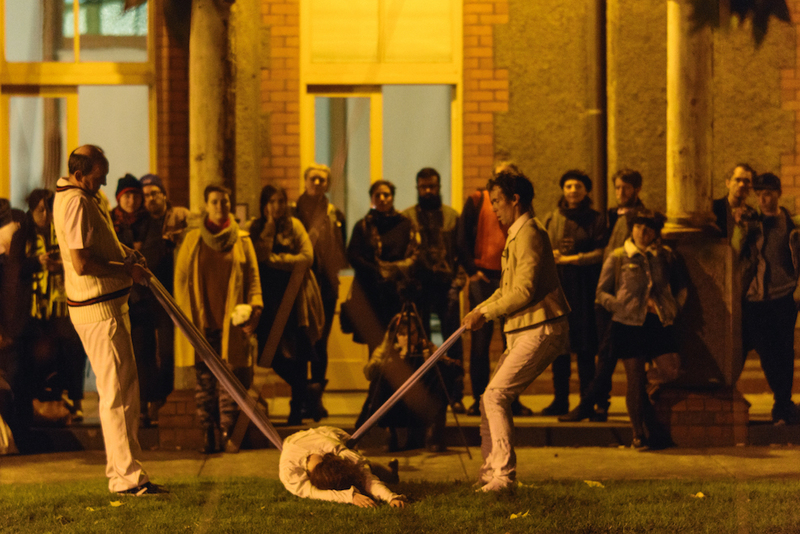 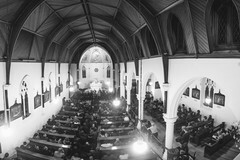 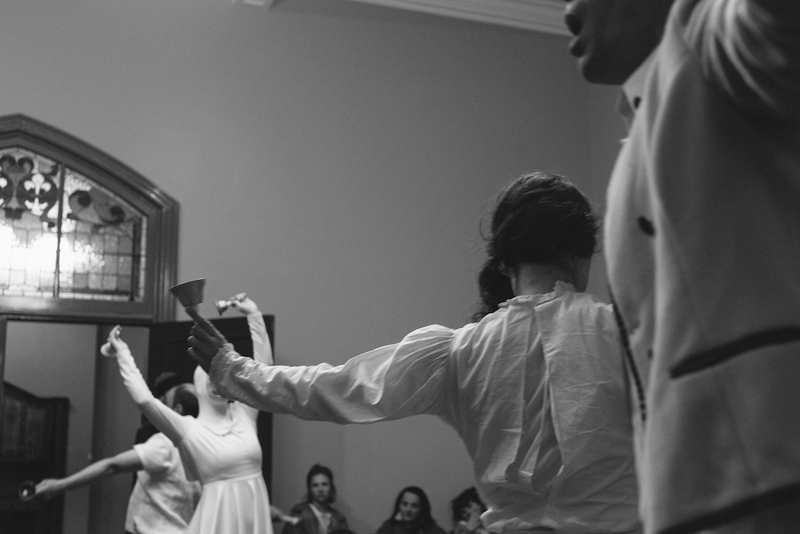 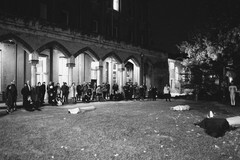 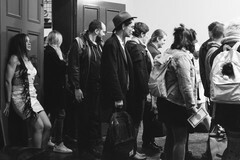 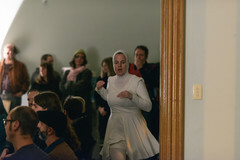 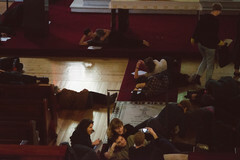 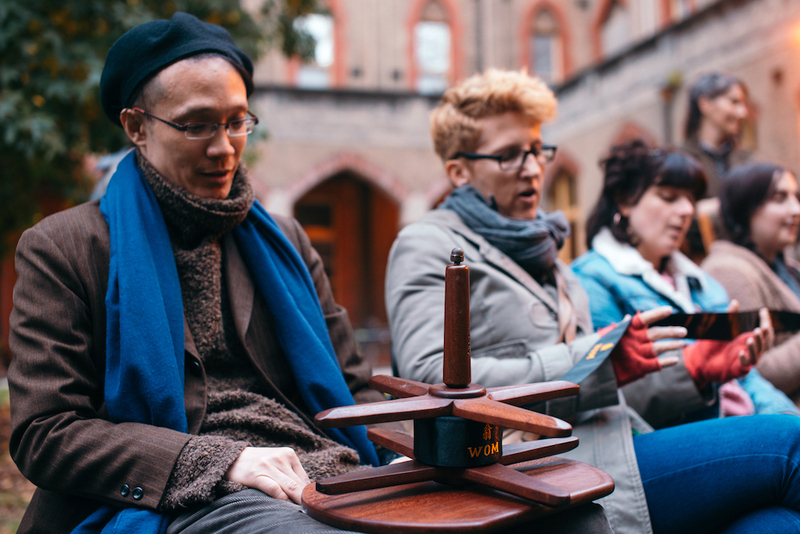 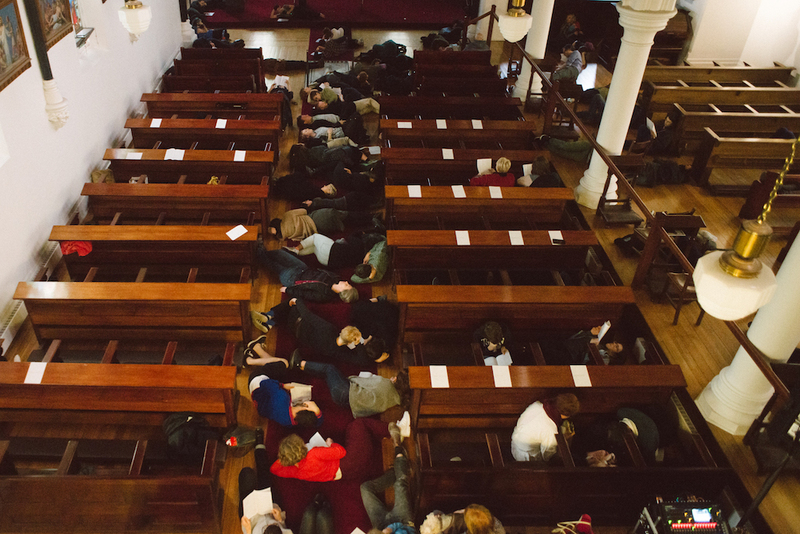 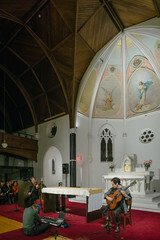 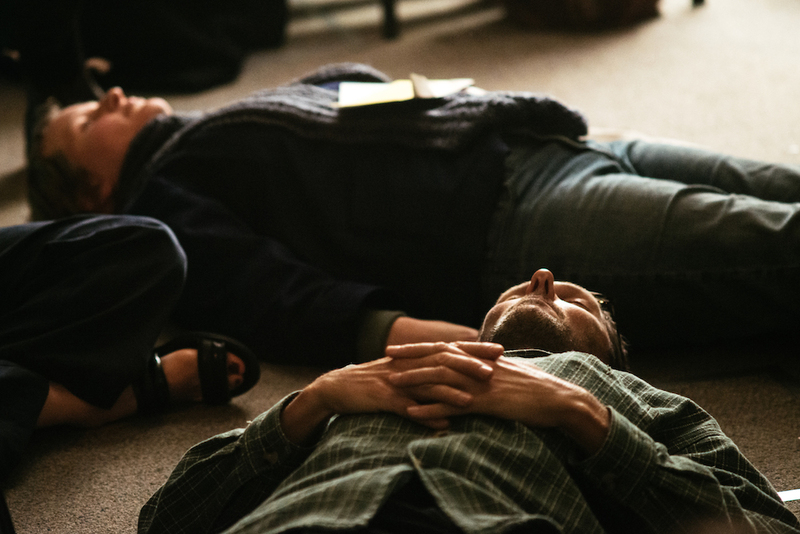 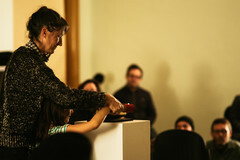 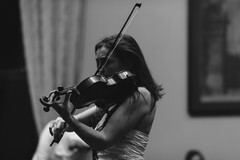 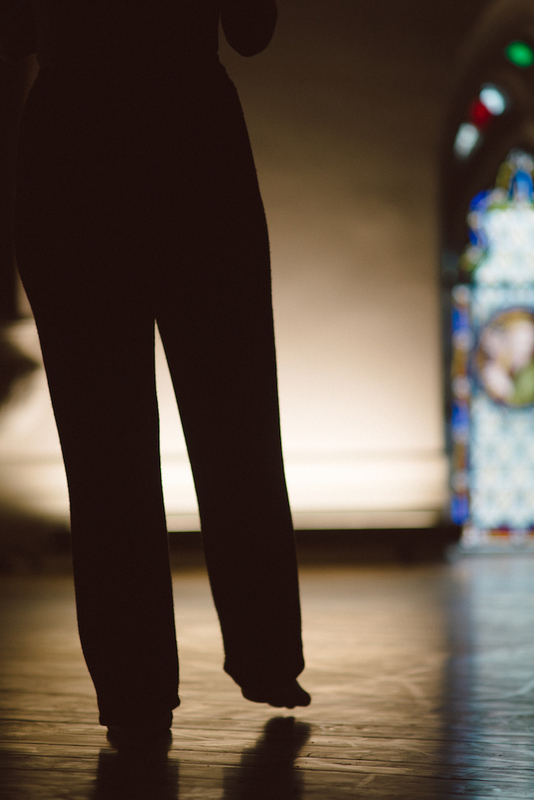 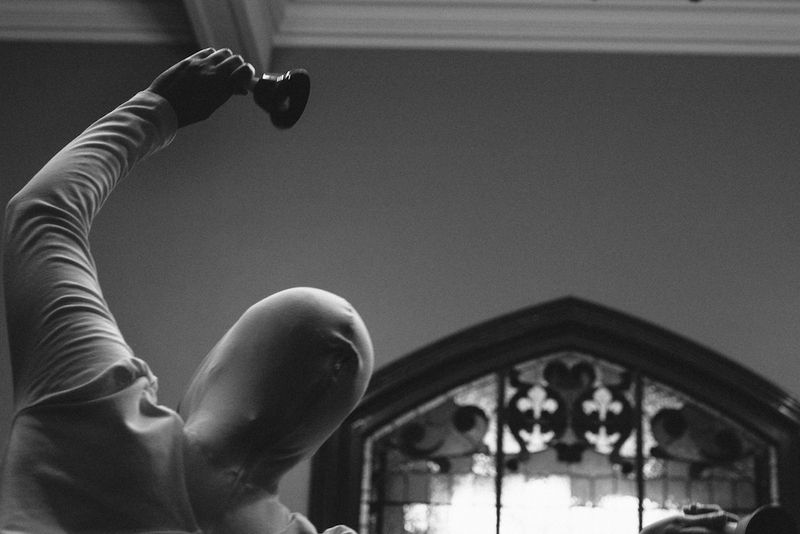 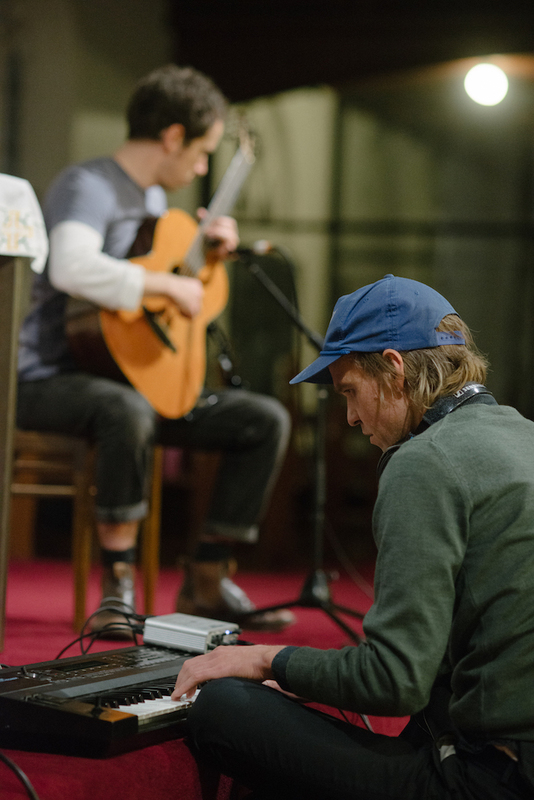 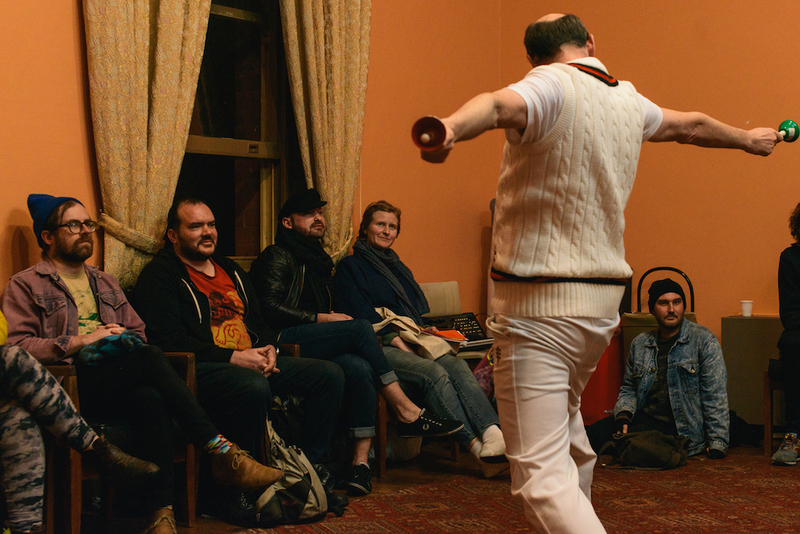 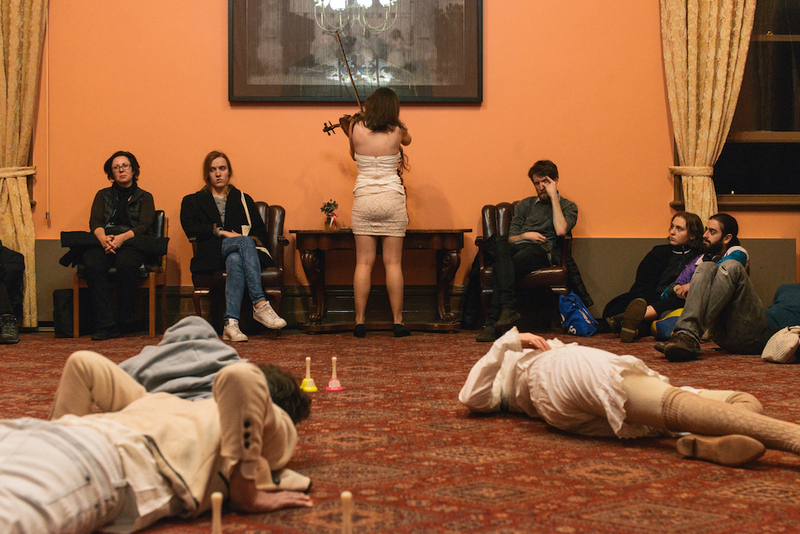 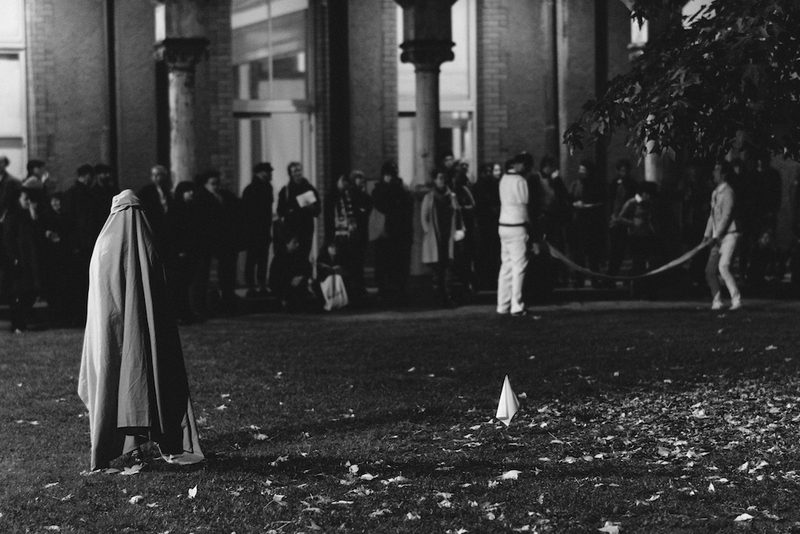 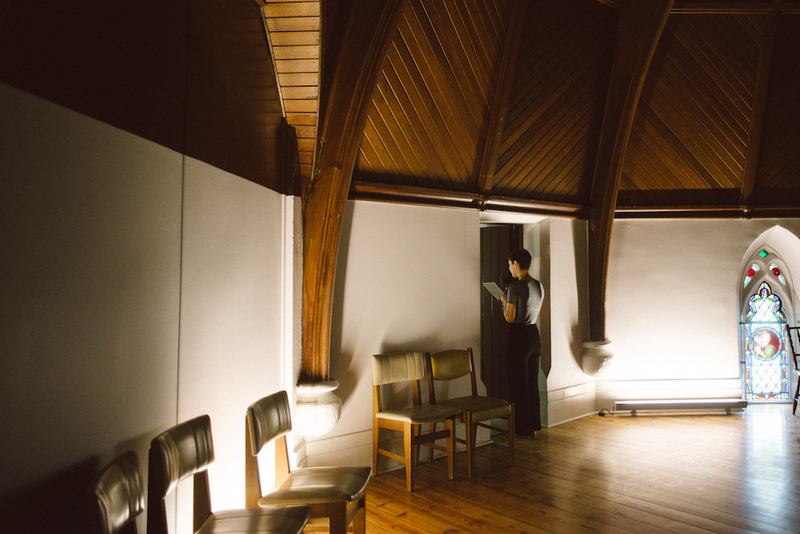 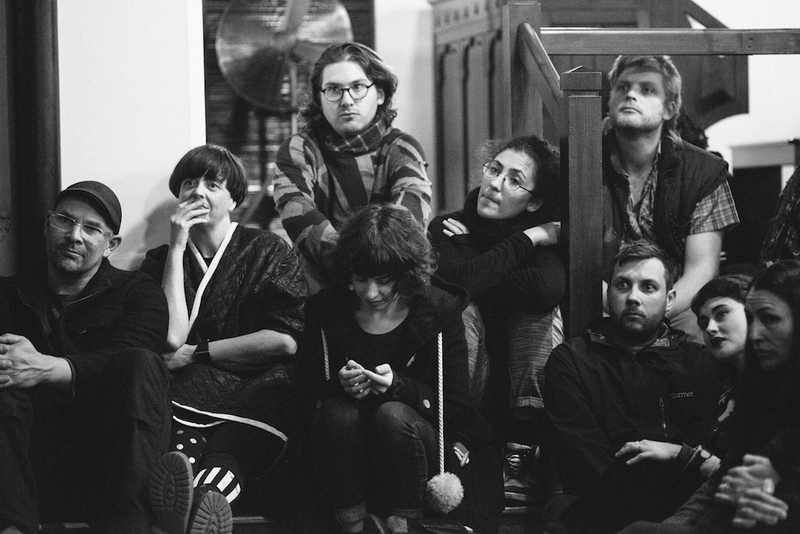 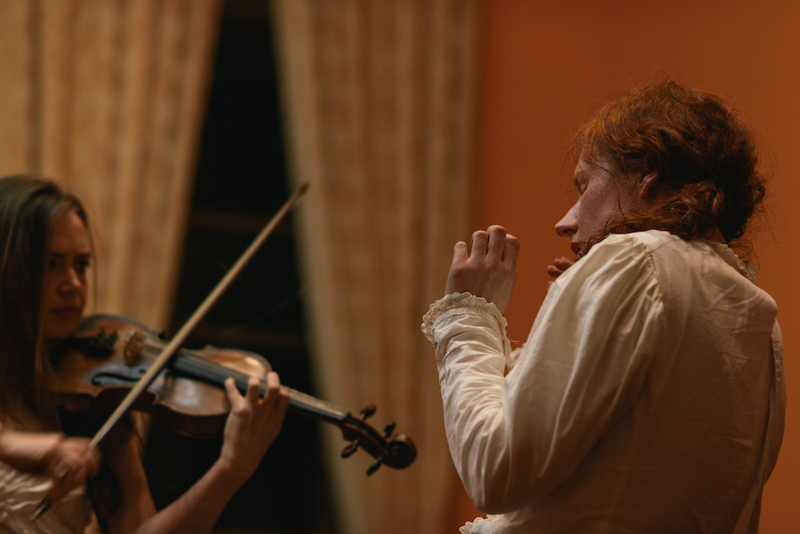 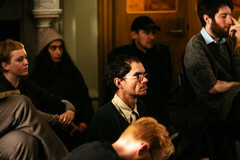 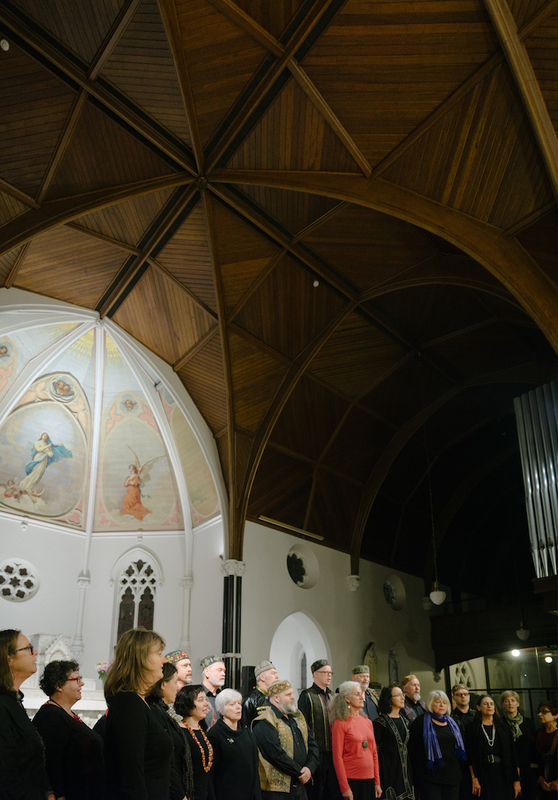 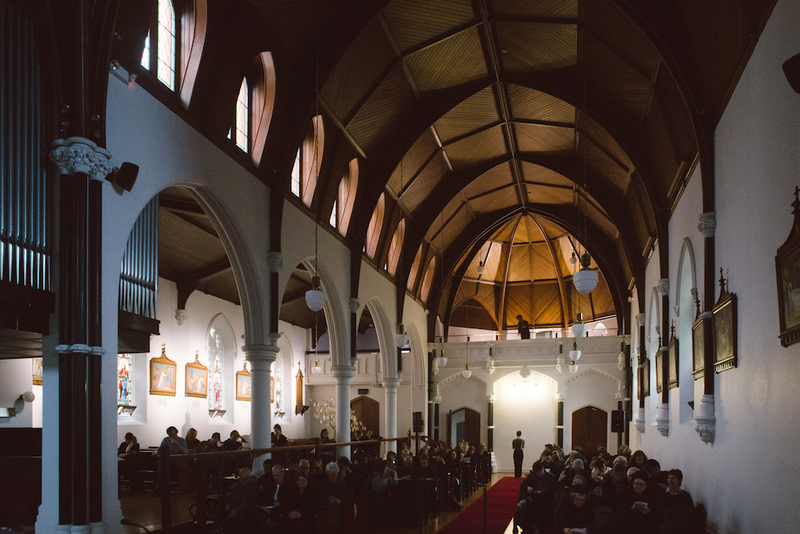 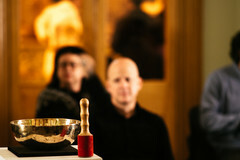 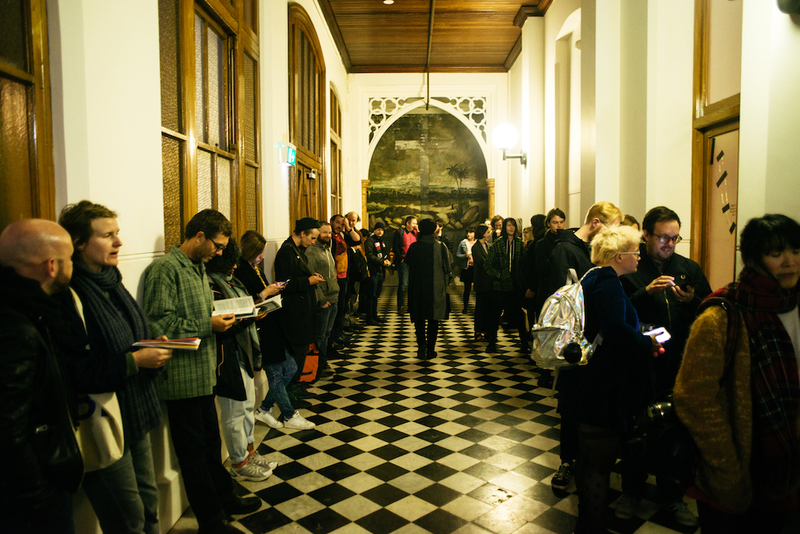 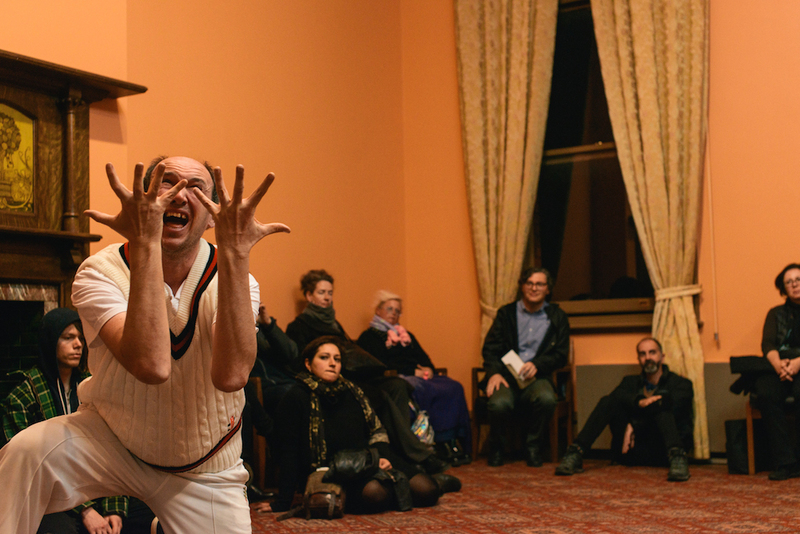 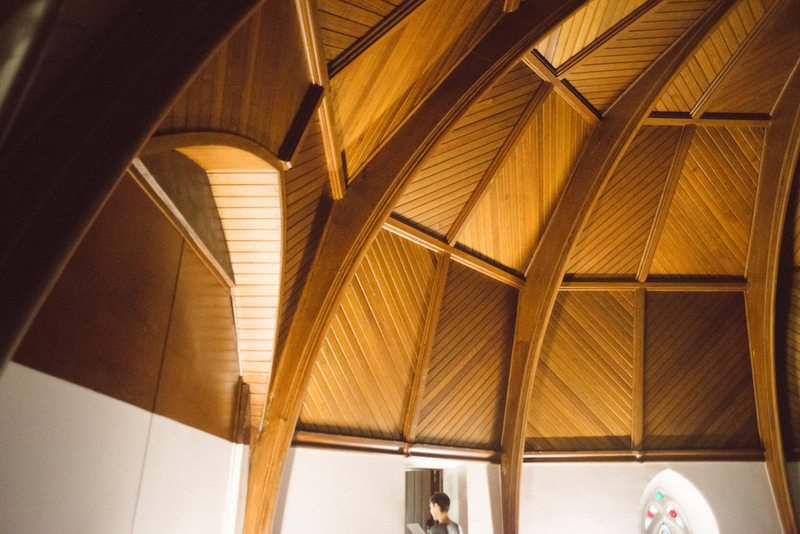 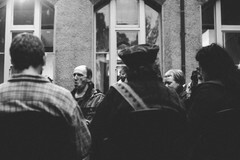 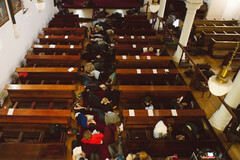 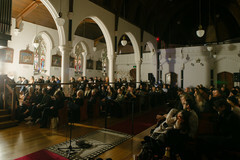 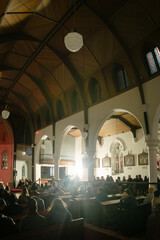 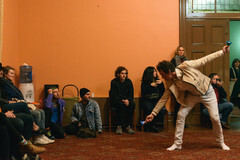 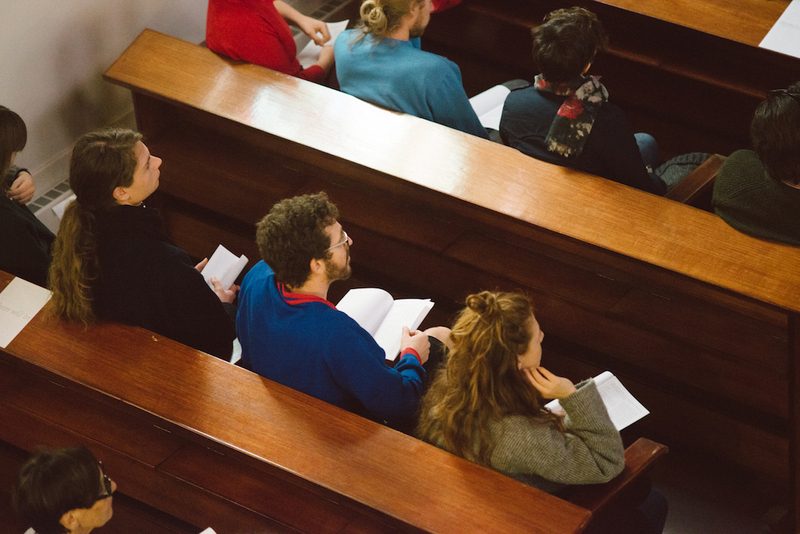 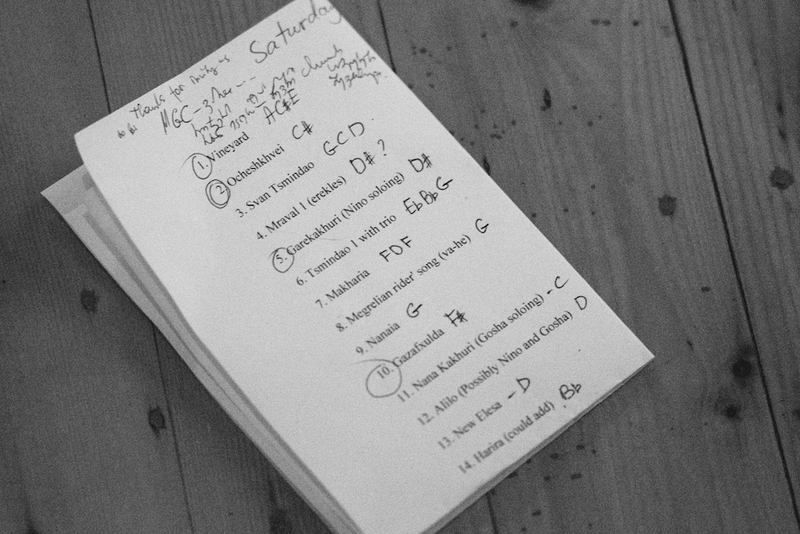 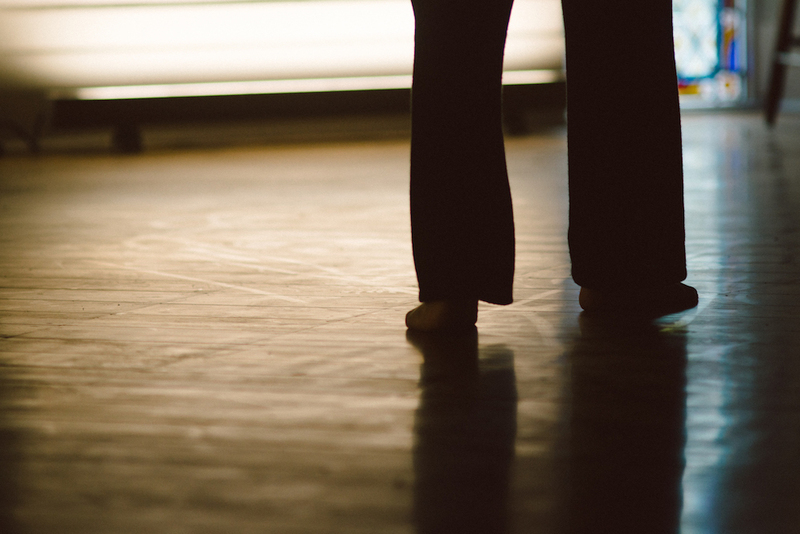 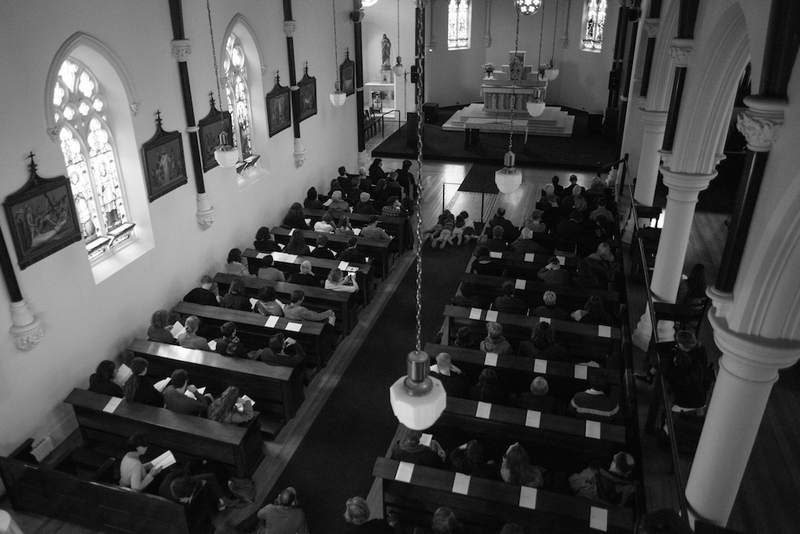 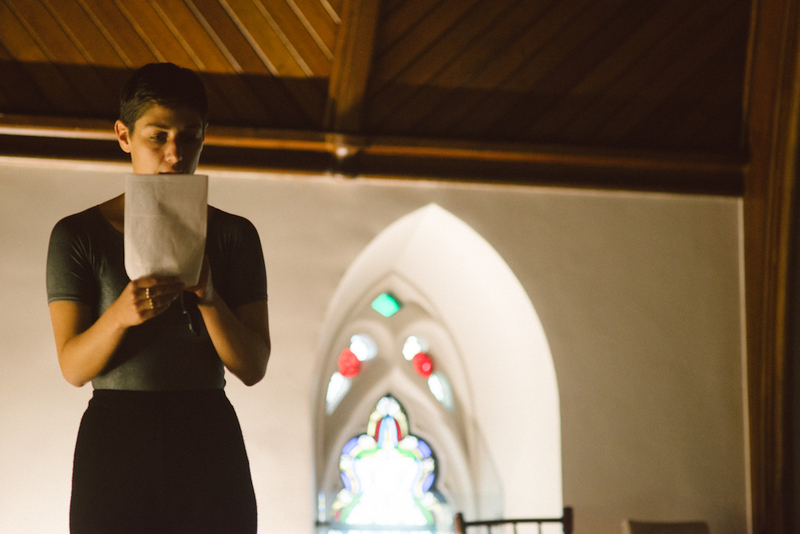 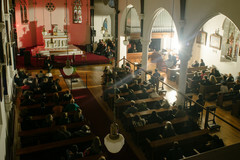 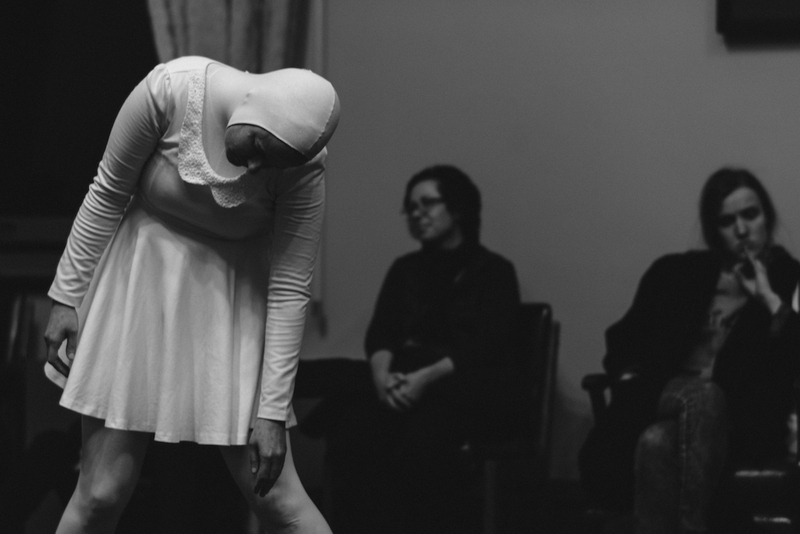 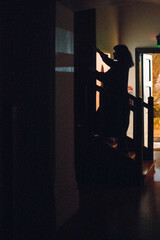 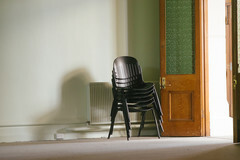 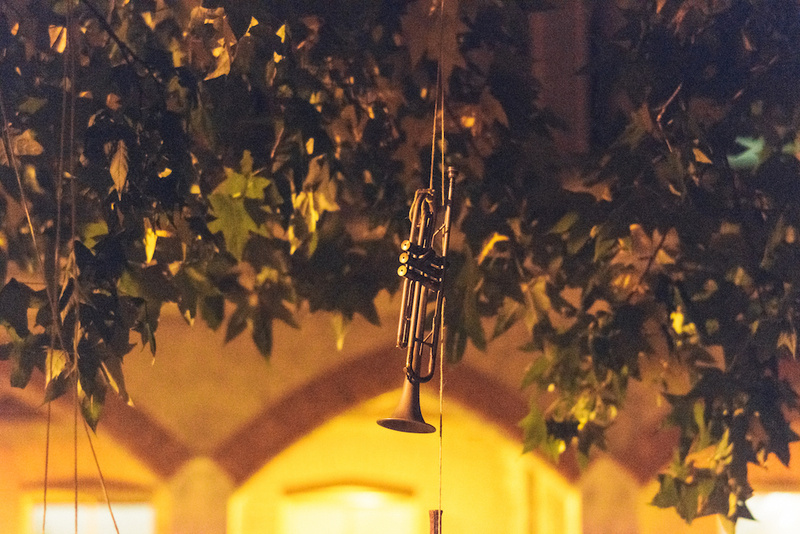 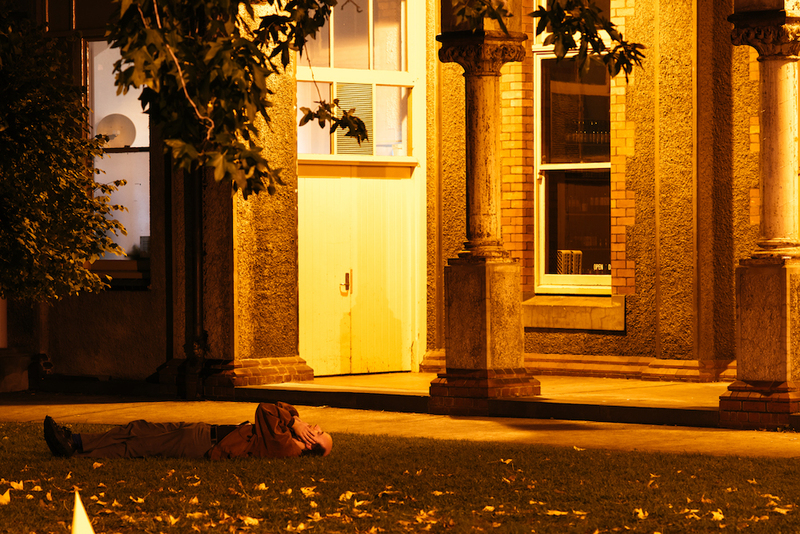 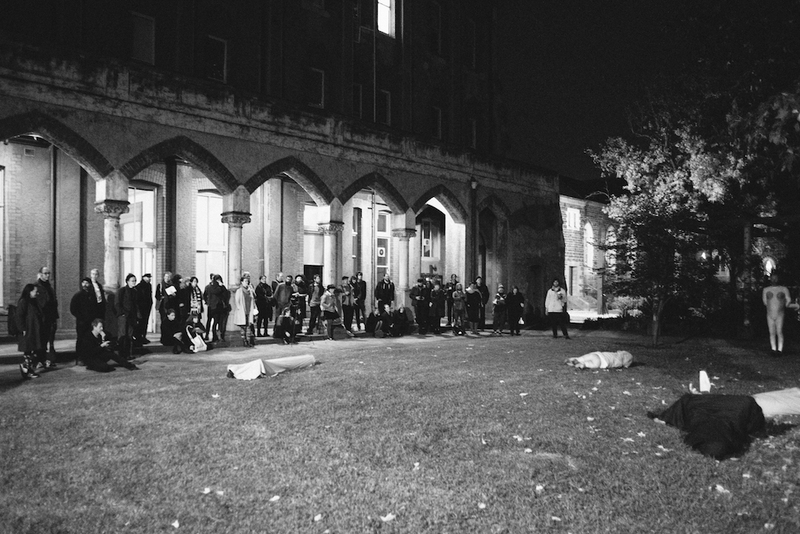 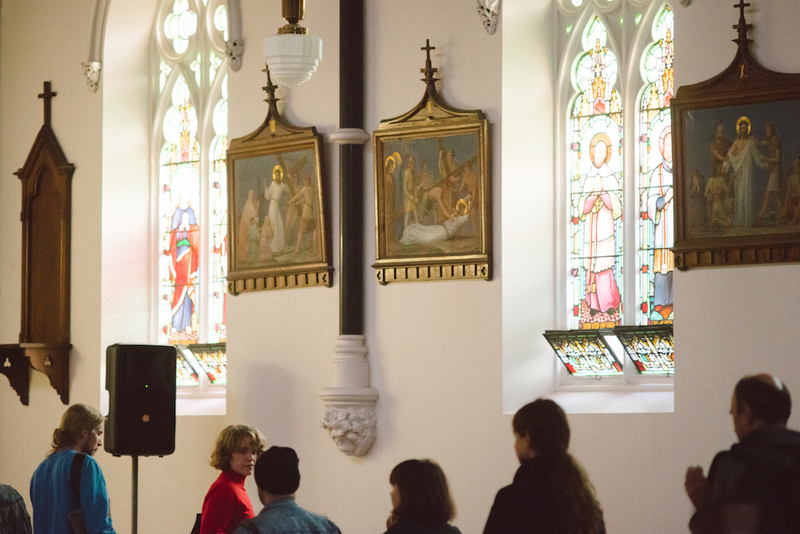 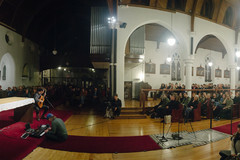 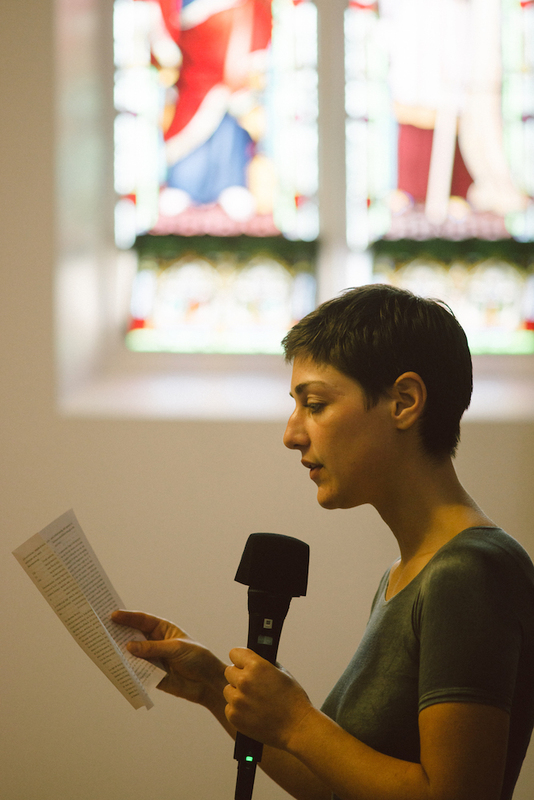 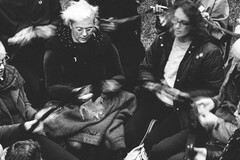 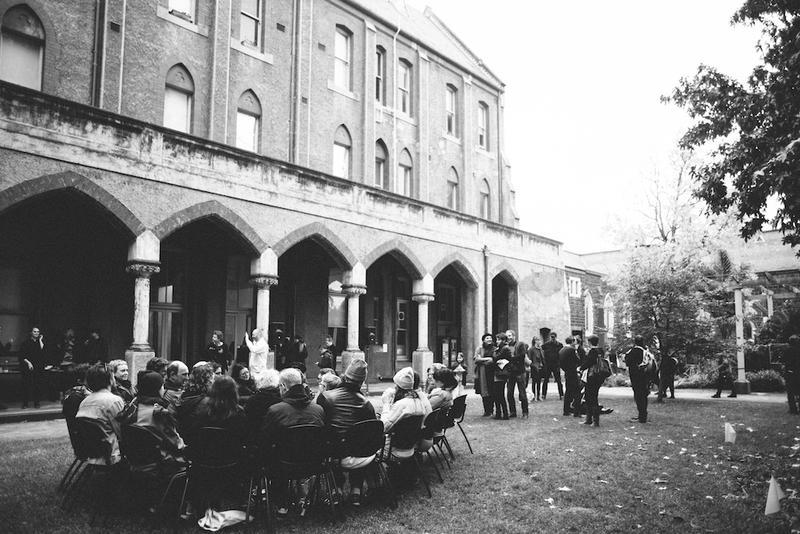 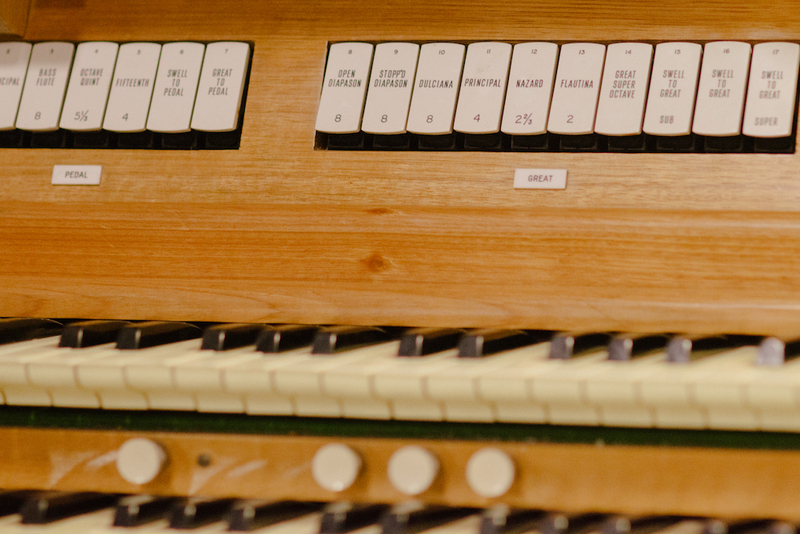 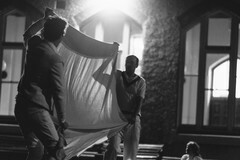 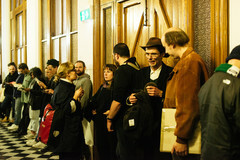 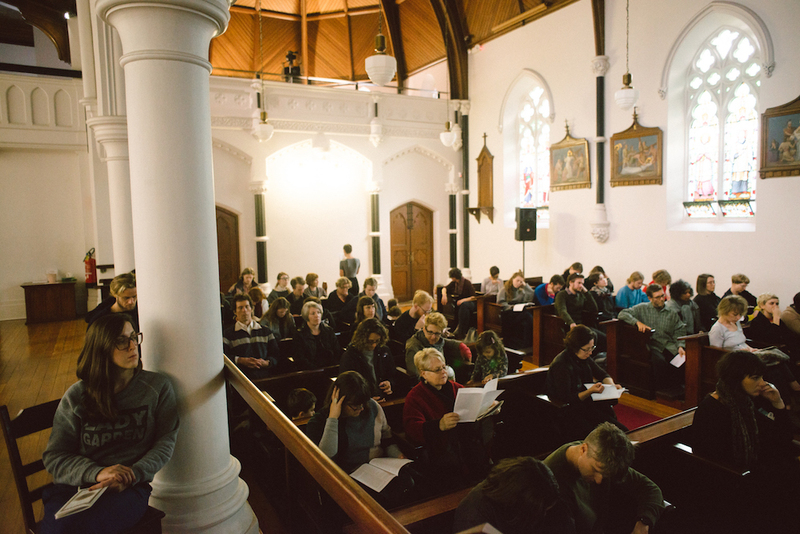 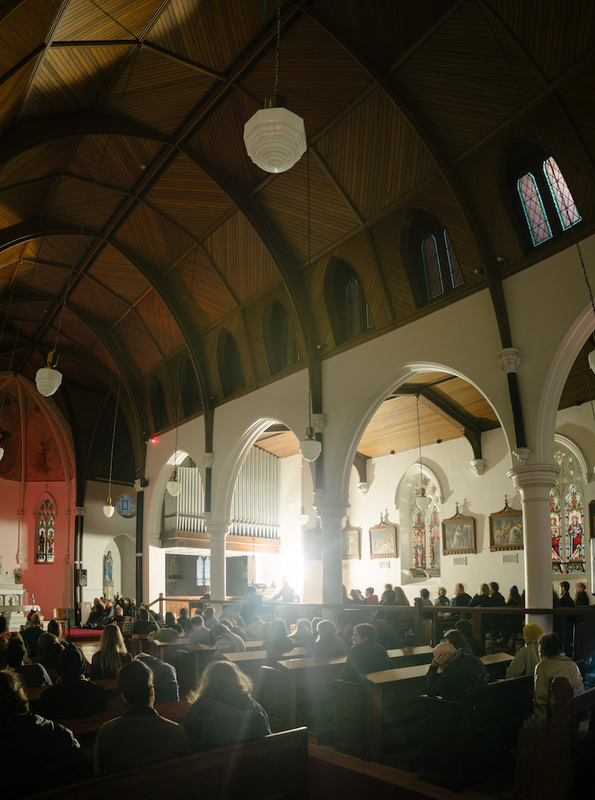 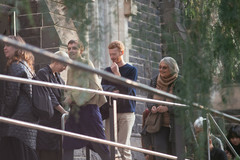 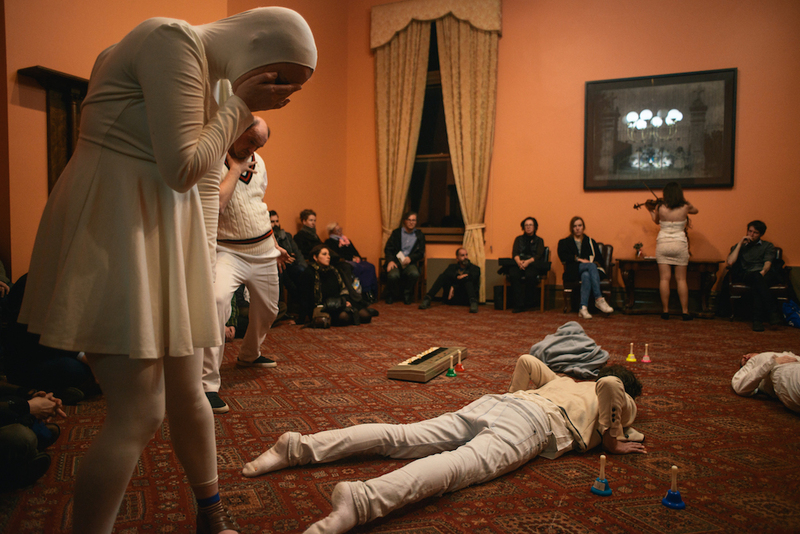 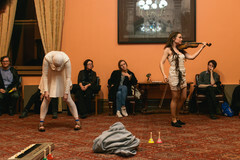 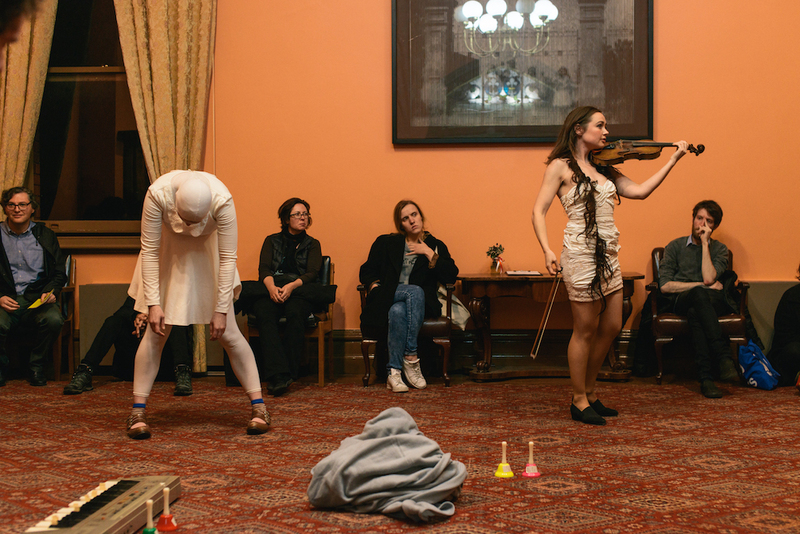 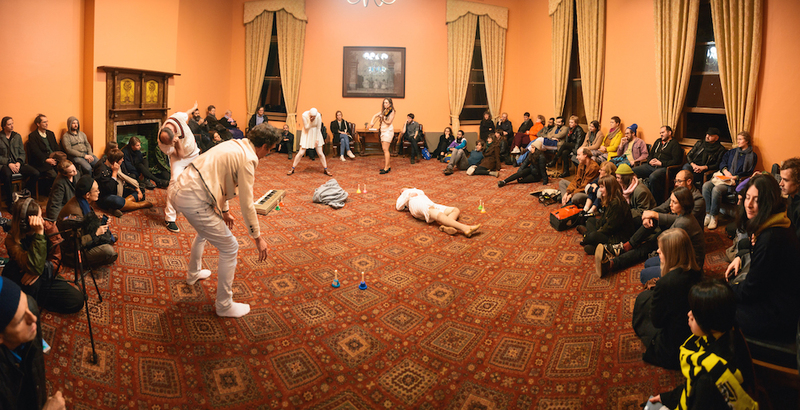 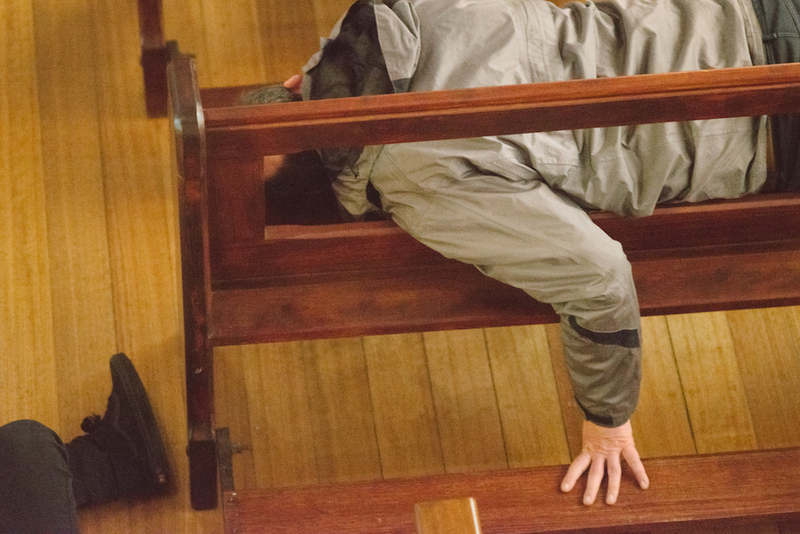 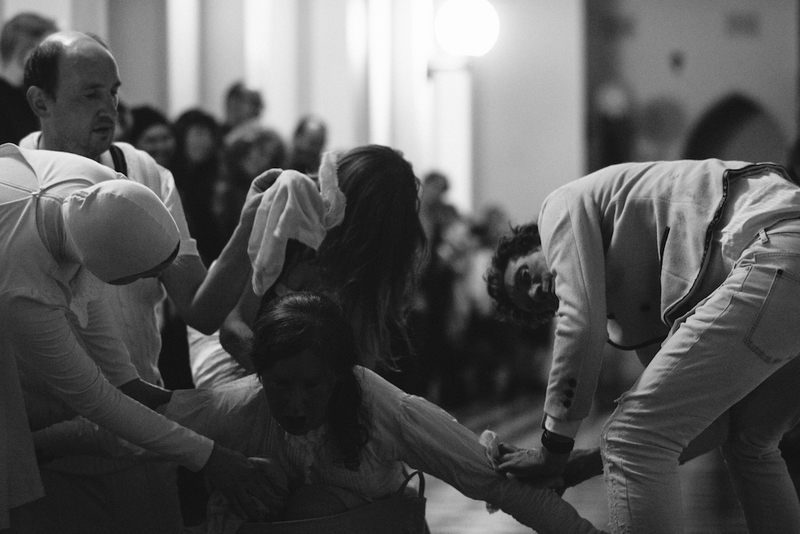 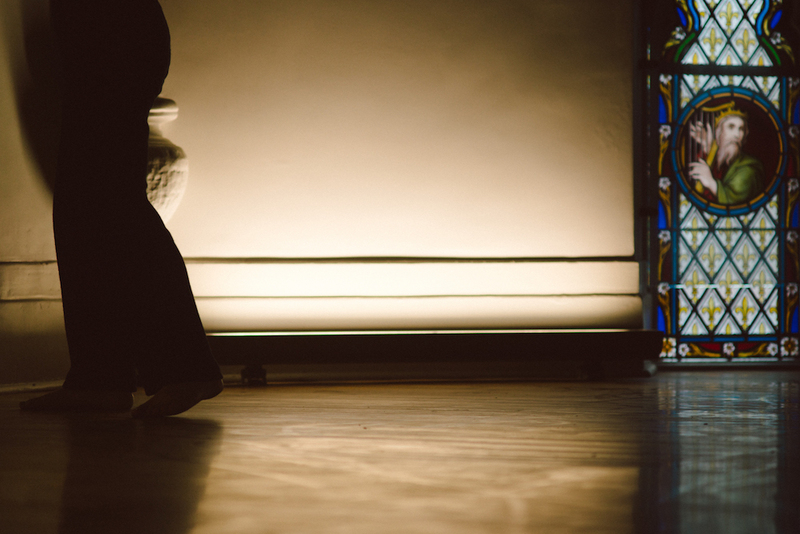 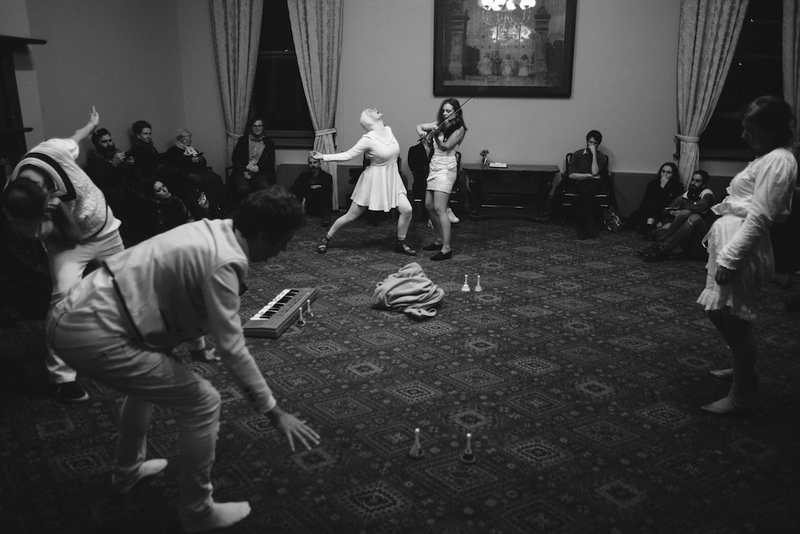 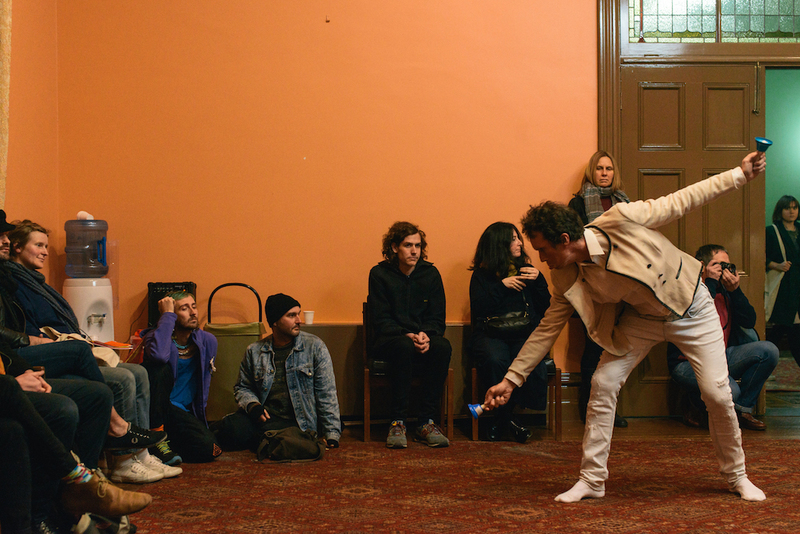 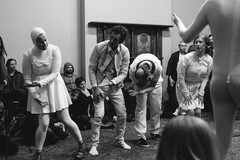 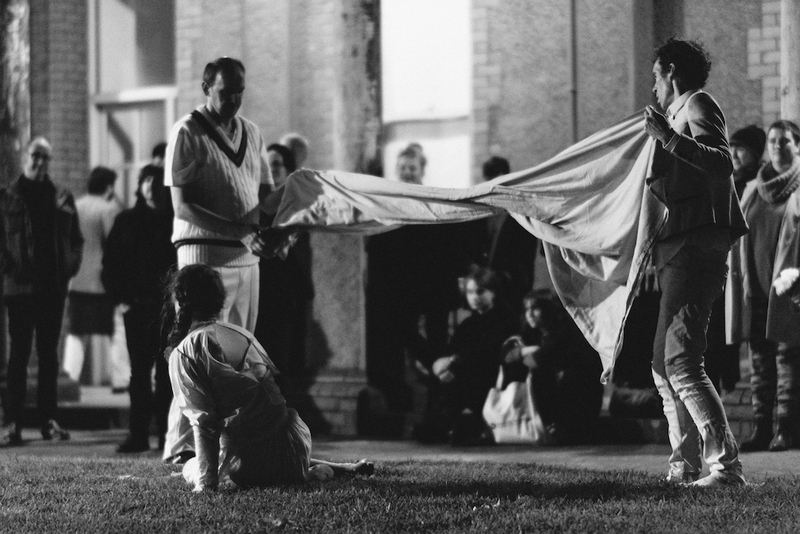 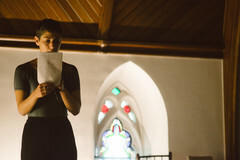 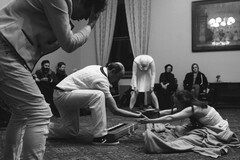 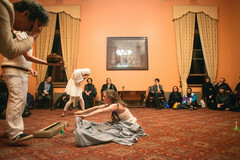 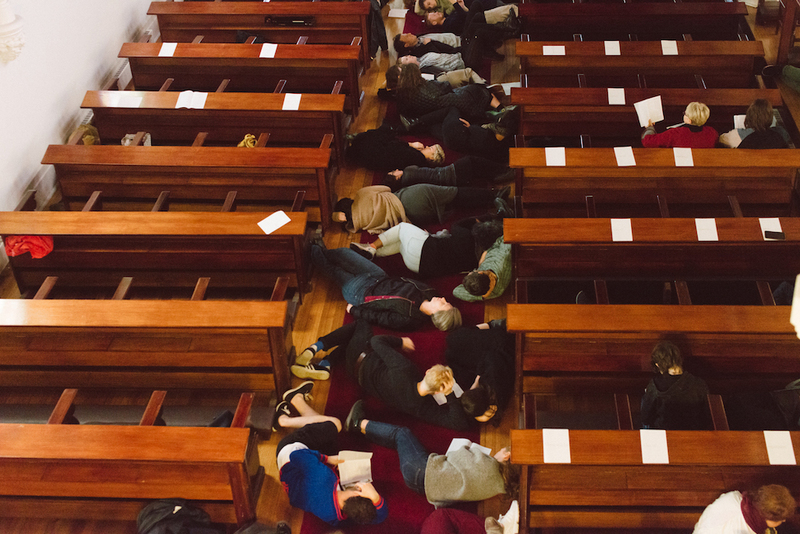 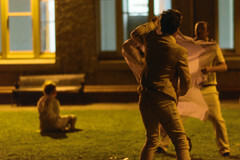 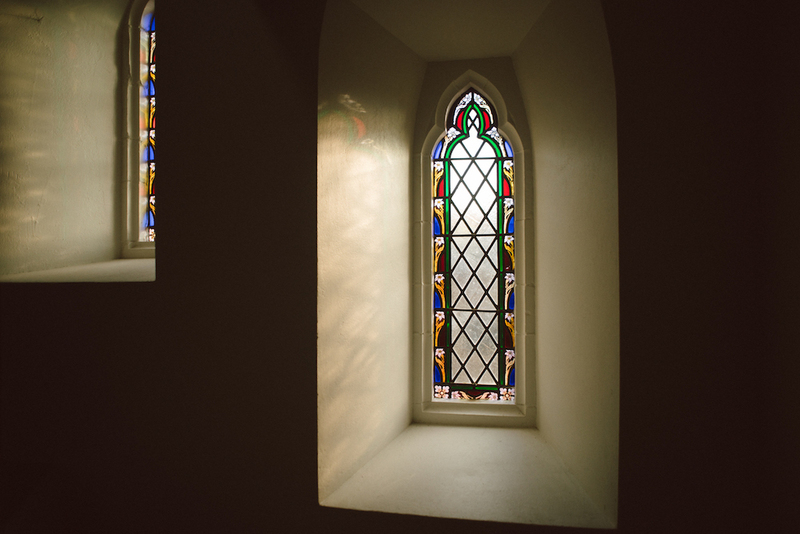 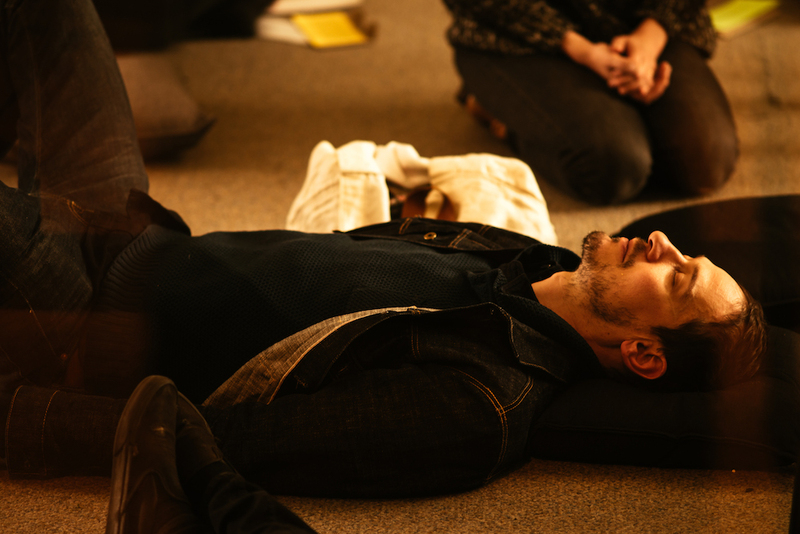 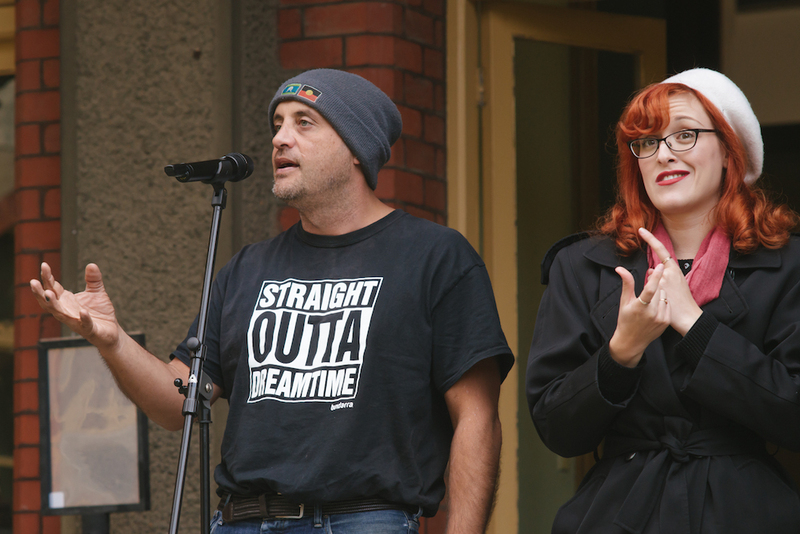 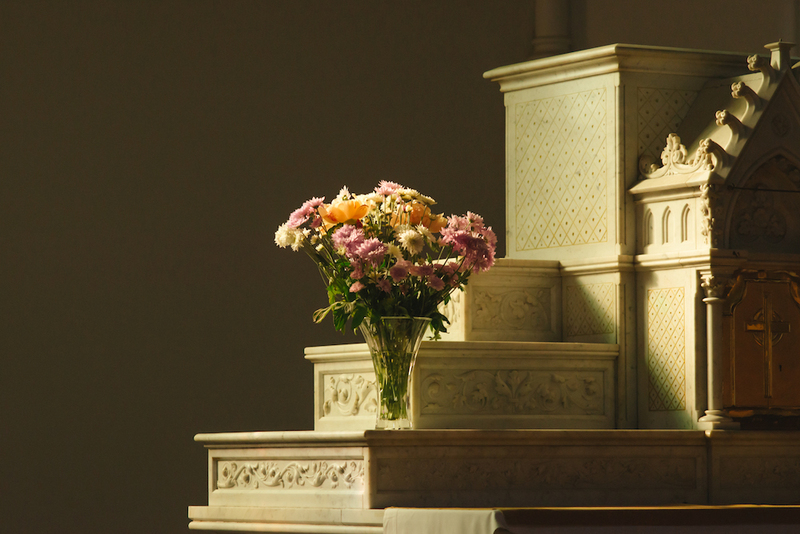 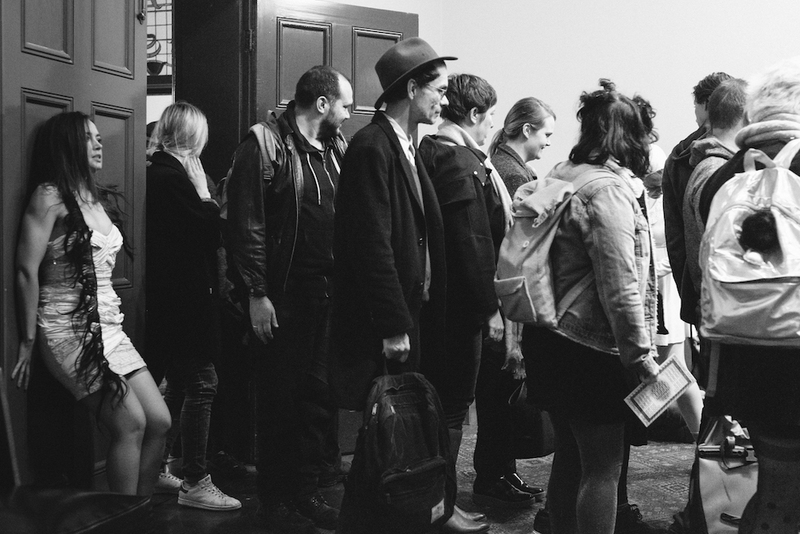 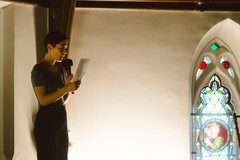 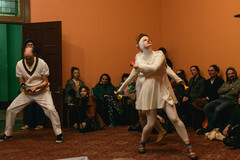 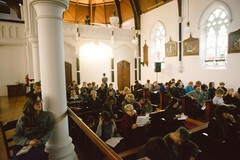 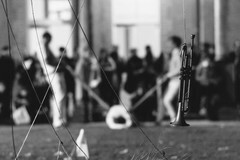 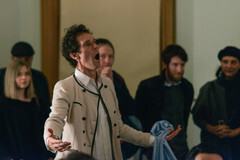 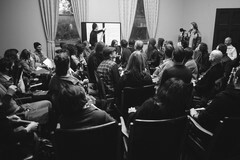 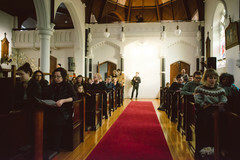 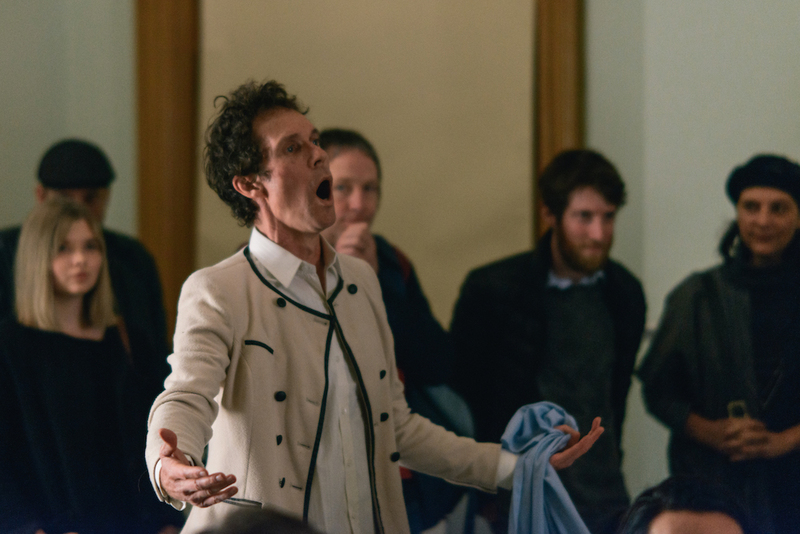 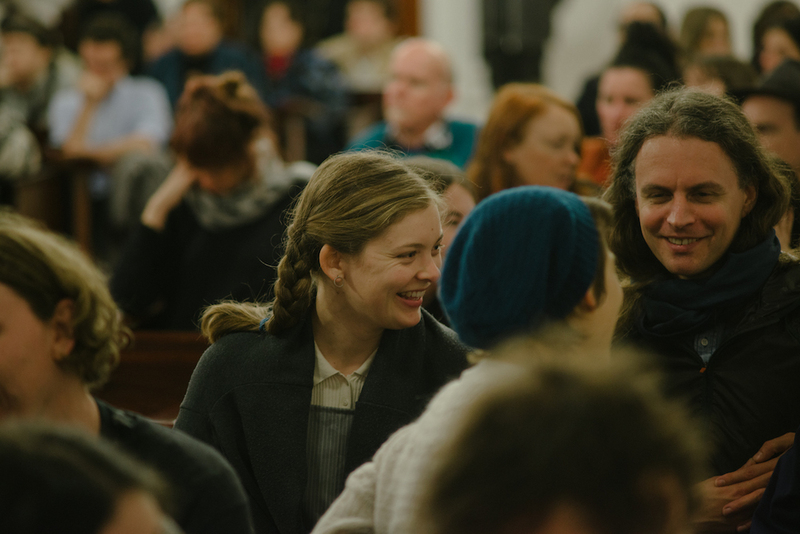 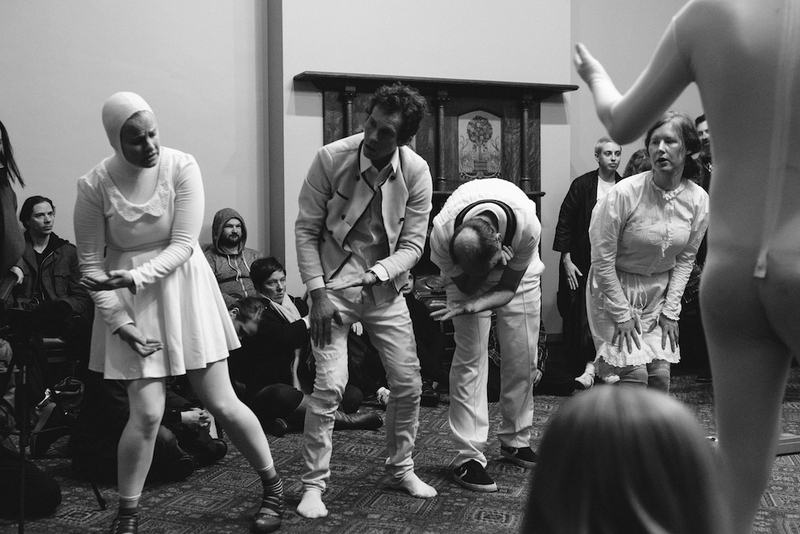 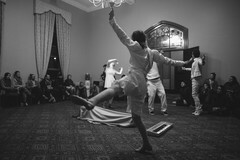 The first ‘Polyphonic Social’ event sees three performances held in The Good Shepherd Chapel. 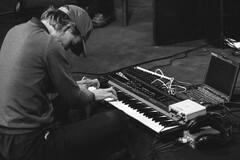 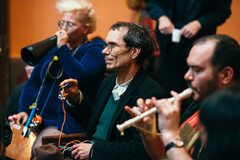 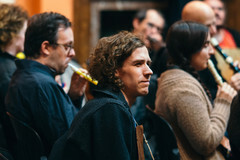 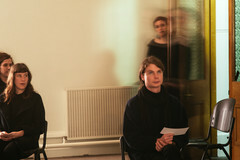 Erkki Veltheim, Rohan Drape and Alex Garsden (of Inland Concert Series) who open the program with a new 15 minute antiphonal work for instruments and computers; fragments of sonic things created independently. 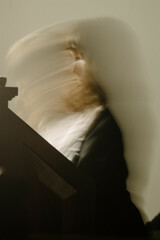 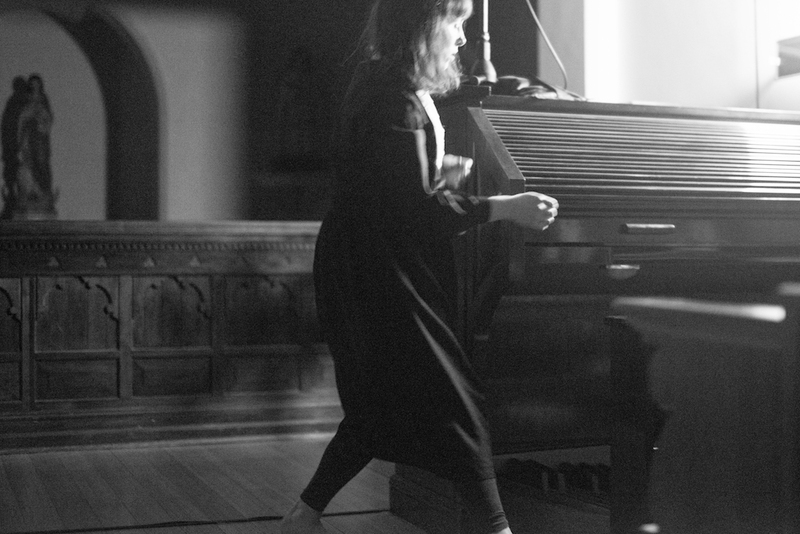 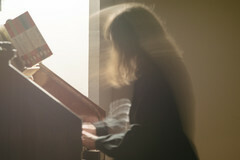 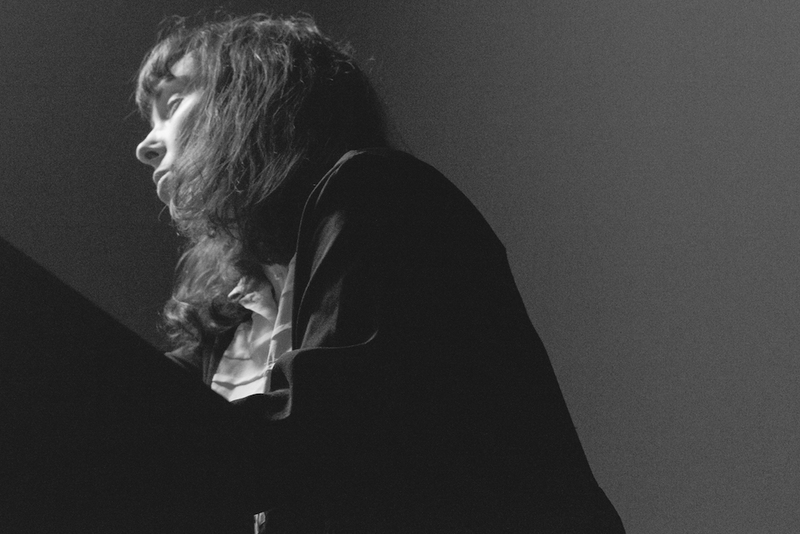 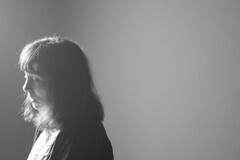 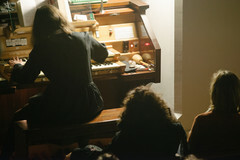 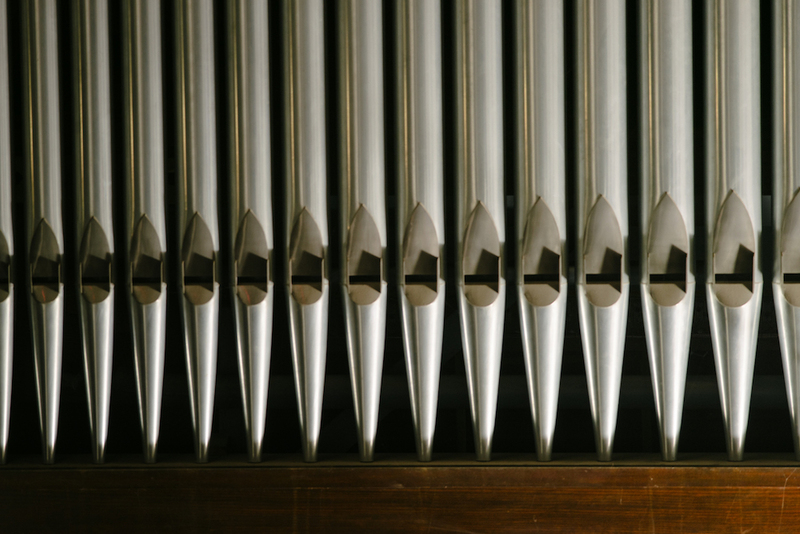 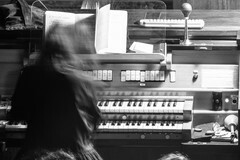 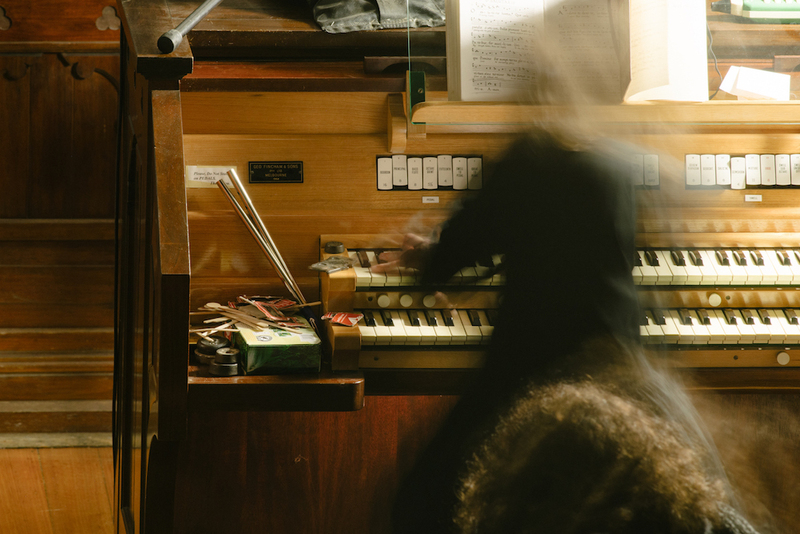 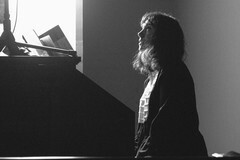 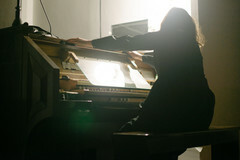 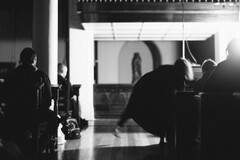 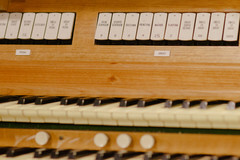 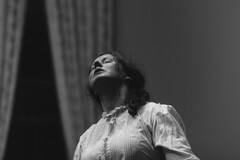 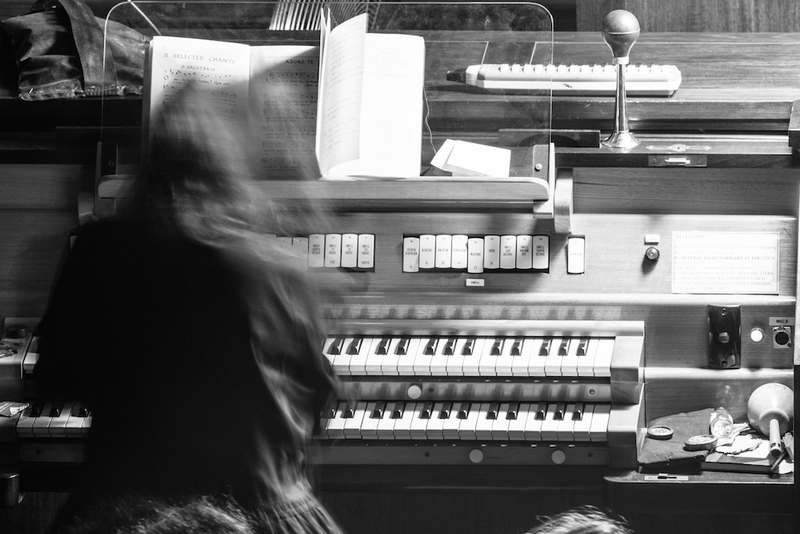 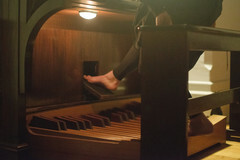 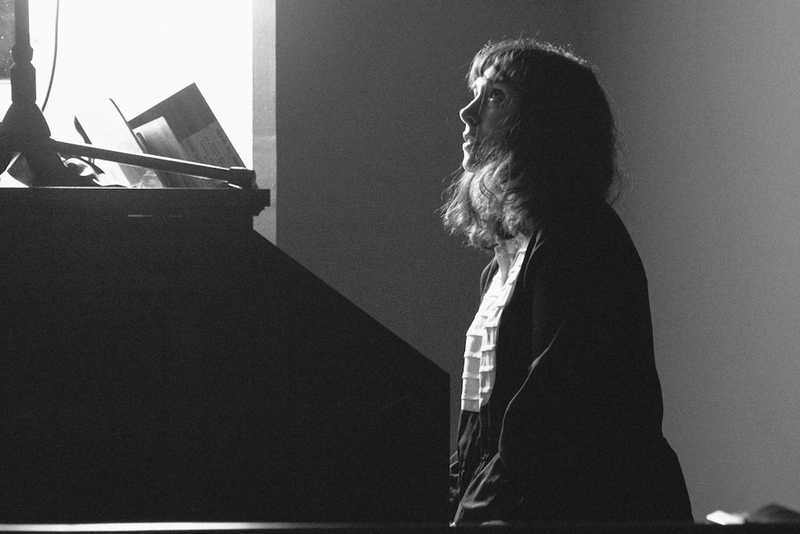 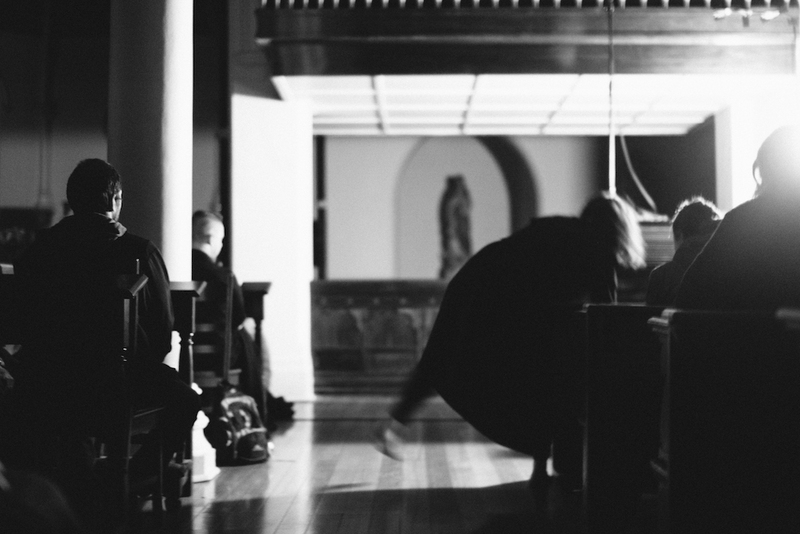 Making her Australian debut, Irish musician Áine O’Dwyer will draw on both traditional and avant-garde music and her unique specialisation for improvisation on church organs. 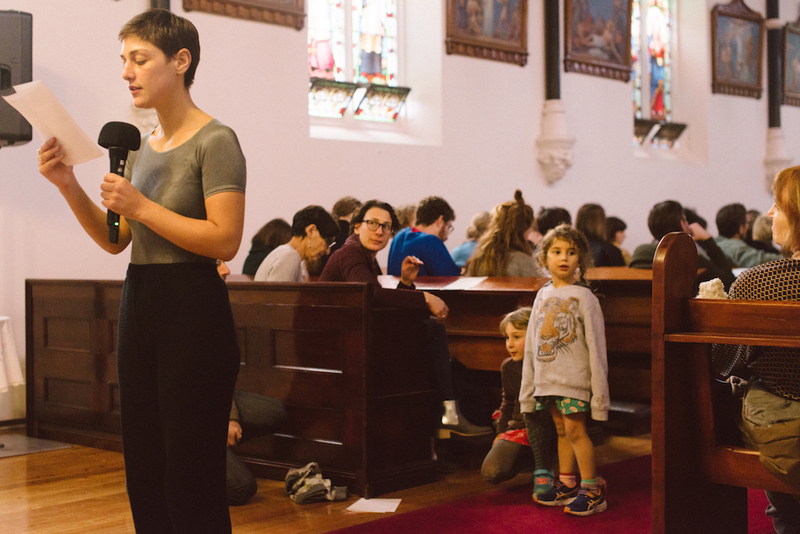 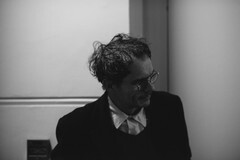 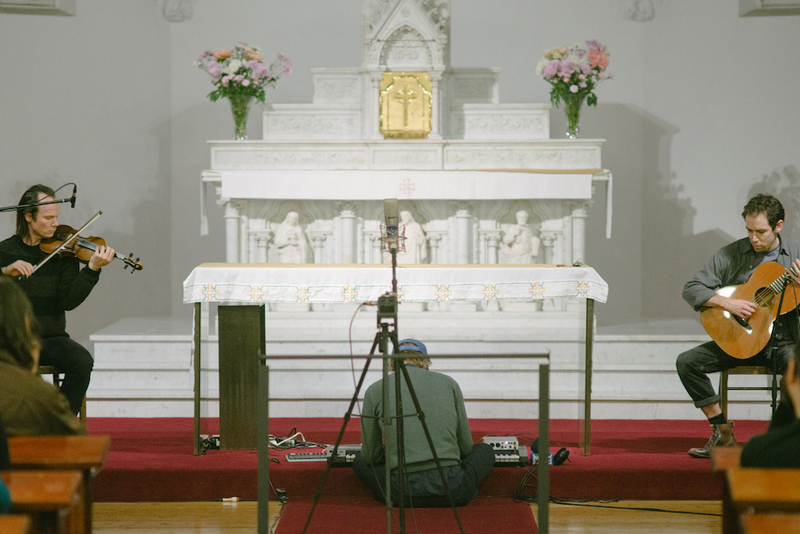 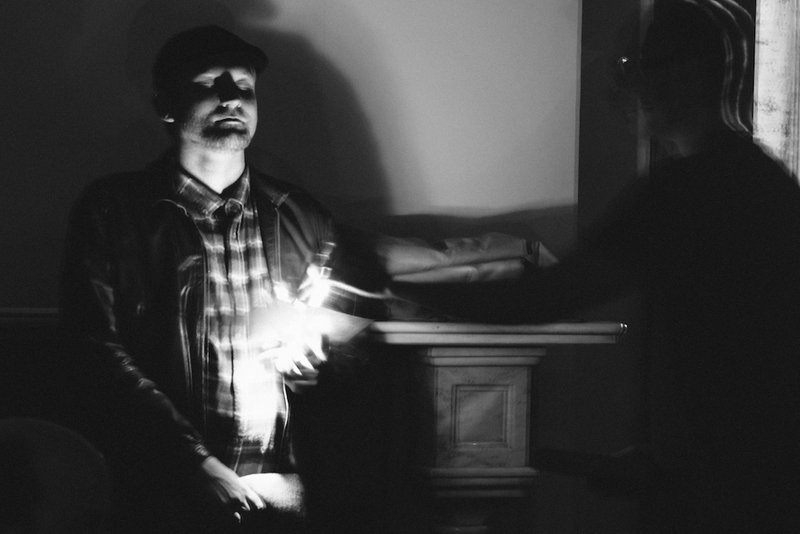 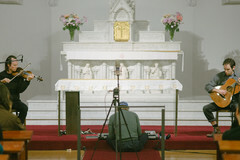 This performance follows the release of O’Dwyer’s multilayered magnum opus ‘Music for Church Cleaners vol. 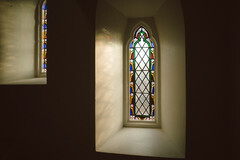 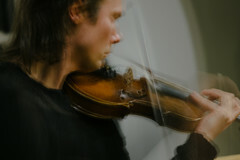 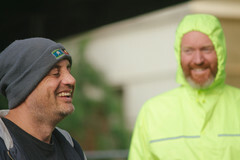 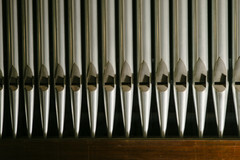 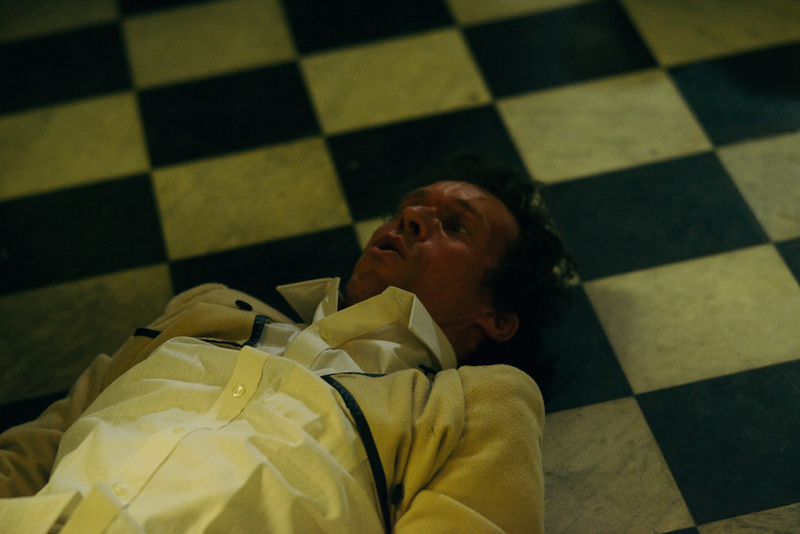 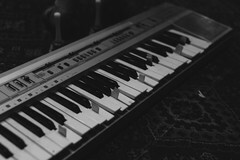 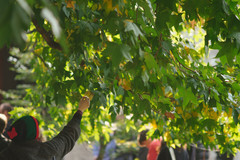 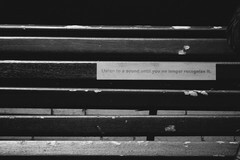 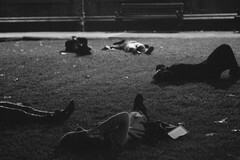 I & II’ (recorded in St. Mark’s Church in Islington, London). 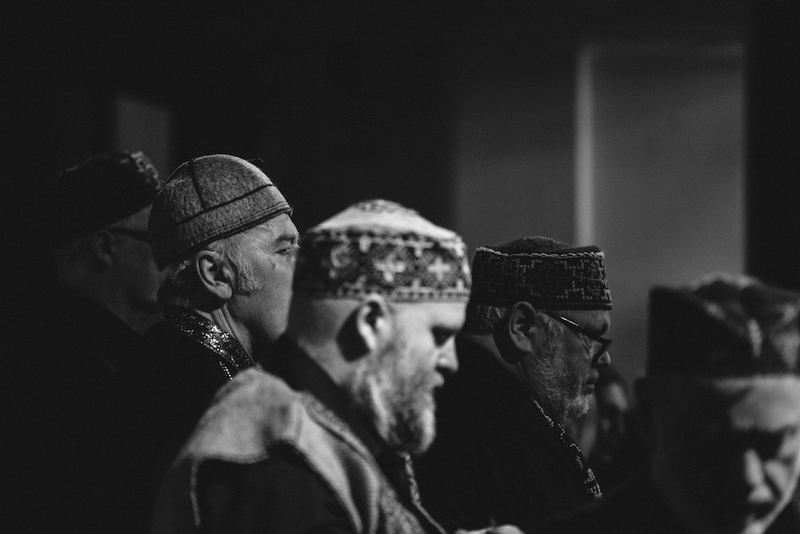 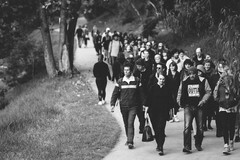 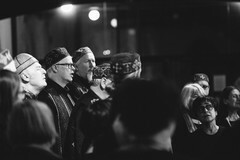 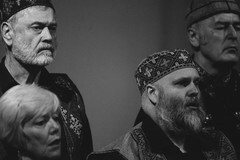 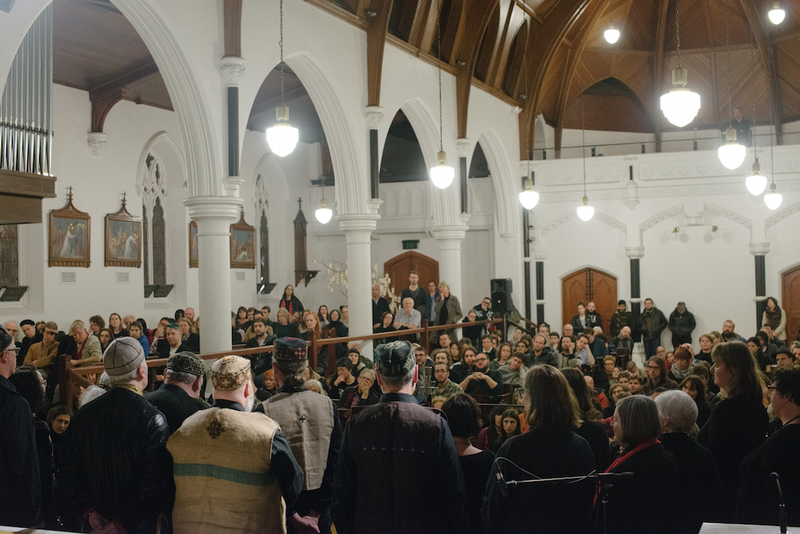 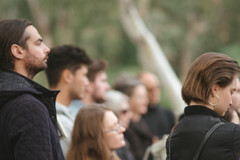 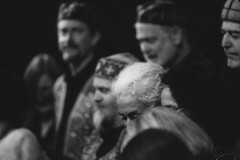 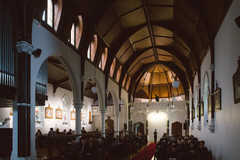 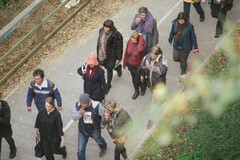 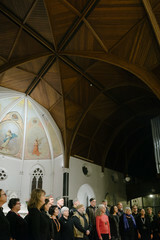 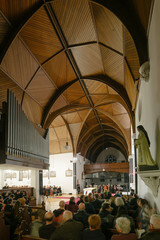 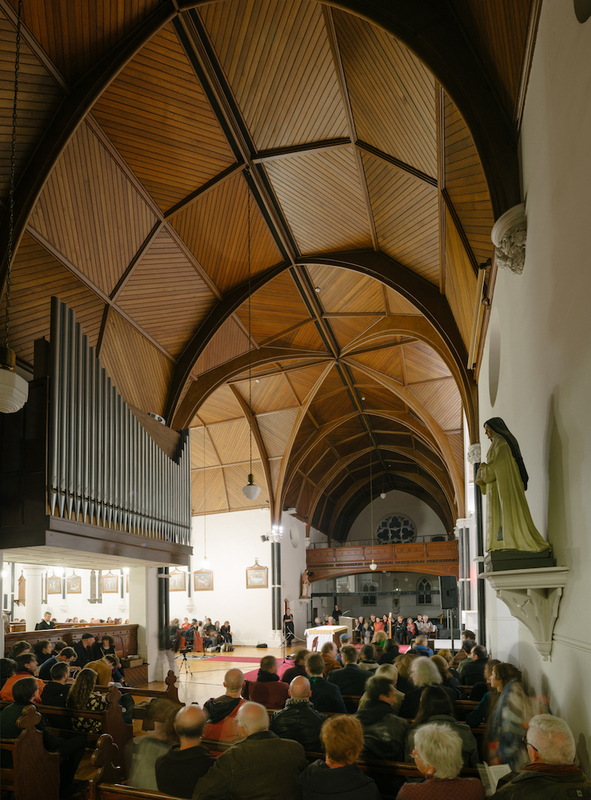 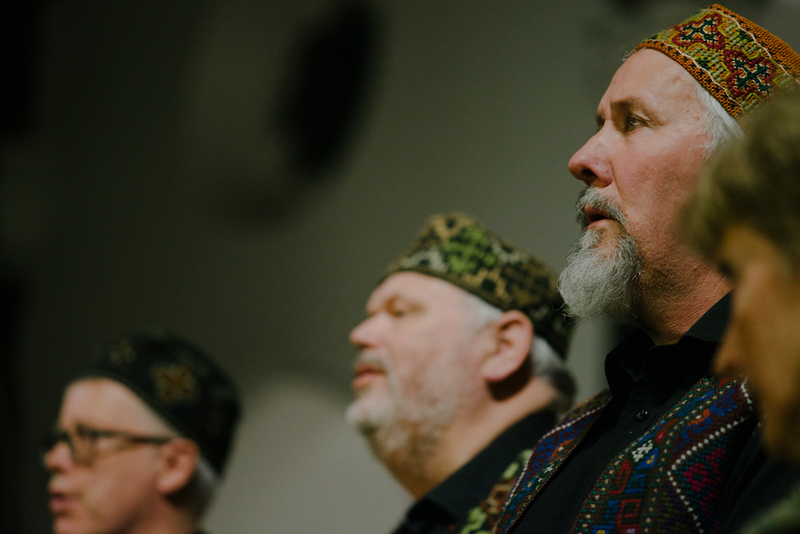 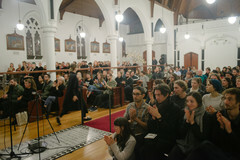 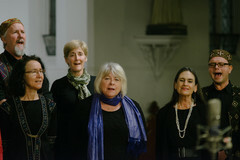 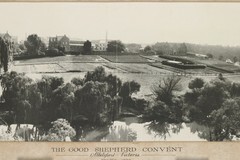 The Melbourne Georgian Choir (MGC) will also perform, led by celebrated Georgian-Australian ethnomusicologists, Dr Nino Tsitsishvili and Dr Joseph Jordania. 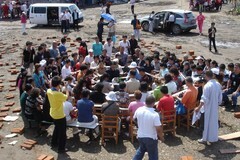 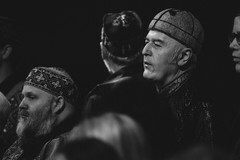 The choir features 20 vocalists singing together in the rich Georgian polyphonic tradition which dates back to at least the 4th century AD. 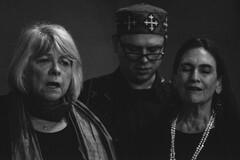 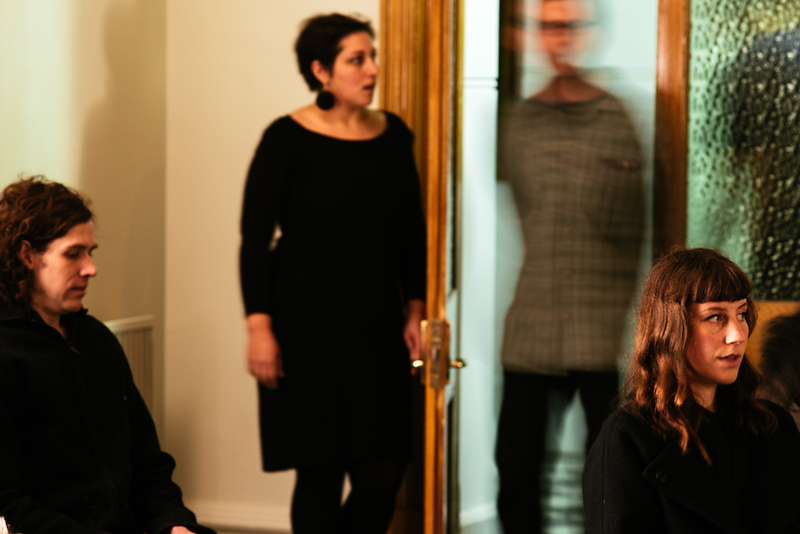 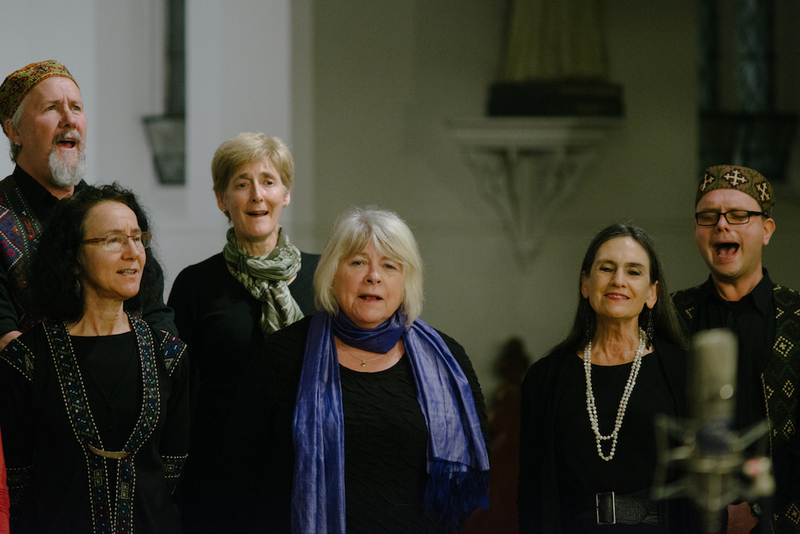 The choir will perform challenging works from its repertoire, with an emphasis on strange tones, shifting drones, clashing dissonances and outré scales. 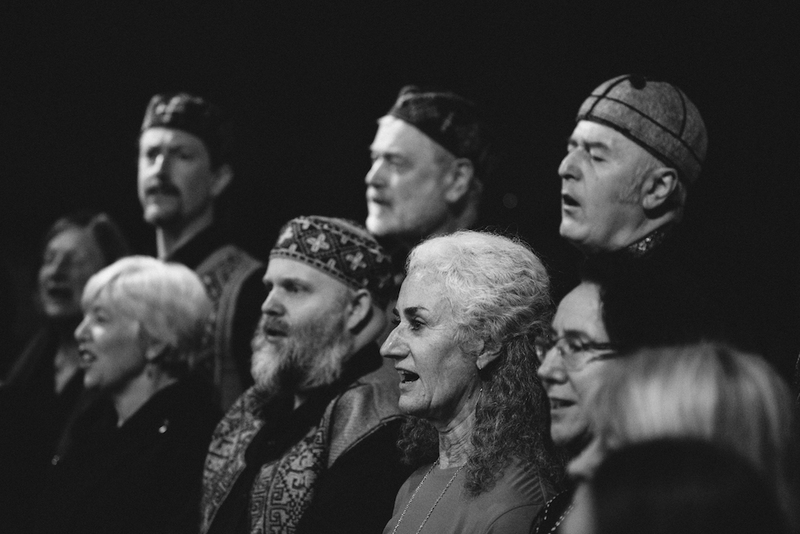 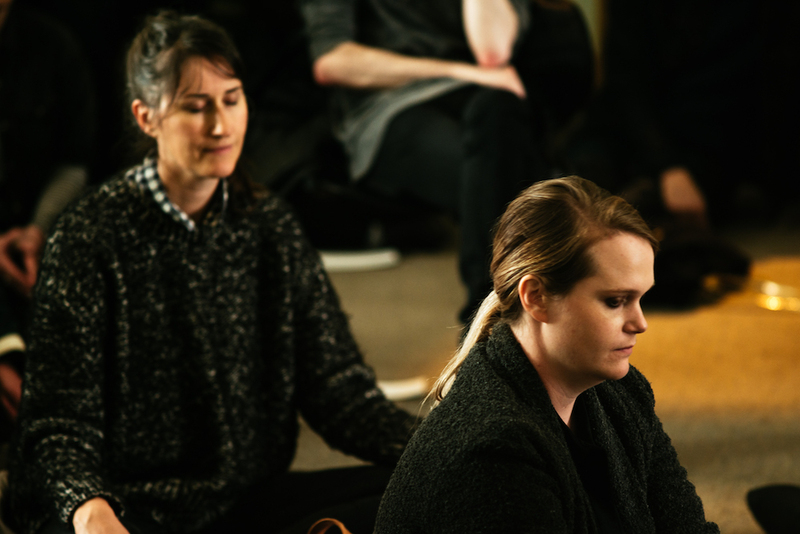 Dr Jordania of Melbourne University will also speak about the evolutionary roots of human polyphonic singing and it's transformative powers, from preparing soldiers for battle to helping alzheimer sufferers regain their memories. 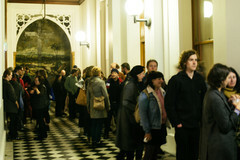 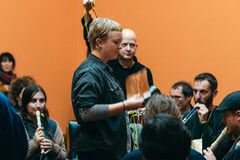 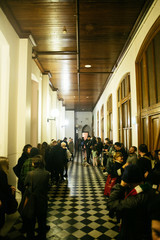 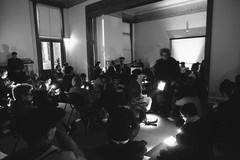 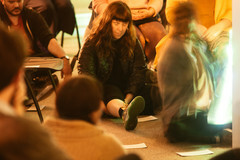 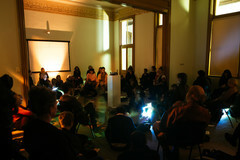 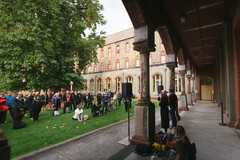 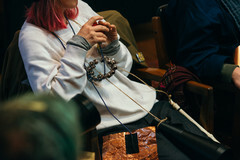 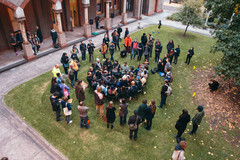 Day two of the ‘Polyphonic Social’ program will see multiple experimental works overlap across times, spaces (tiled halls, salons, parlours, and the Convent’s famed indoor-outdoor in-between zones) and experiences (in sound and listening – moments that invite participation, imagination, and, in the case of one work, a moment to recline). 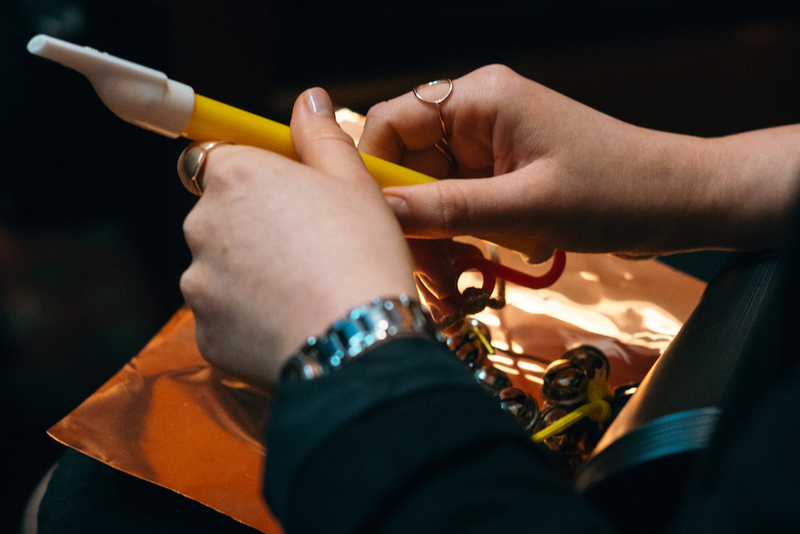 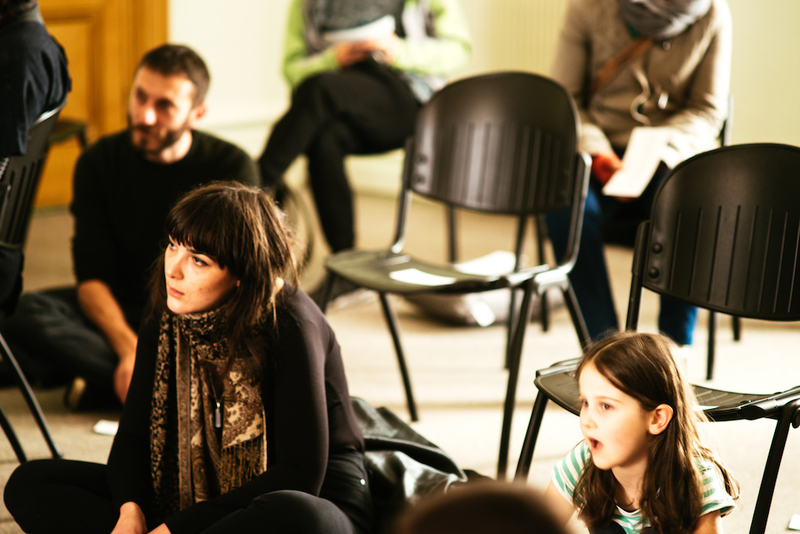 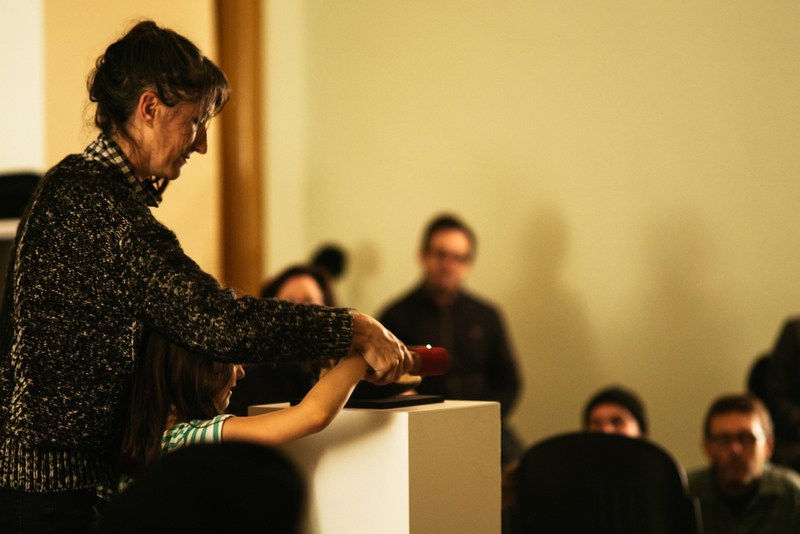 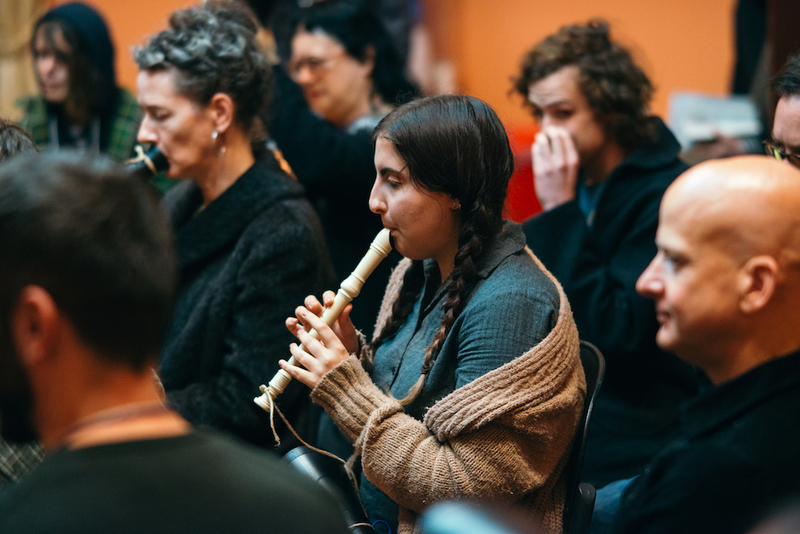 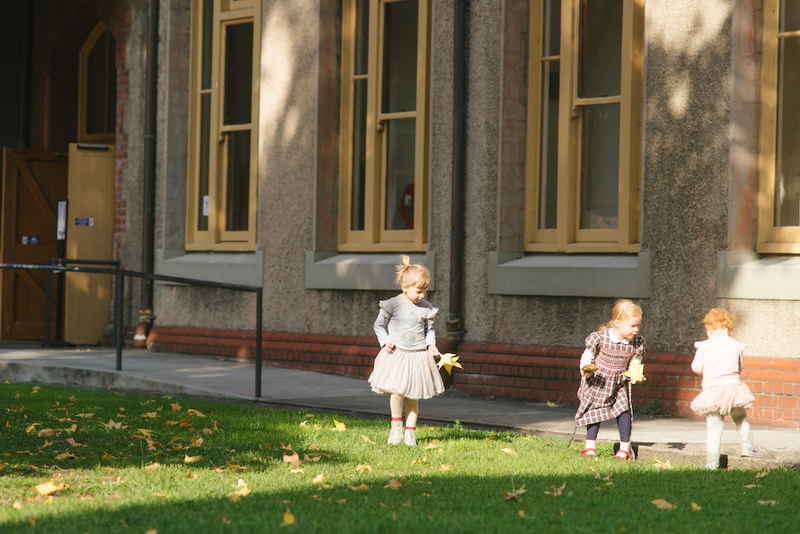 The day will begin with children (and parent) friendly polyvocalities for families on Mother’s Day, with creative activities for voices, hands and ears (10am – 12pm). 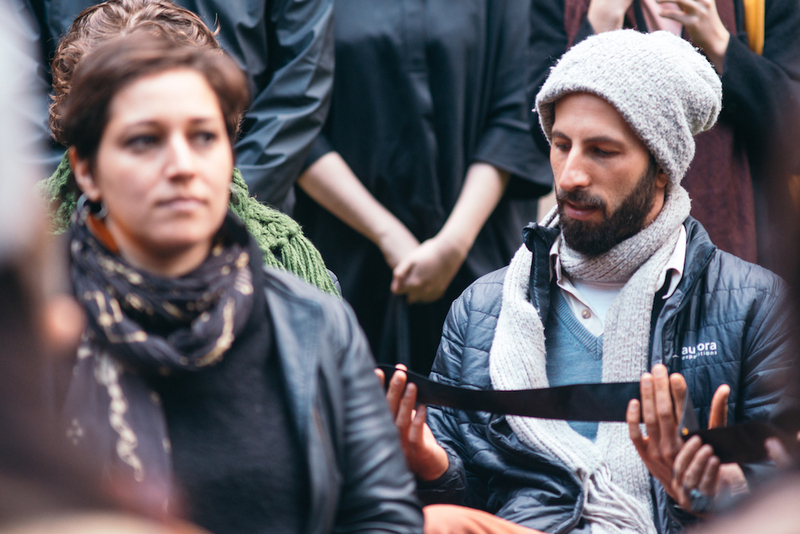 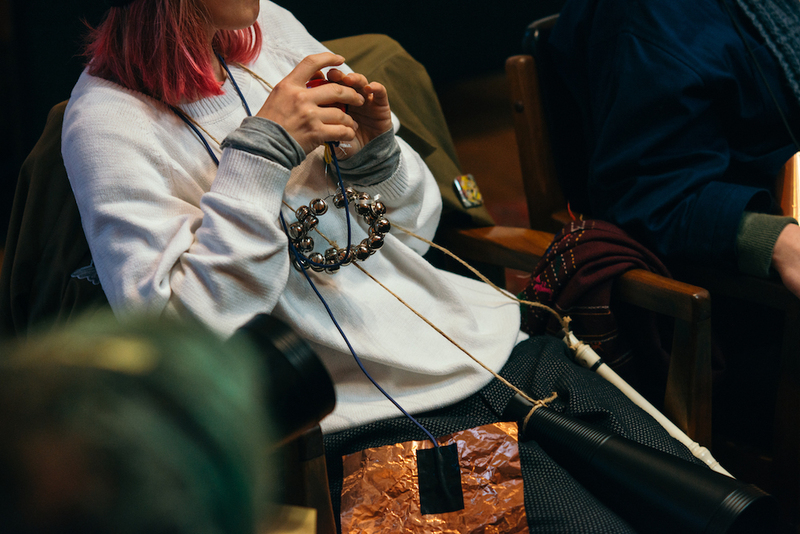 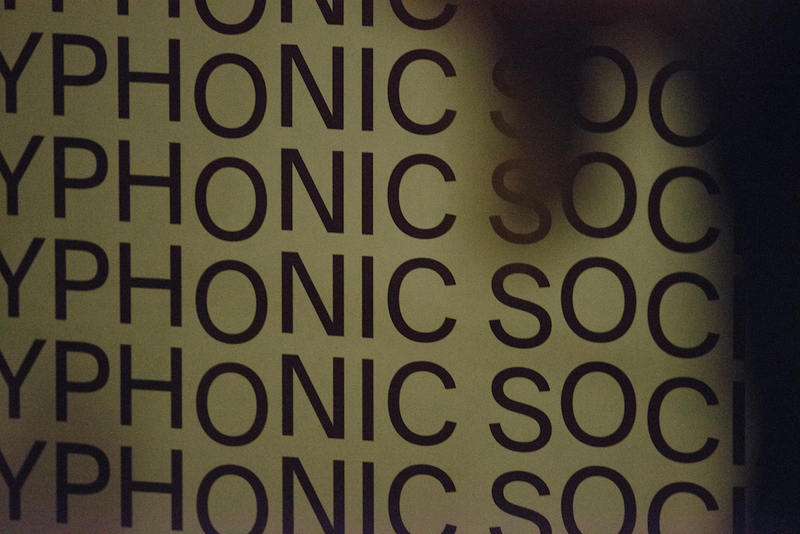 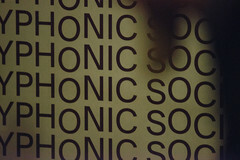 ‘Polyphonic Social’ artists will offer new ways to listen and learn about sound. 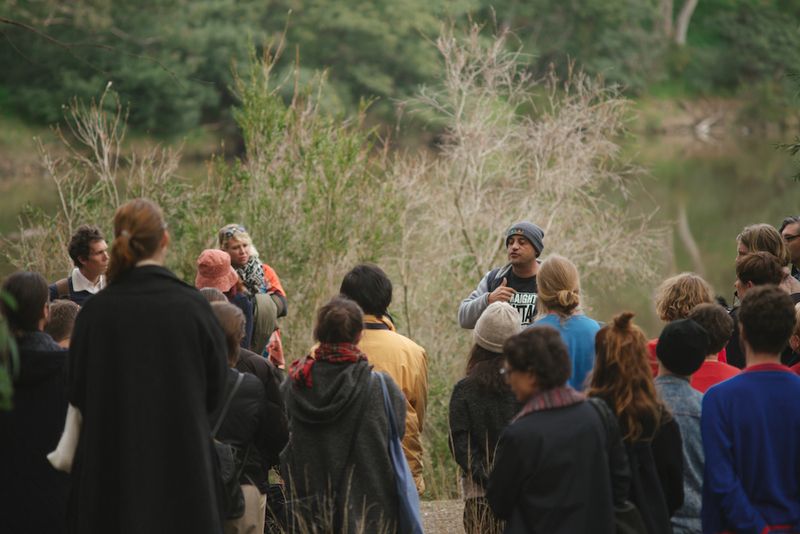 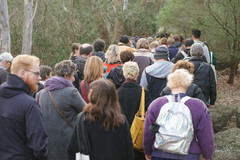 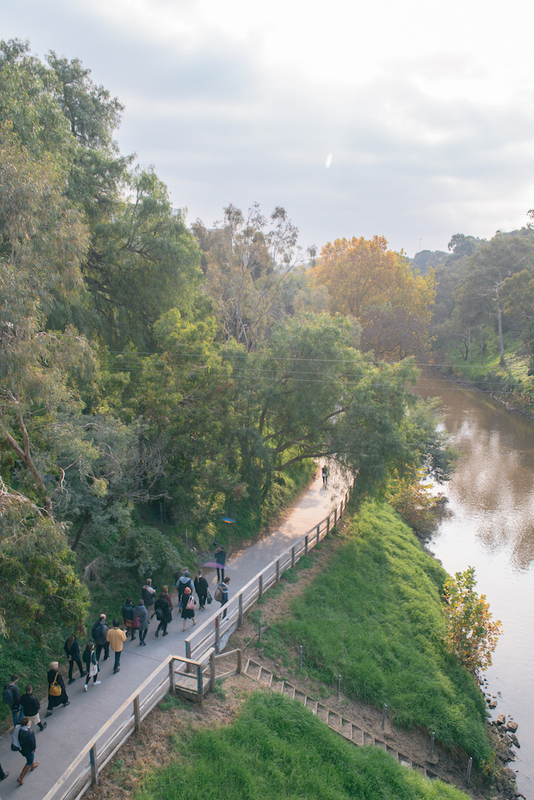 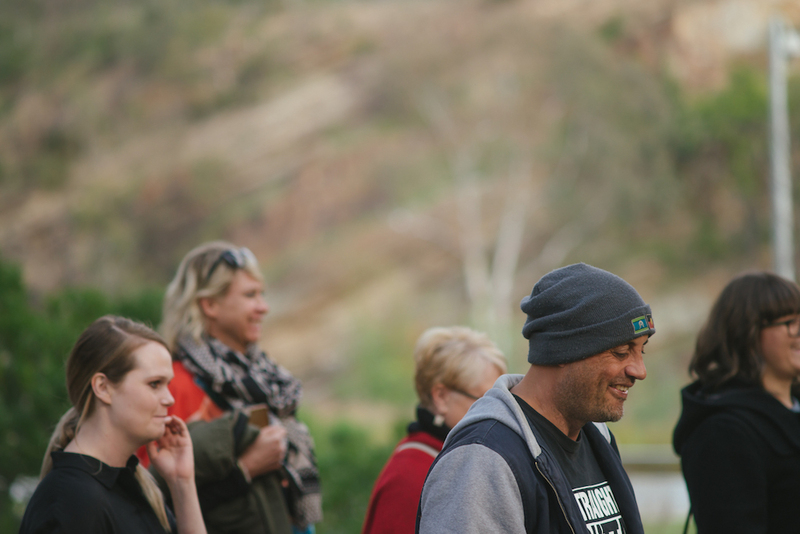 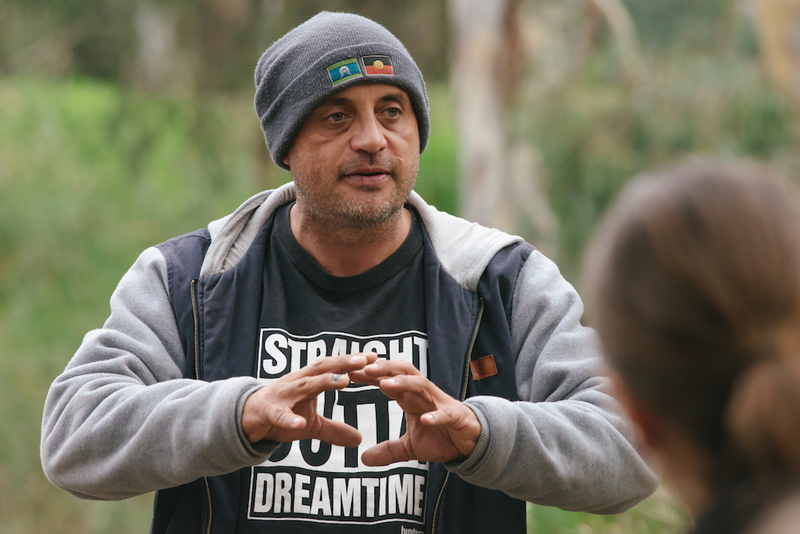 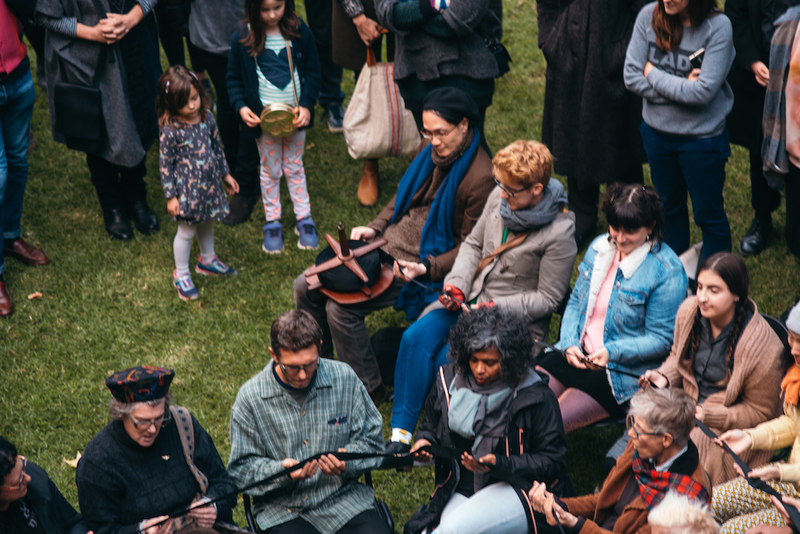 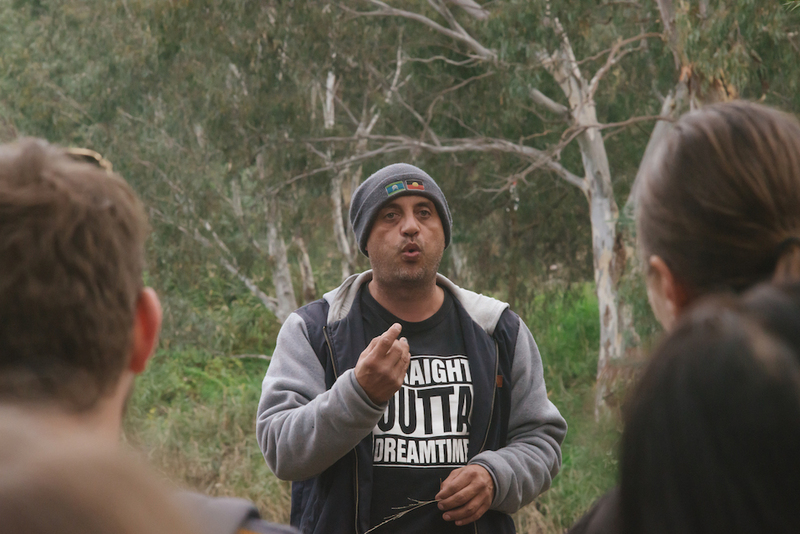 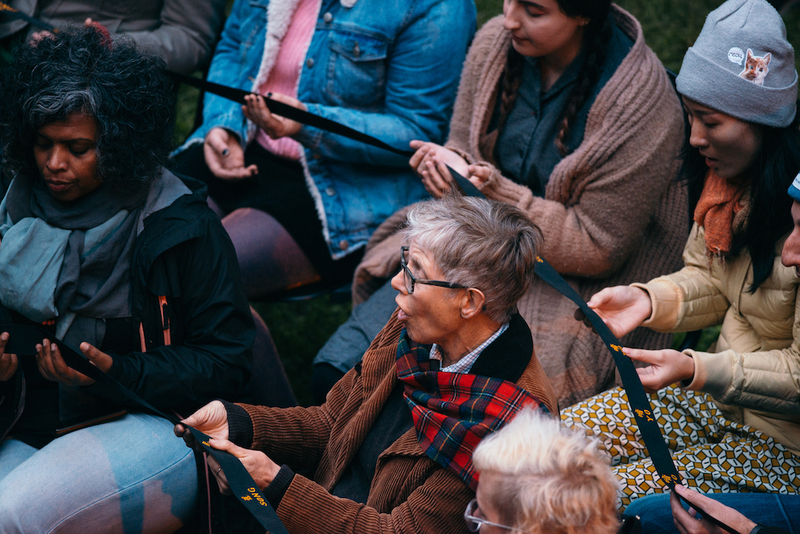 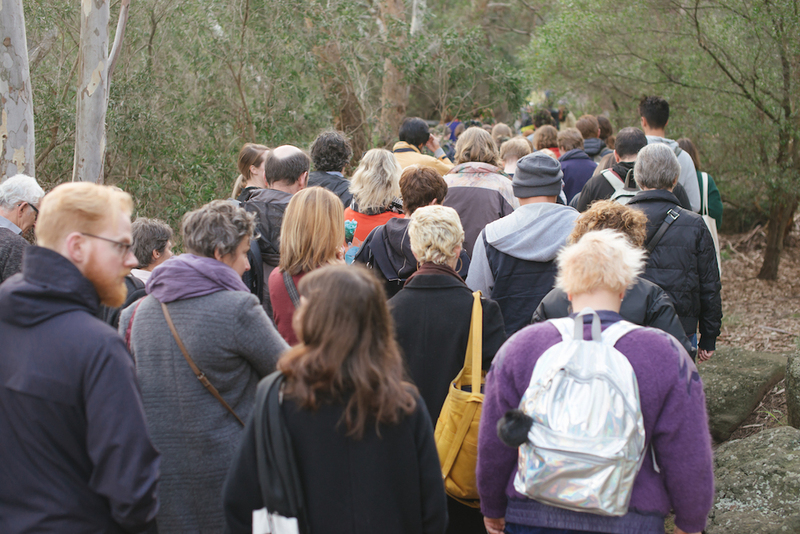 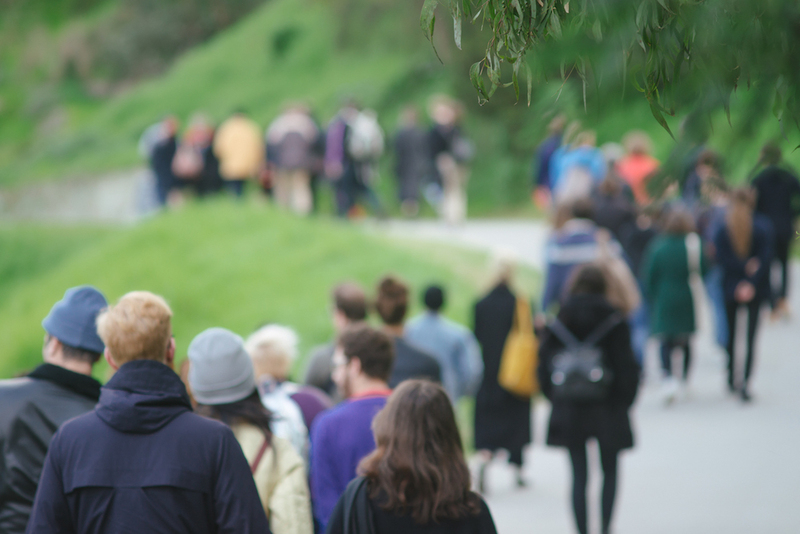 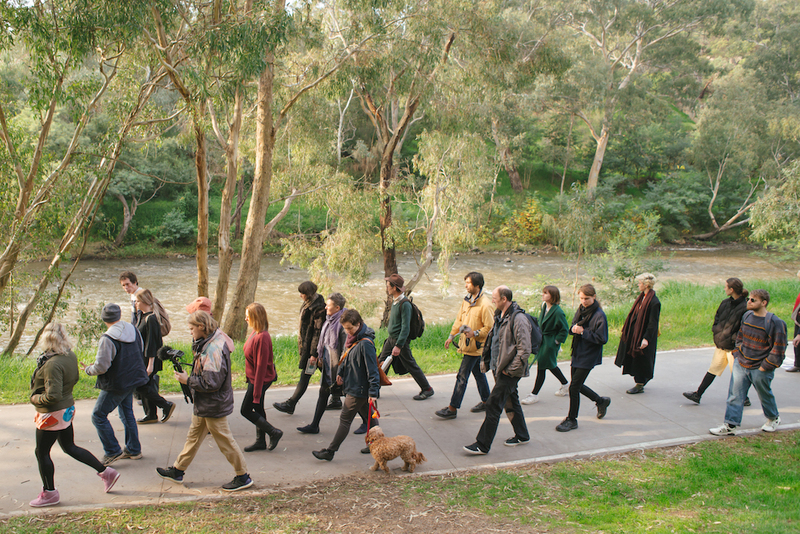 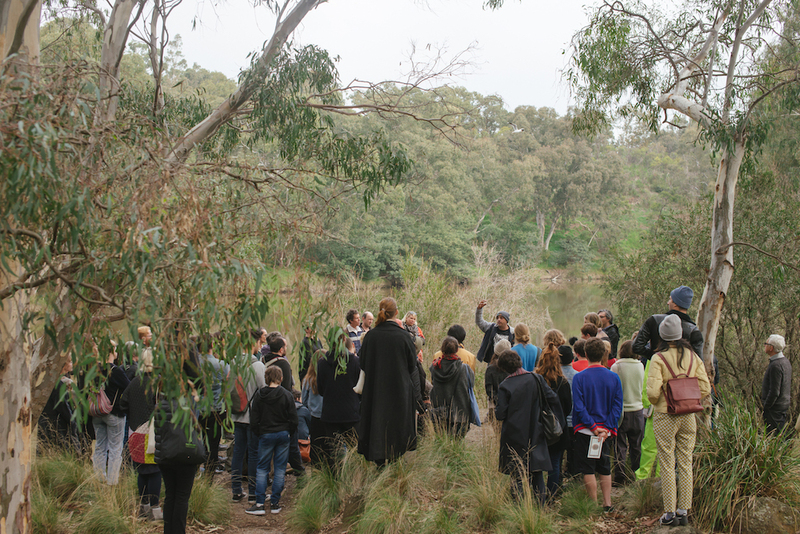 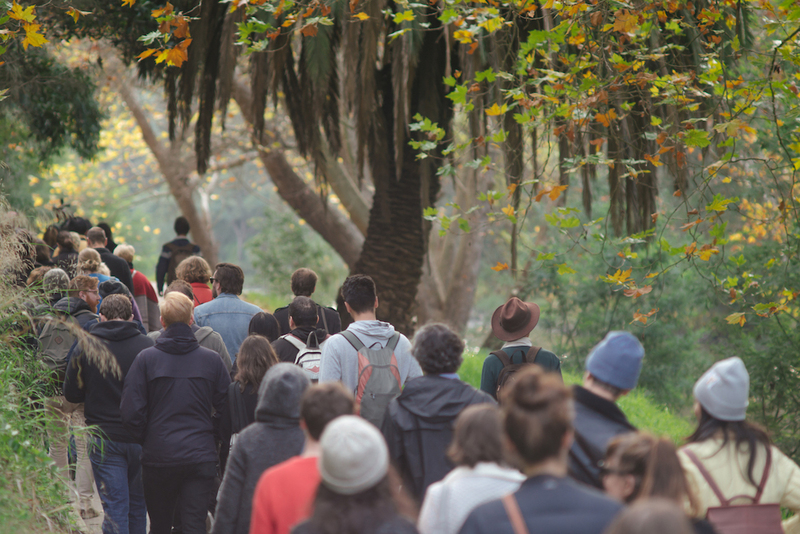 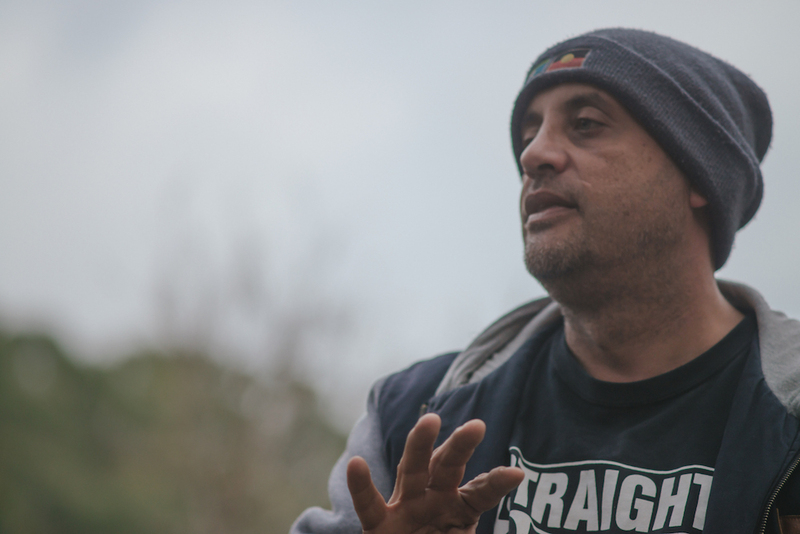 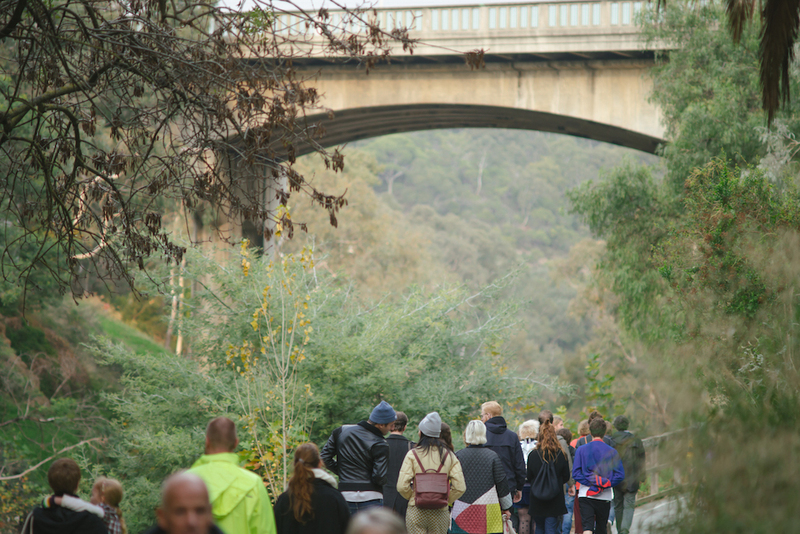 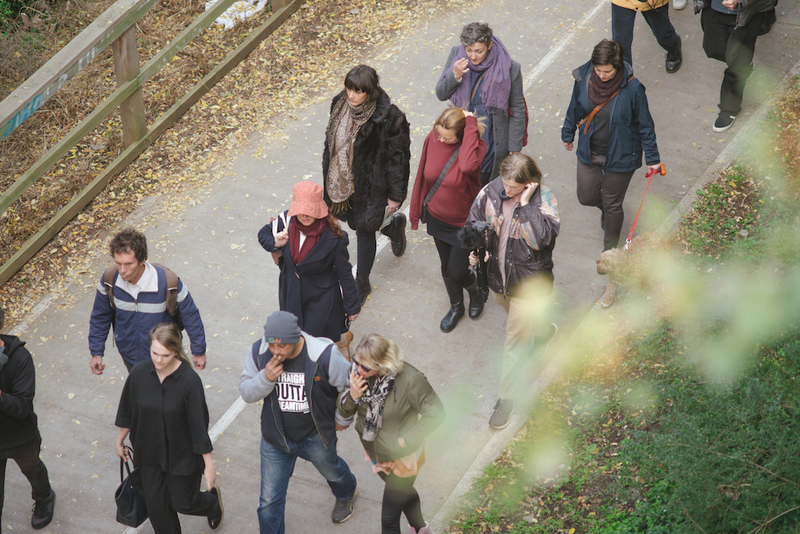 The afternoon program (2pm – 6pm) will begin with a Welcome to Country from Wurundjeri Elder Uncle Bill Nicholson, who will lead us through the Yarra landscape by ear and hear multiple voices of land and country. 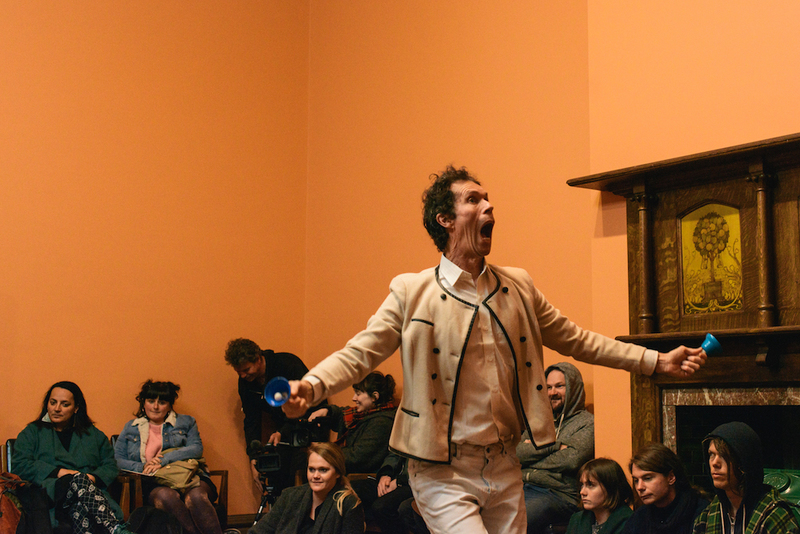 Marking his Australian debut is Lin Chi-Wei – a legend of Taiwanese sonic art, whose practice incorporates folklore culture, noise, ritual and audience participation. 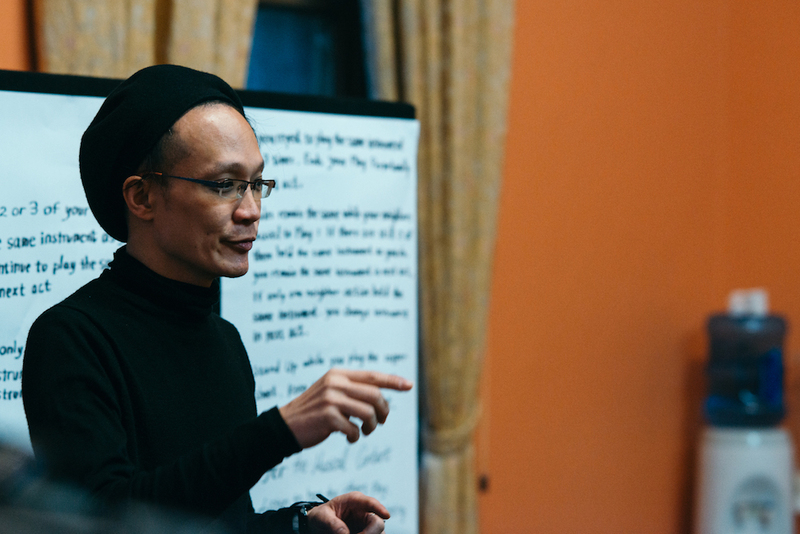 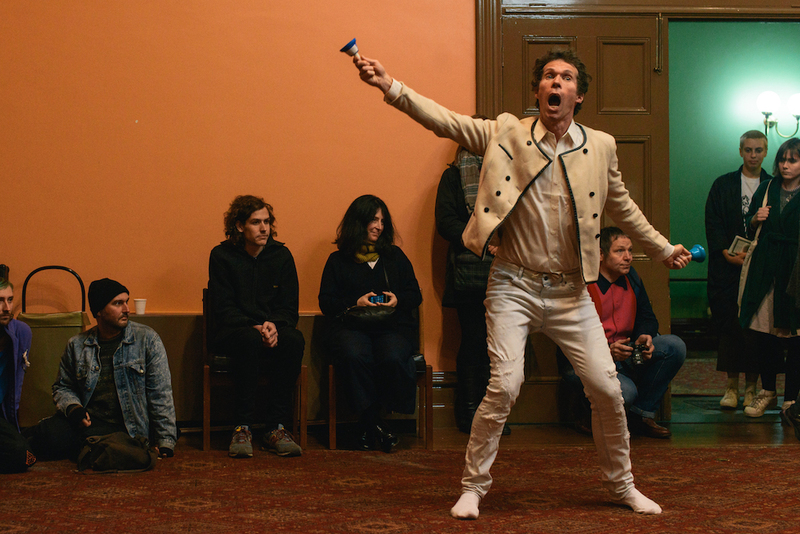 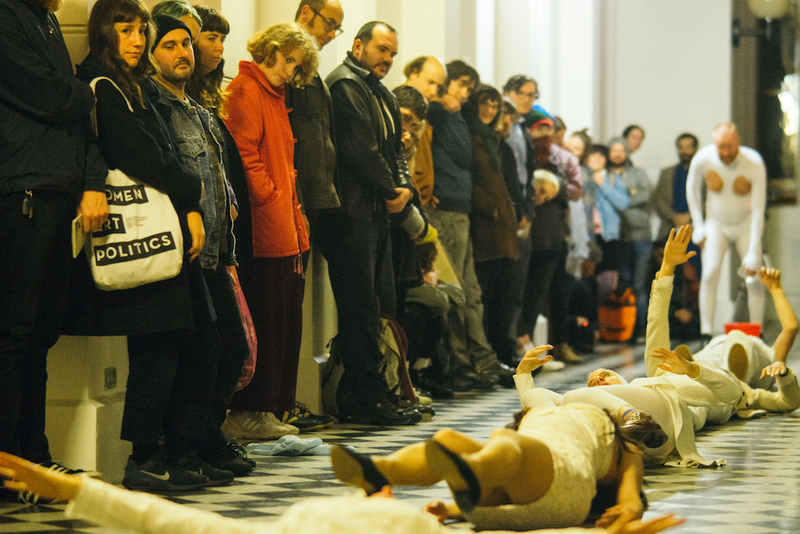 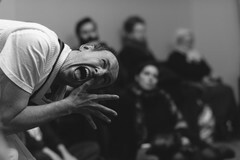 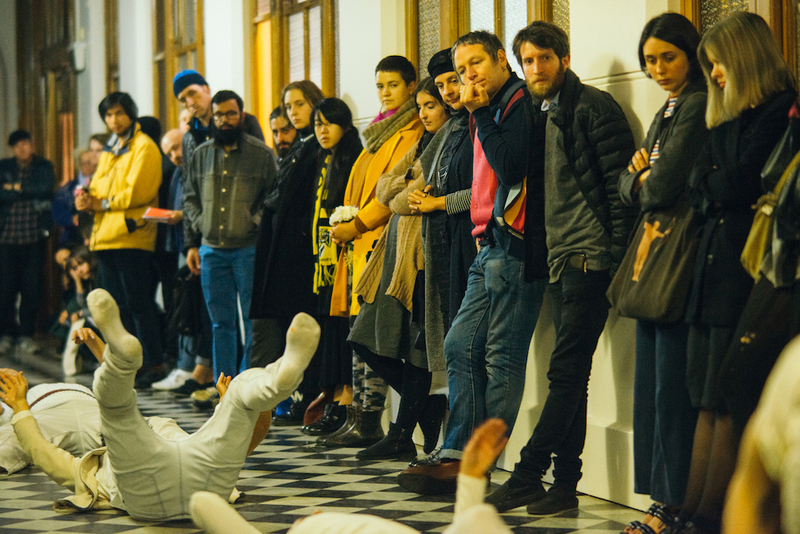 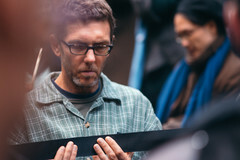 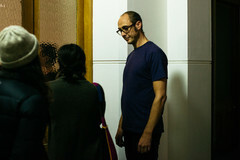 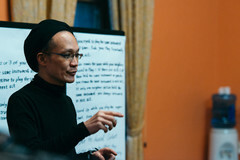 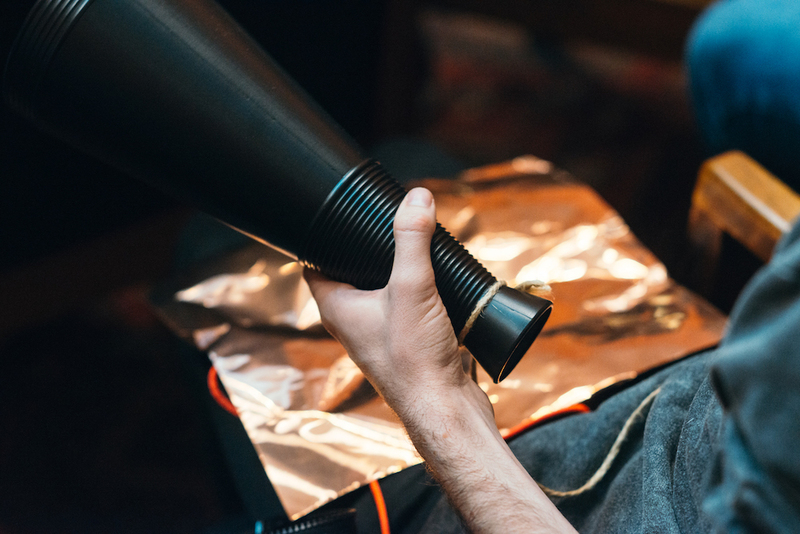 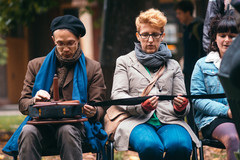 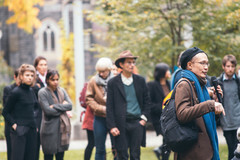 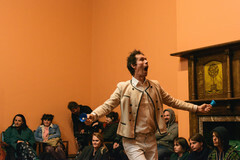 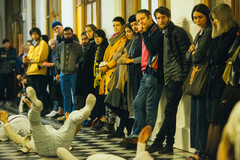 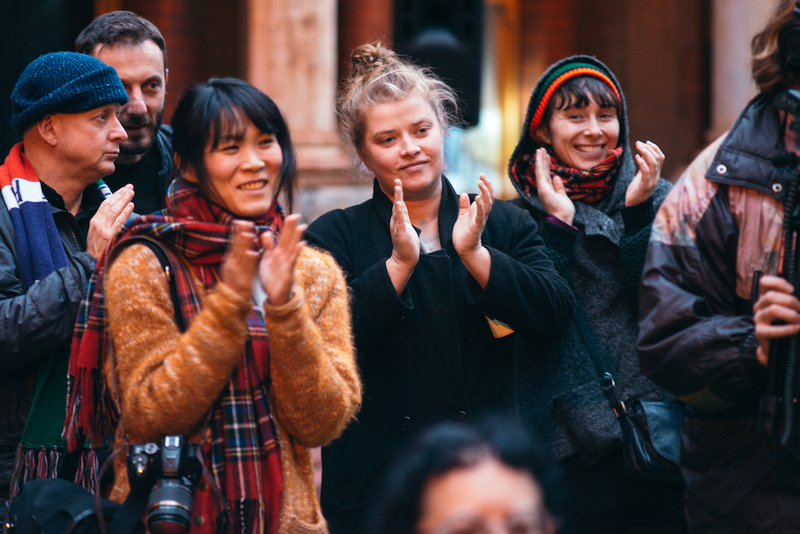 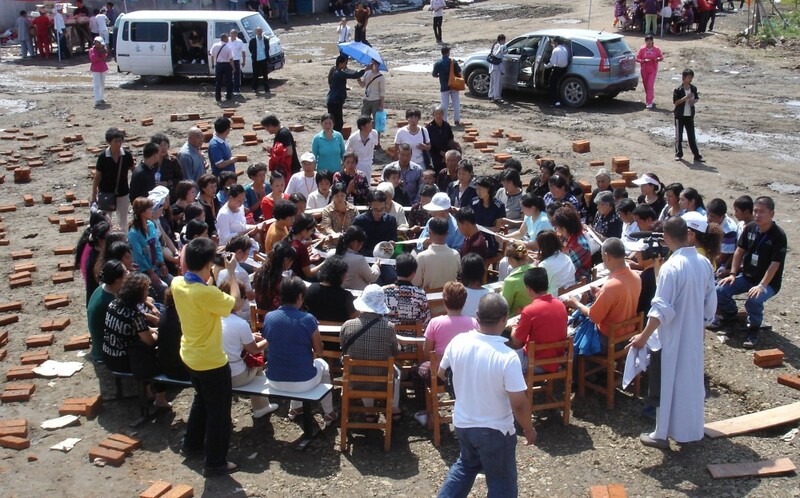 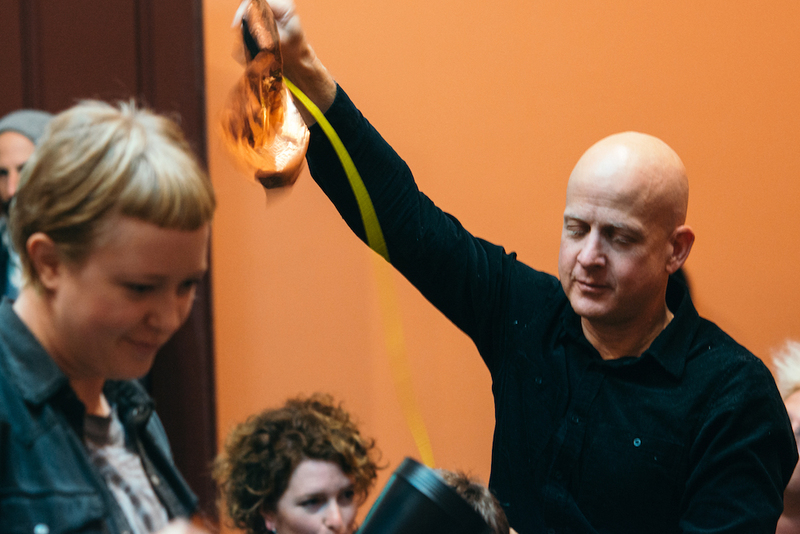 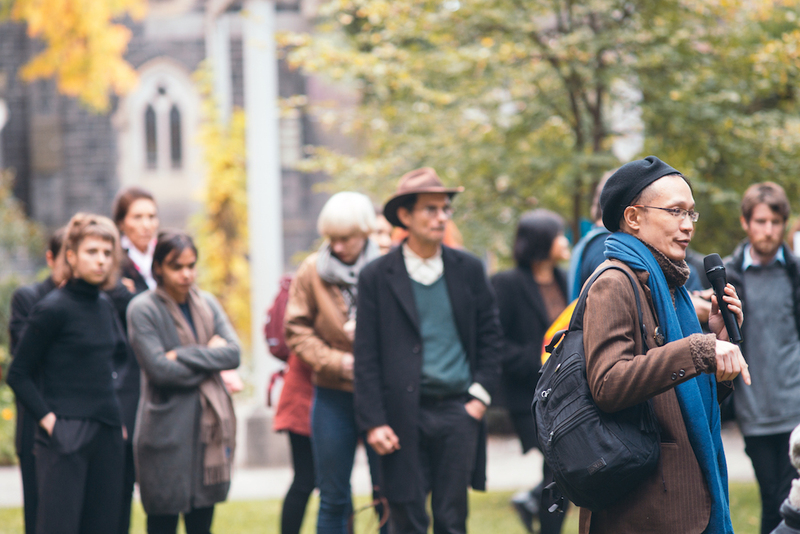 Chi-Wei will stage his famed participatory sound work, ‘Tape Music’, in which audience members pass a paper score (sometimes 200m long) around a circle, singing as they go, therein resembling a ‘human tape machine’. 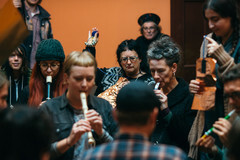 This program also pays homage to the great American experimental musician and artist Pauline Oliveros, who sadly passed away last year in 2016. 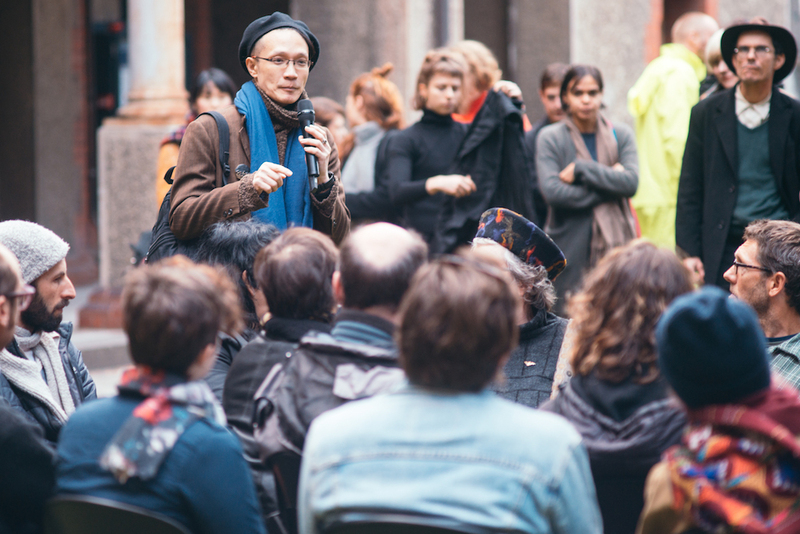 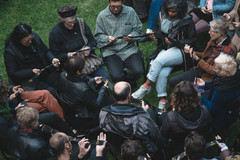 Oliveros gave inspiration to a generation of artists through her sublime compositions and improvisations and, importantly, her philosophical approach to sound and ‘deep’ listening. 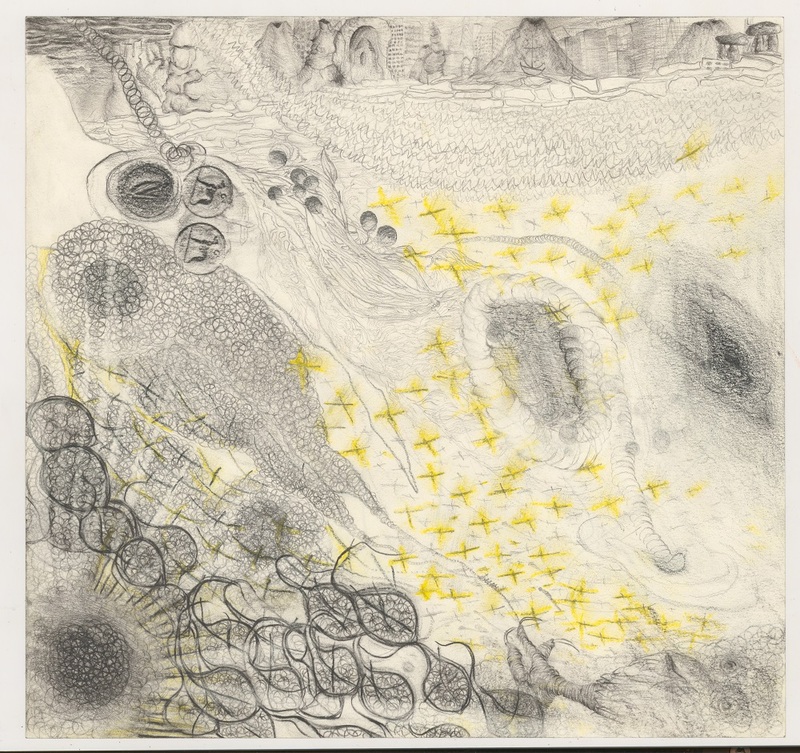 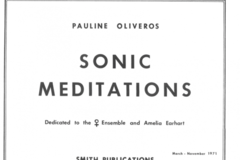 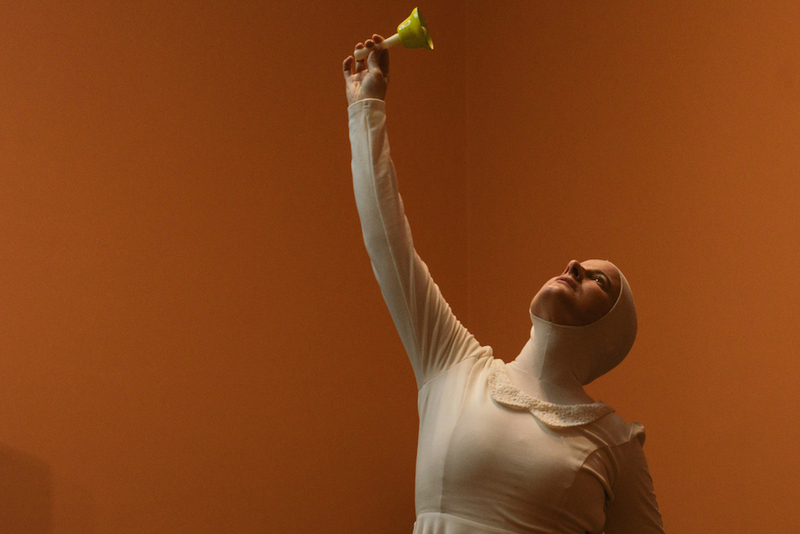 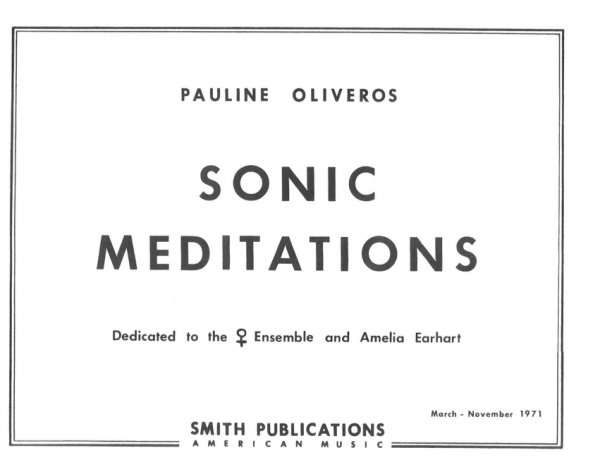 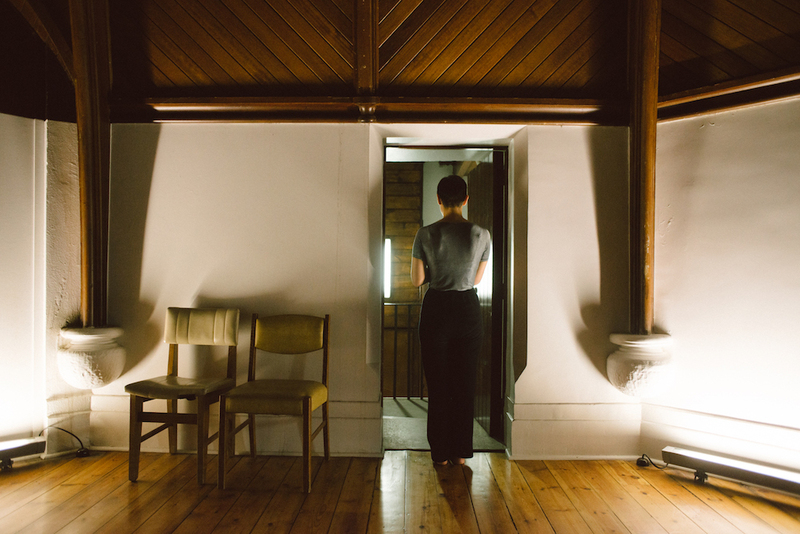 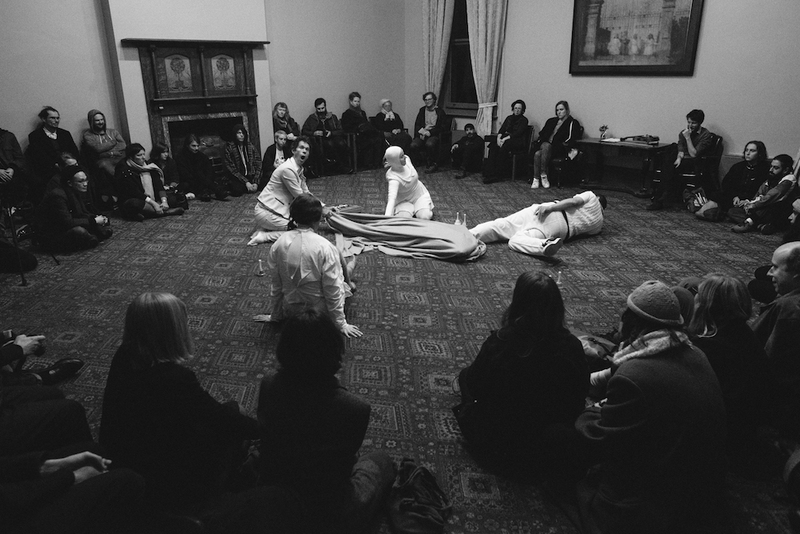 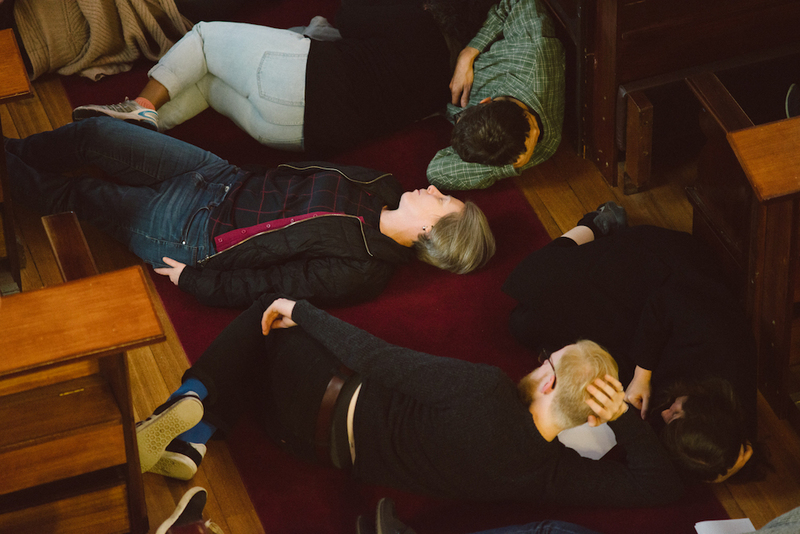 In the spirit of musing, Melbourne artist Bruce Mowson is revisiting Oliveros’s 1974 suite ‘Sonic Meditations’, along with fellow artists Aviva Endean, Danae Valenza, and Fayen d’Evie. These meditation pieces are extremely playful and imaginative works, often functioning more as thought experiments than music. 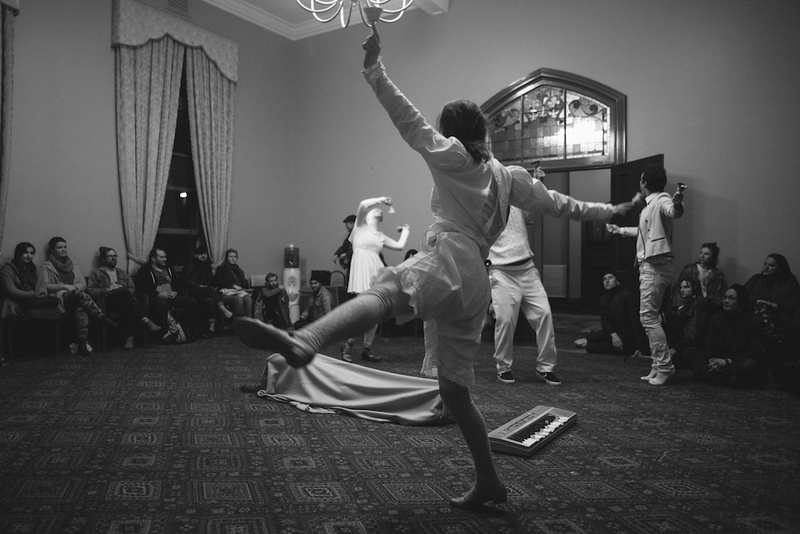 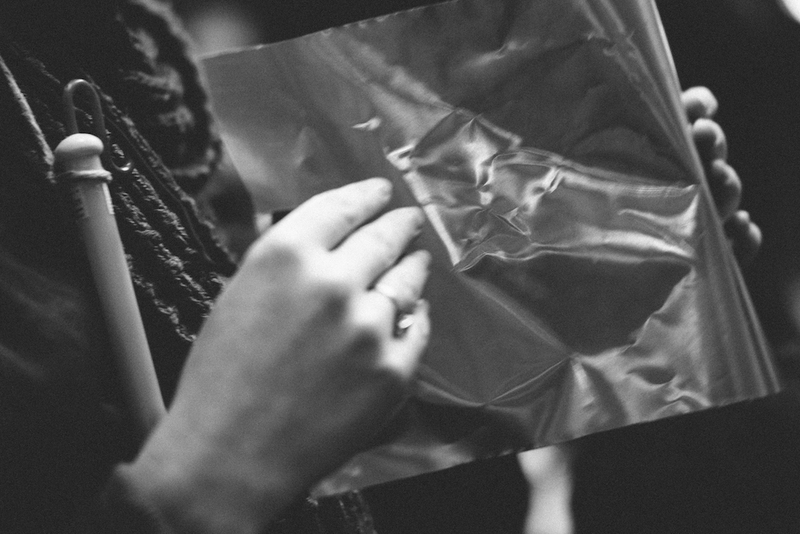 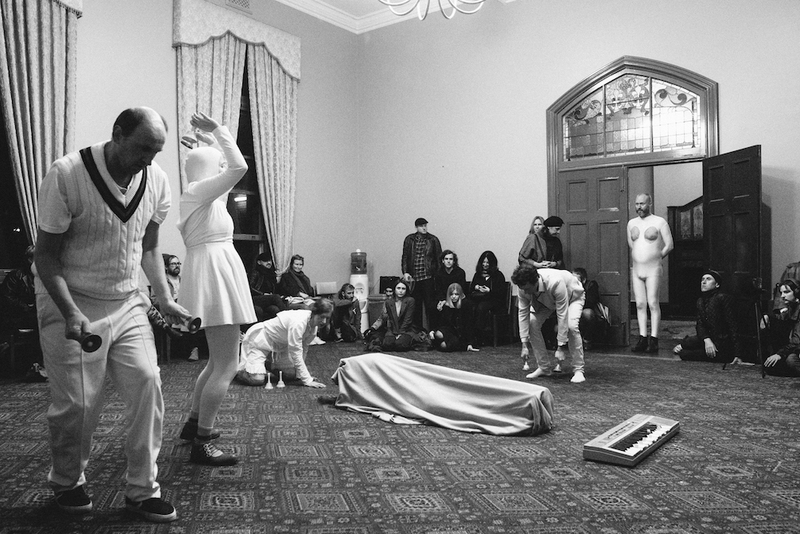 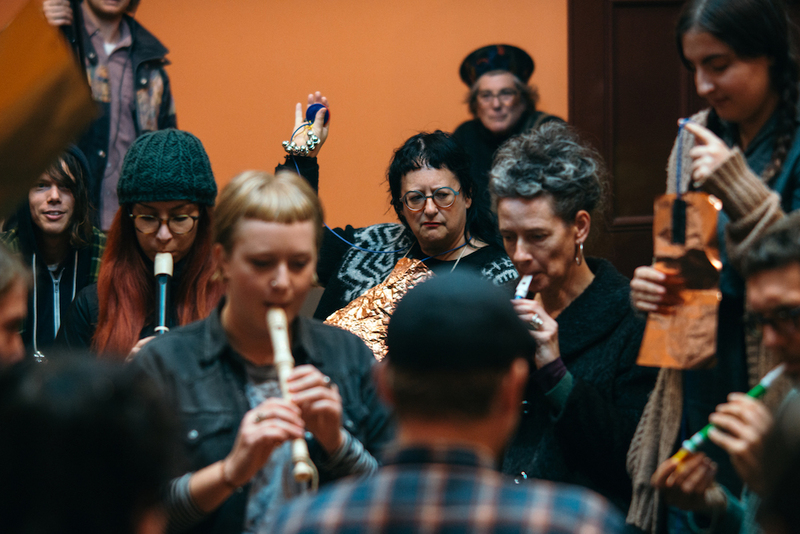 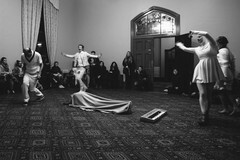 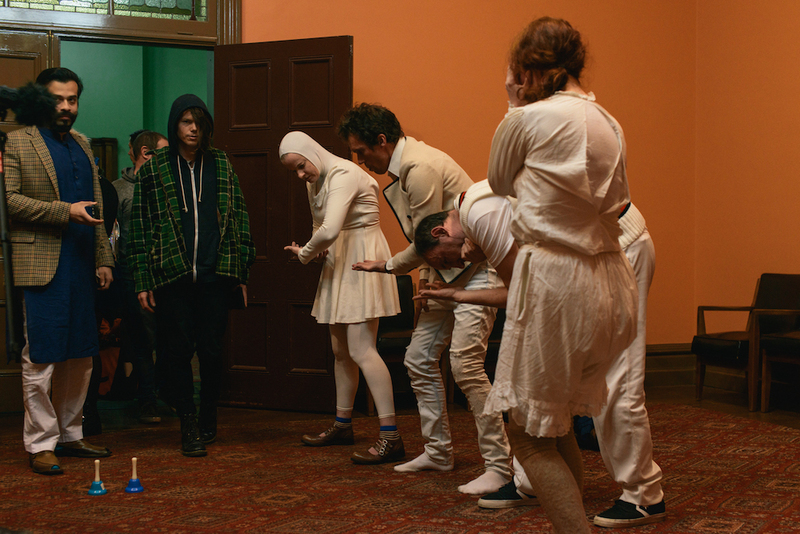 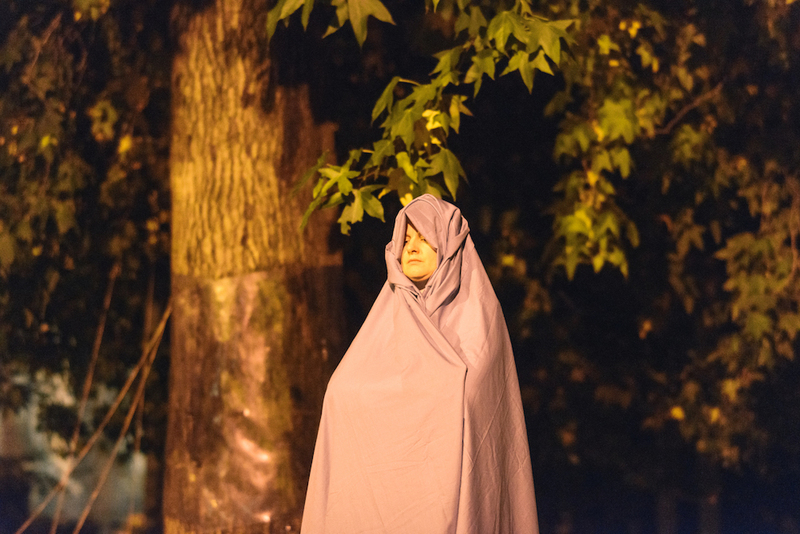 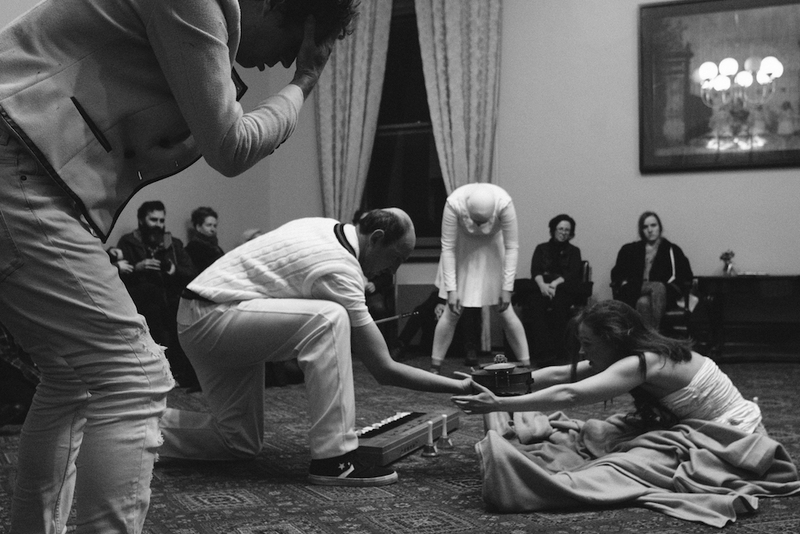 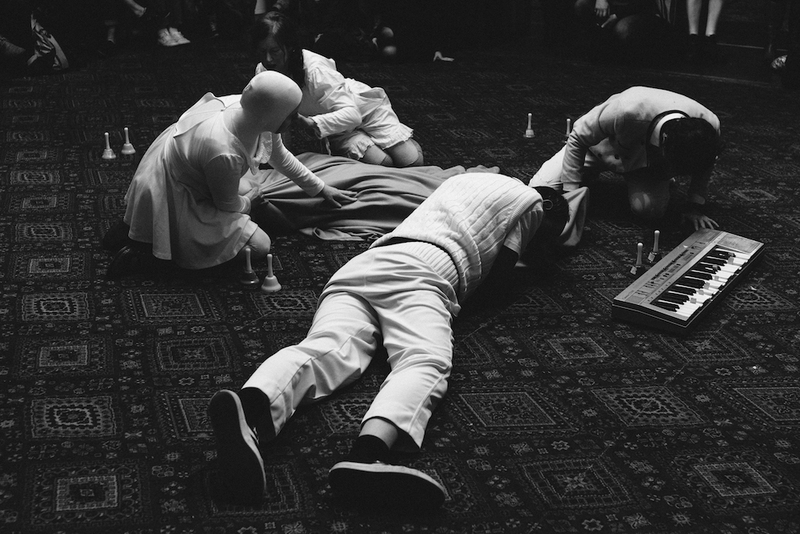 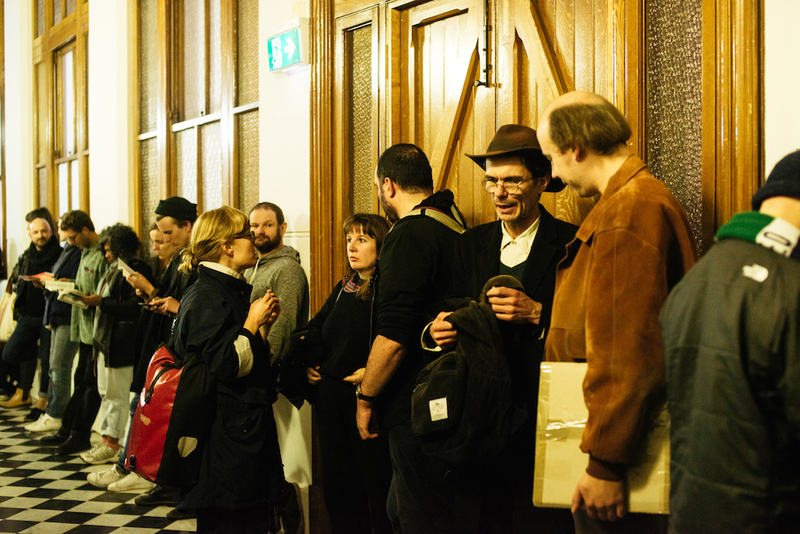 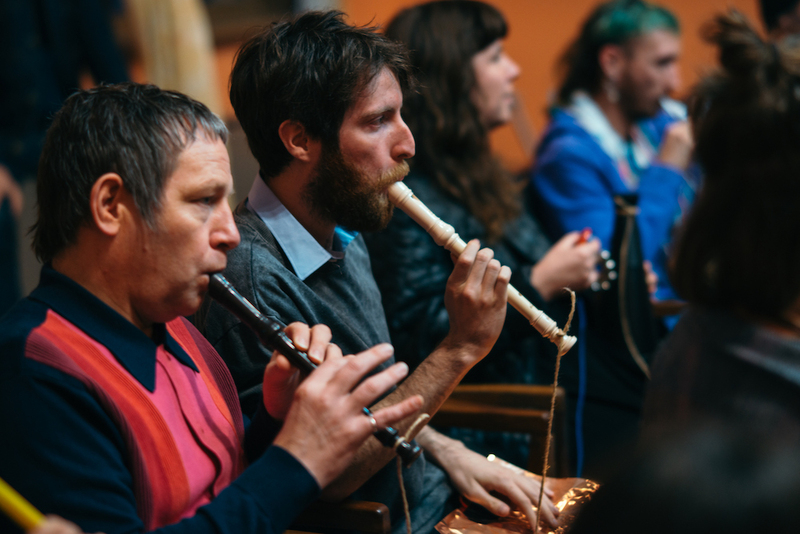 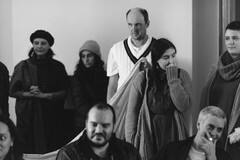 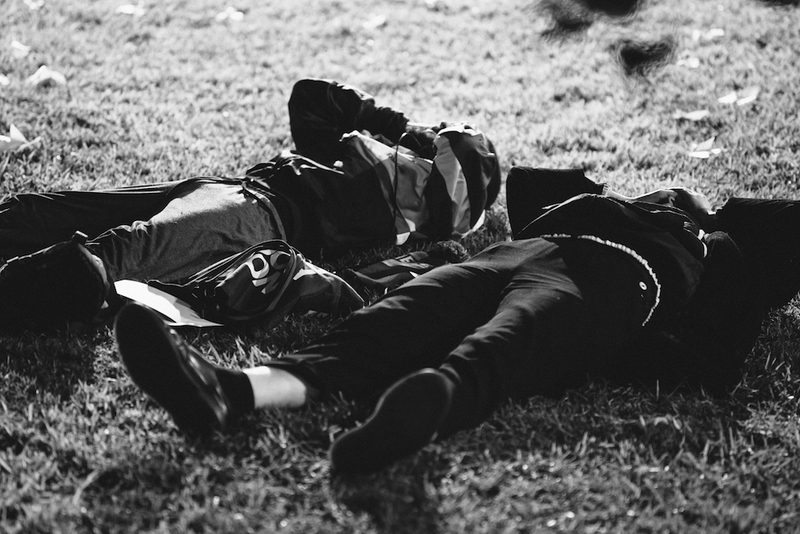 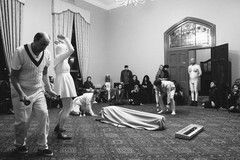 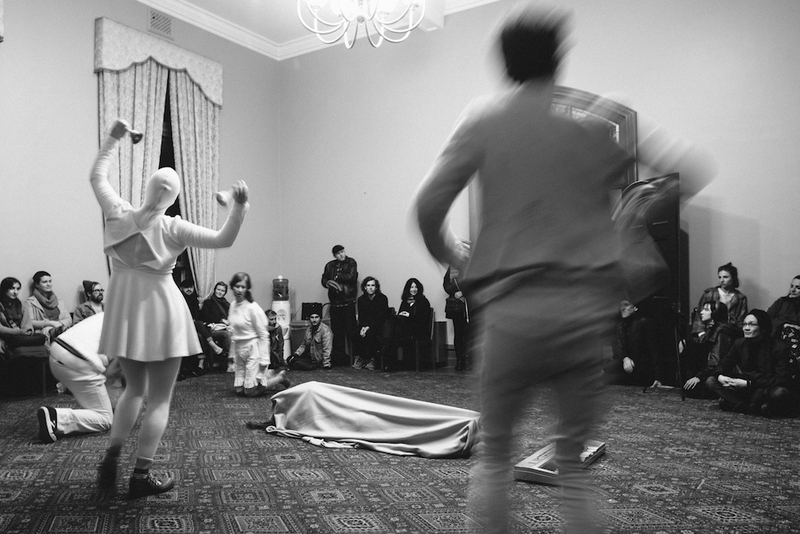 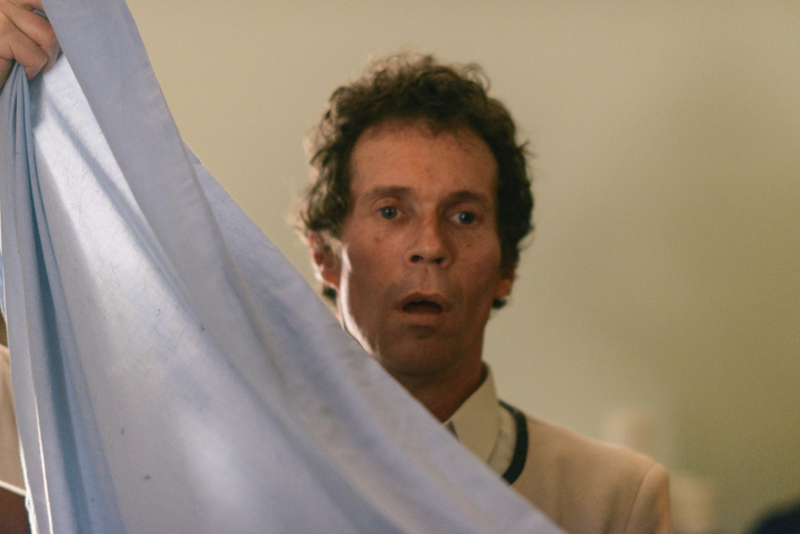 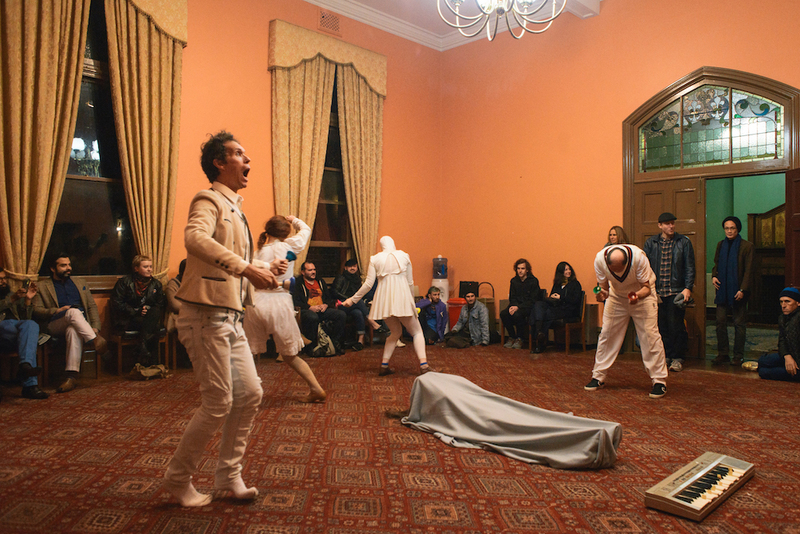 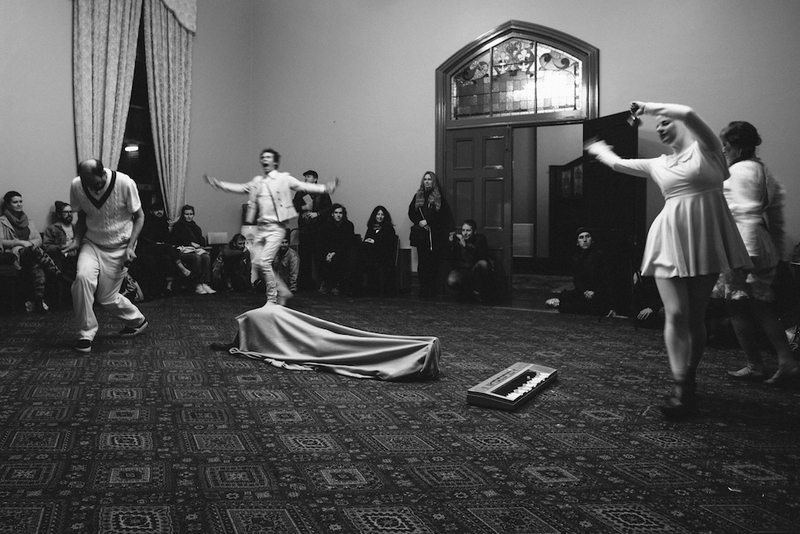 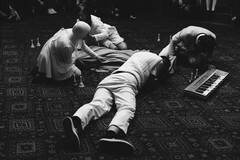 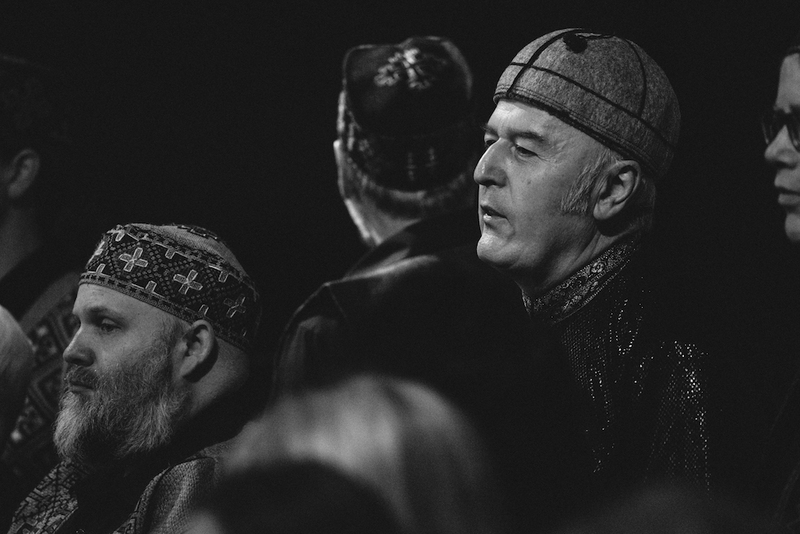 Also performing will be Melbourne’s Hi God People who, put simply, are one of the weirdest, but wonderful, sound art groups around. 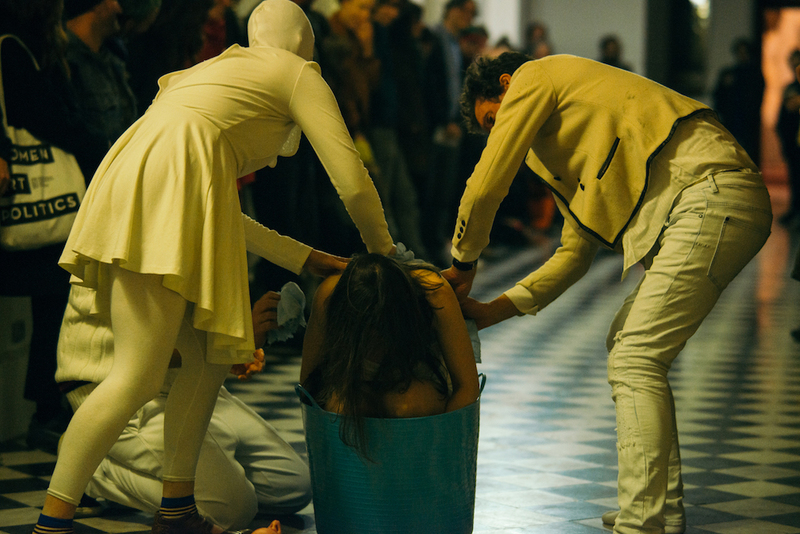 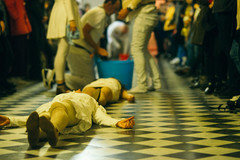 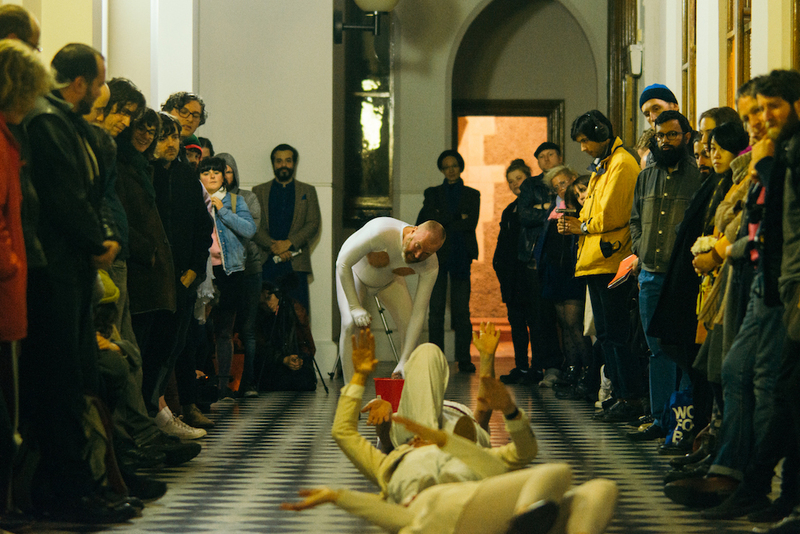 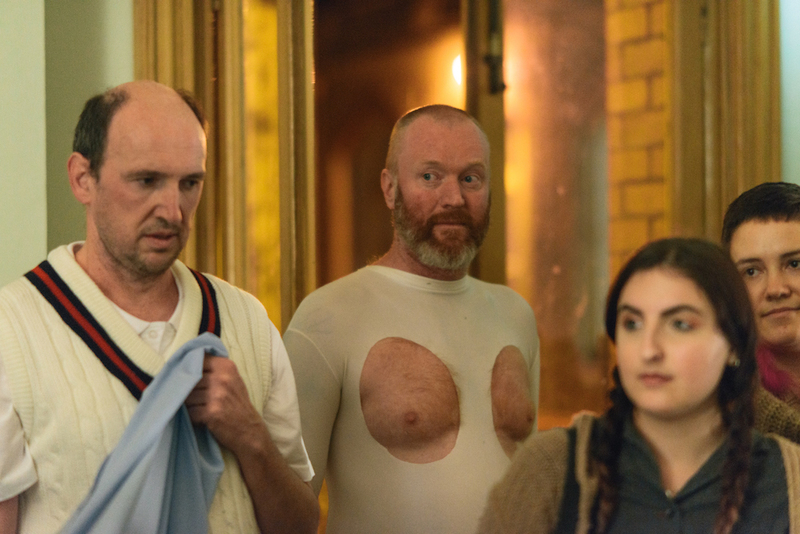 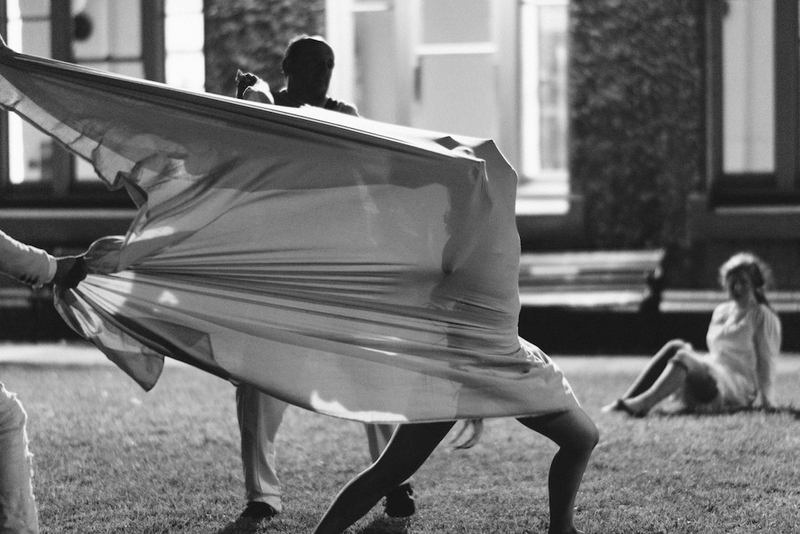 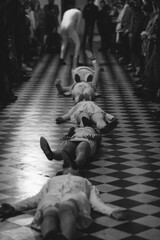 They will perform a new work, ‘Running Bathing Singing With The Hi God People’, which they say will involve “bathing each other while dressed in sleepwear, wetting the sleepwear in the process”. 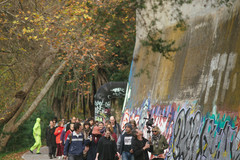 How this will be done is yet to be precisely realised, but the group agree “it might be better to do this outside”. 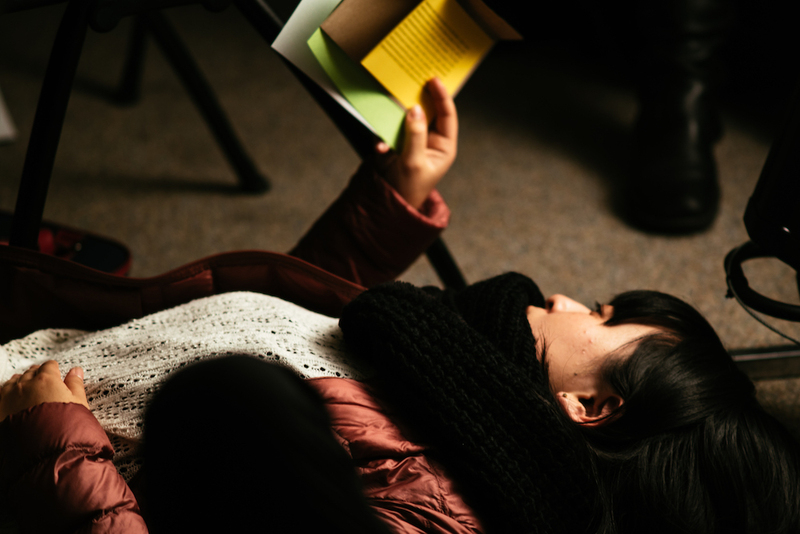 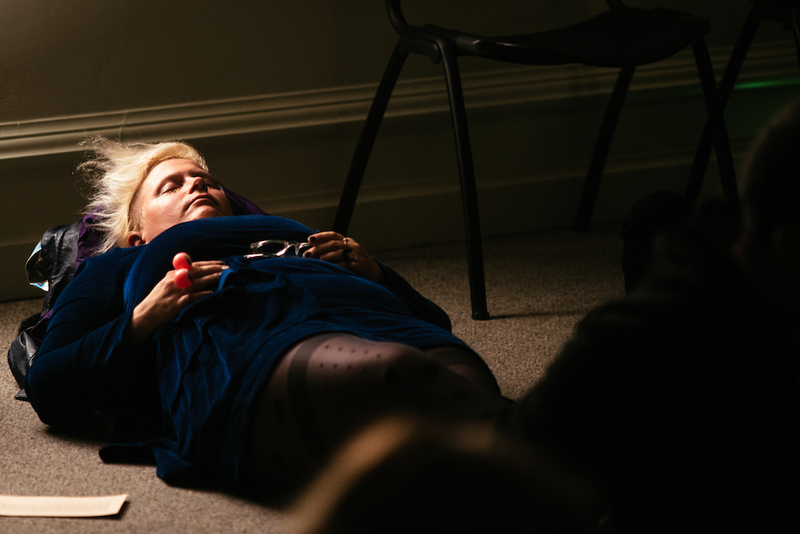 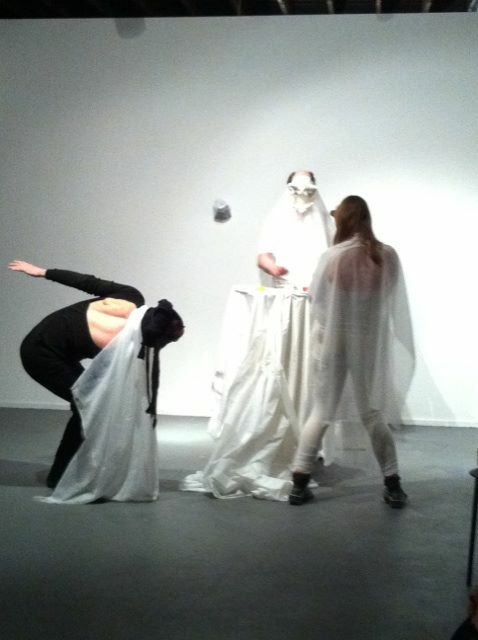 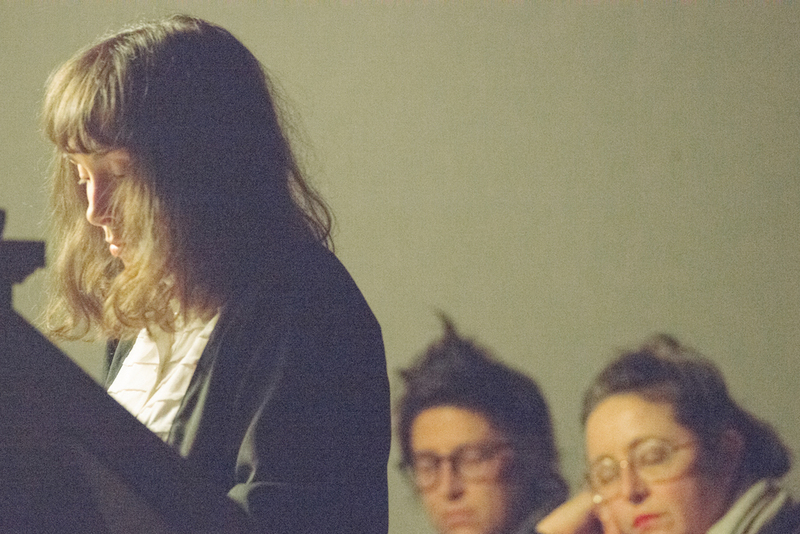 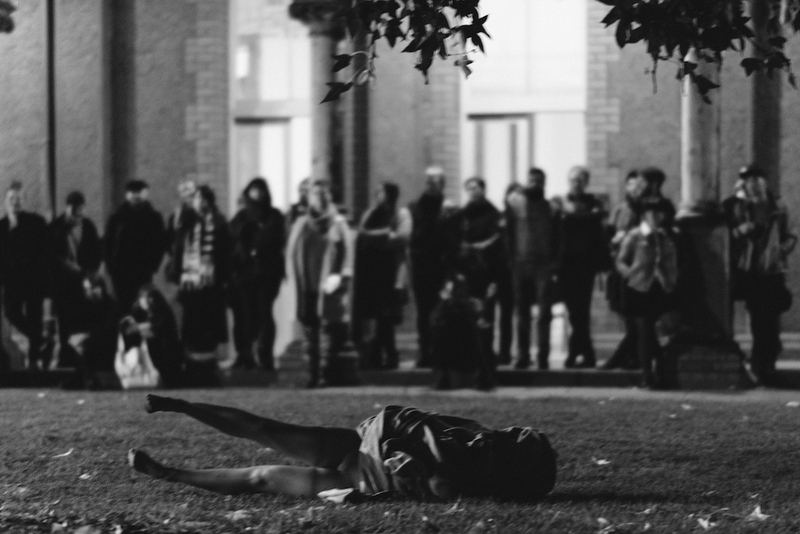 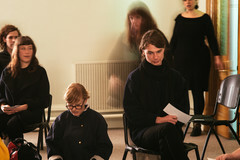 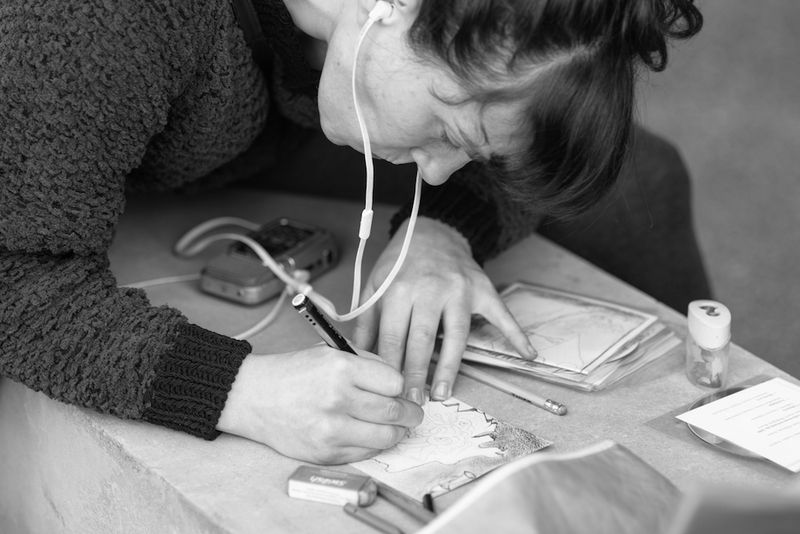 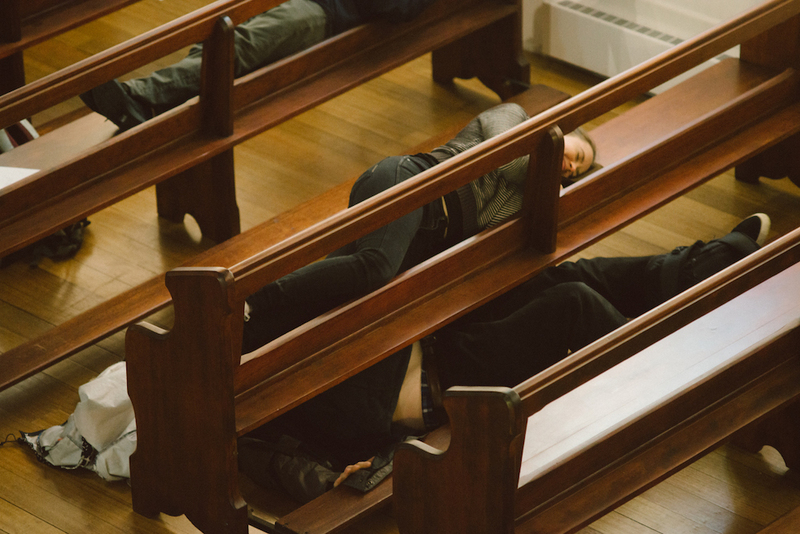 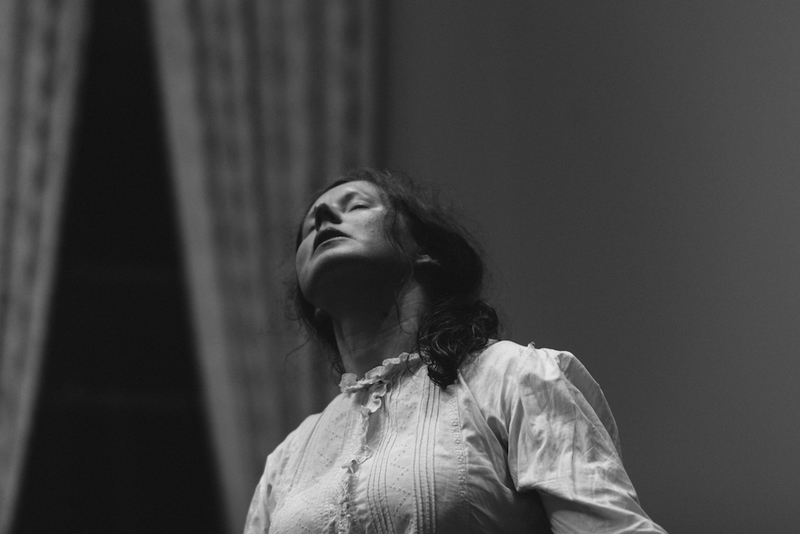 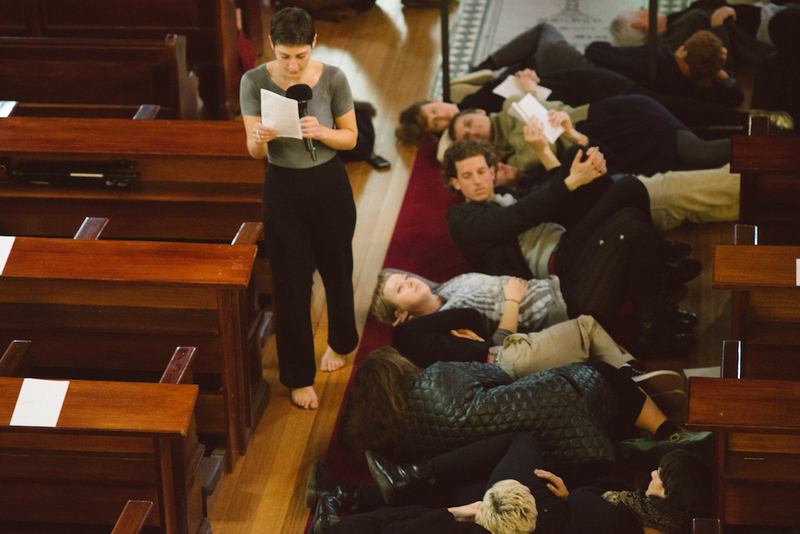 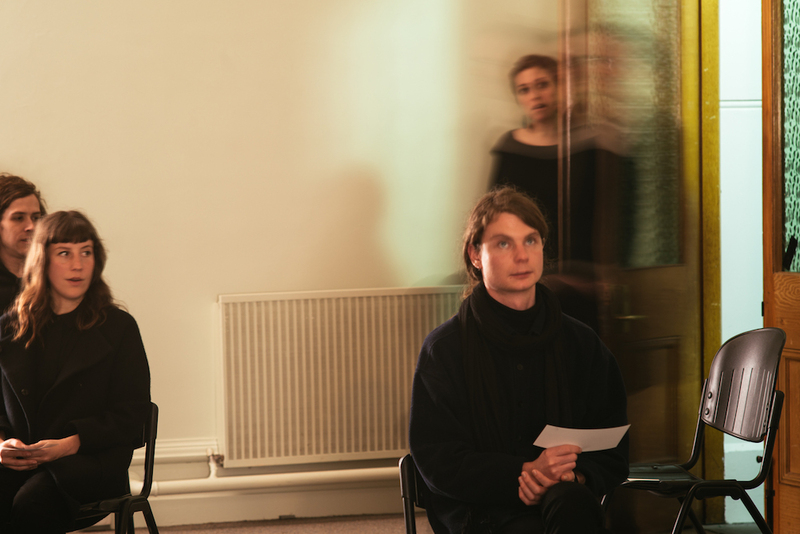 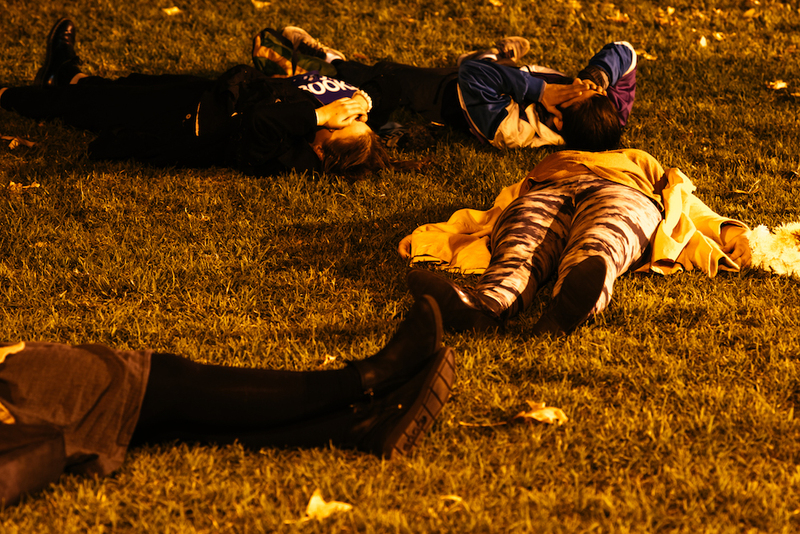 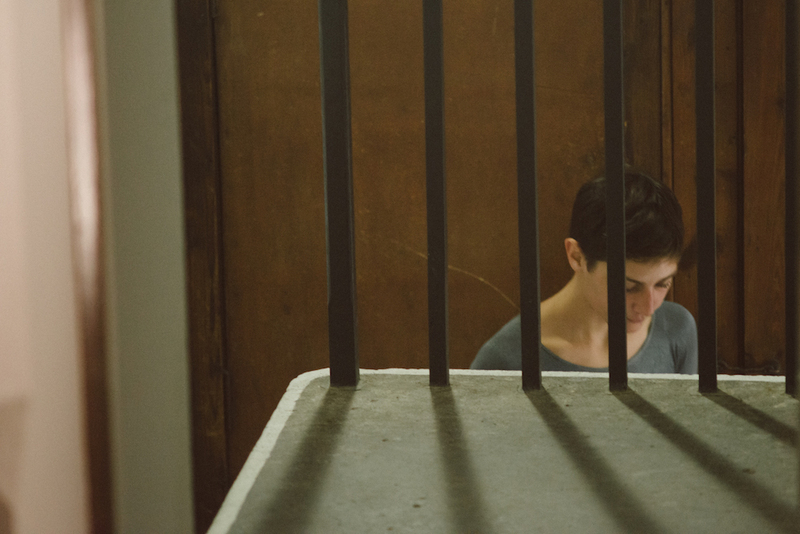 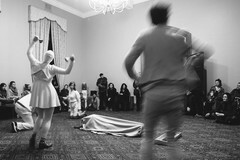 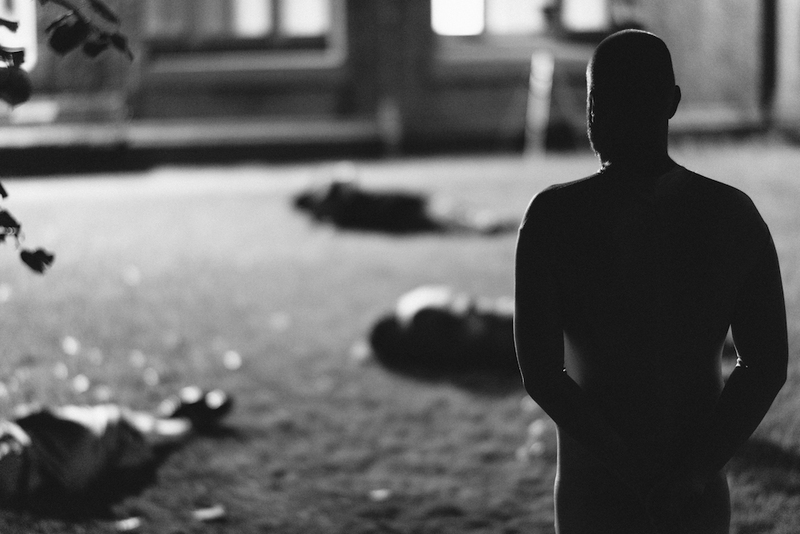 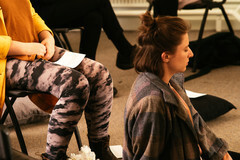 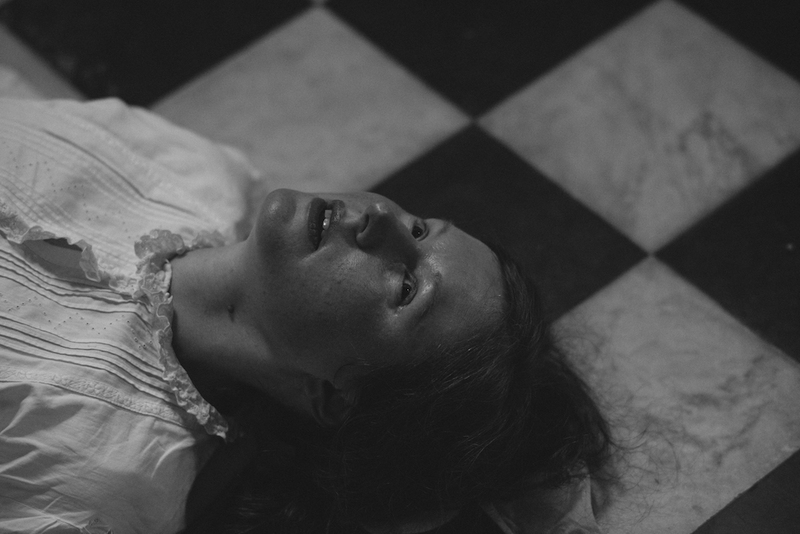 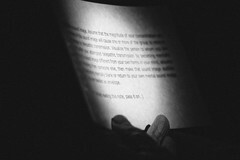 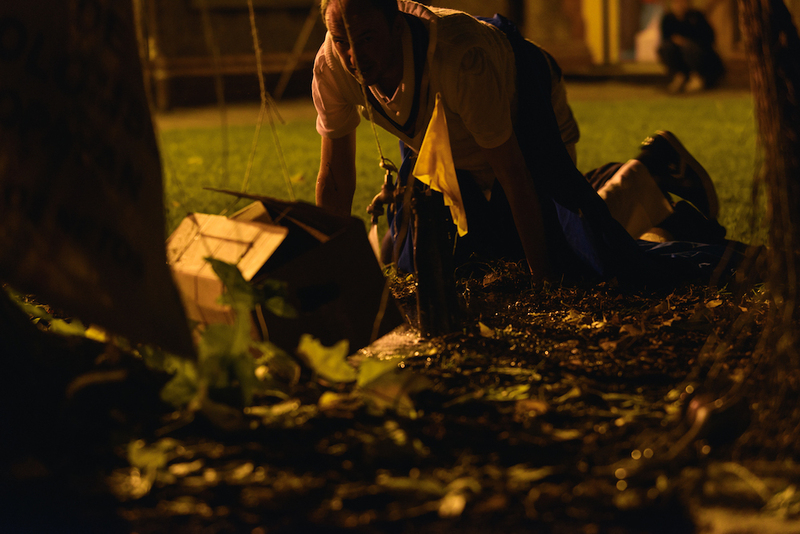 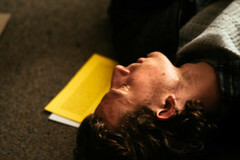 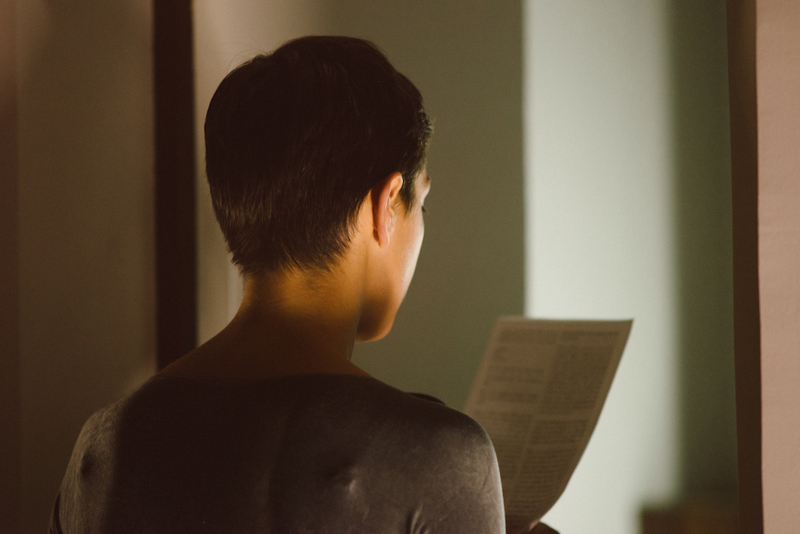 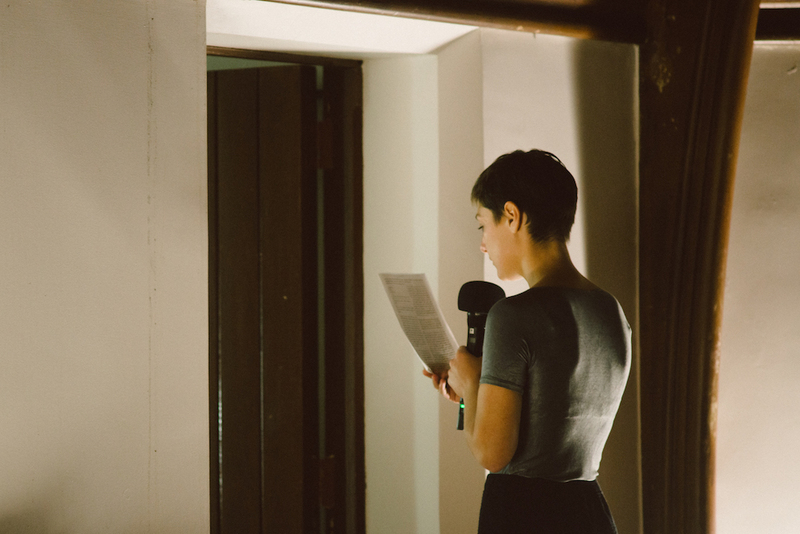 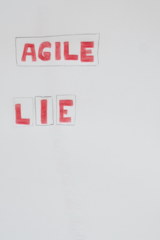 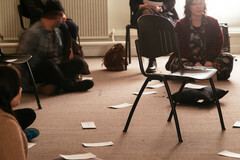 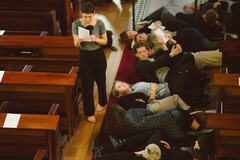 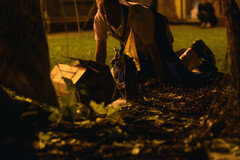 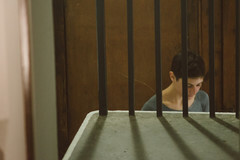 Rosie Isaac will deliver a subtle, but very distinctive site-responsive work that operates at the intersection of text and performance, reading and speaking, standing up and lying down. She likes to explore the confusing ambiguous situations opened up by words that have multiple meanings and, therefore, suggest multiple hearings (which she thinks of as unspoken polyphony). 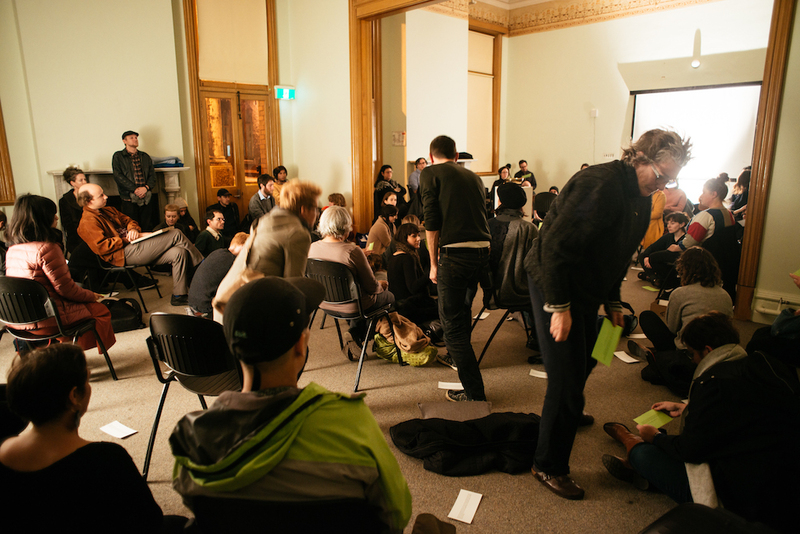 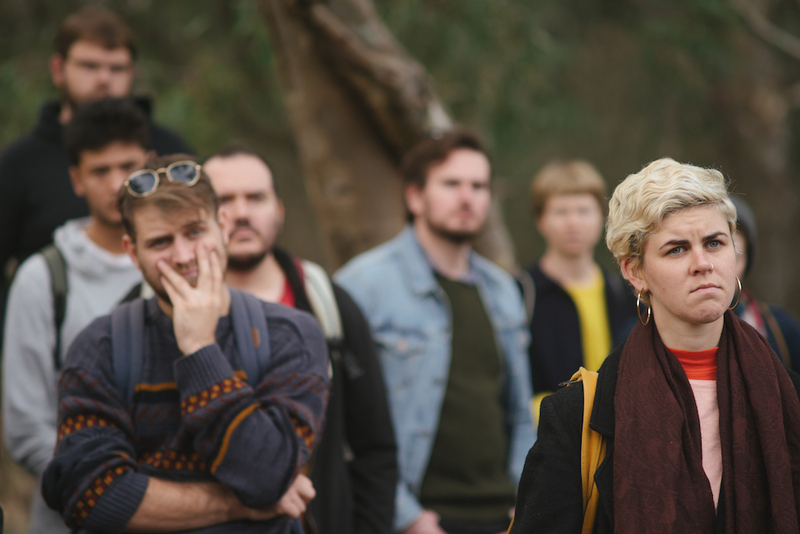 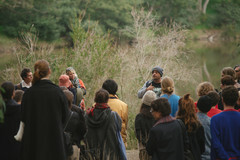 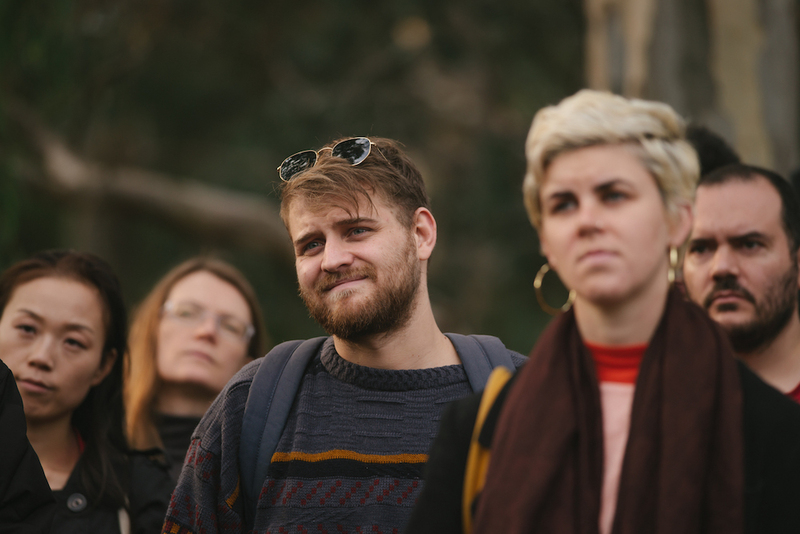 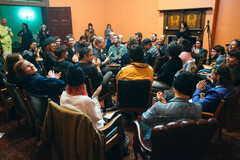 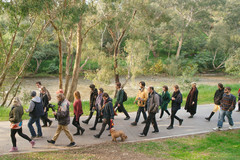 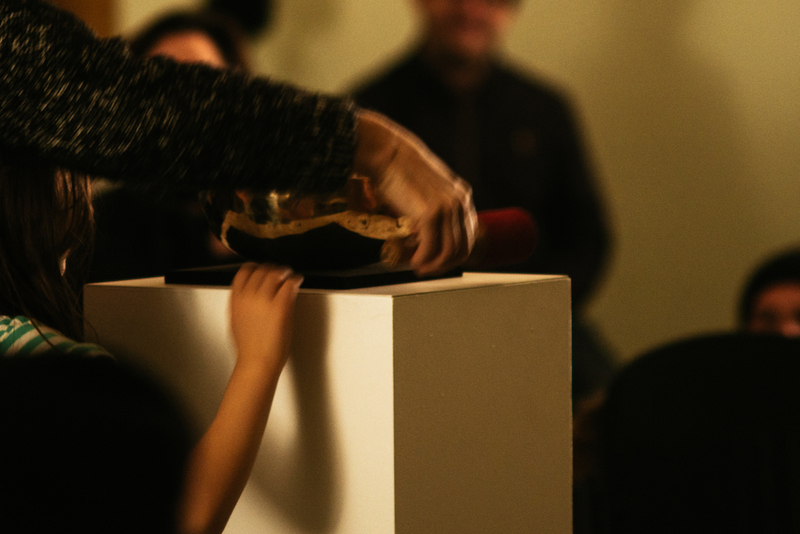 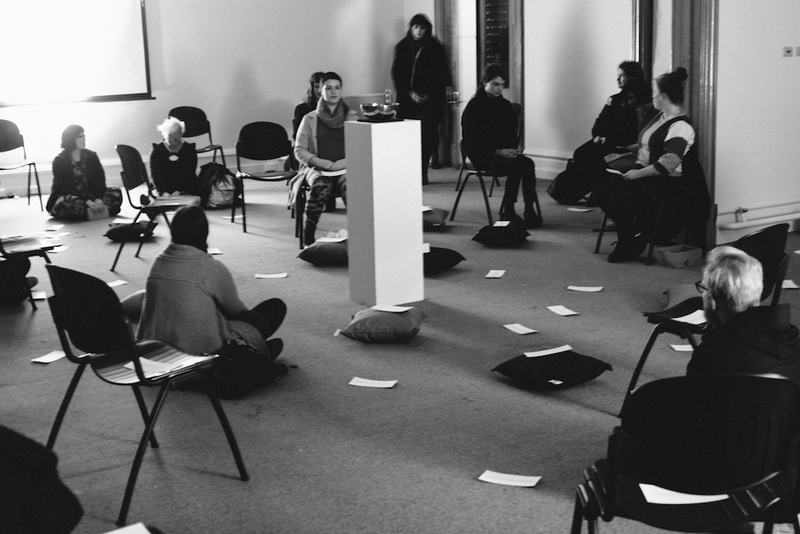 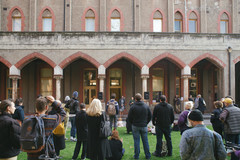 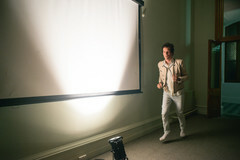 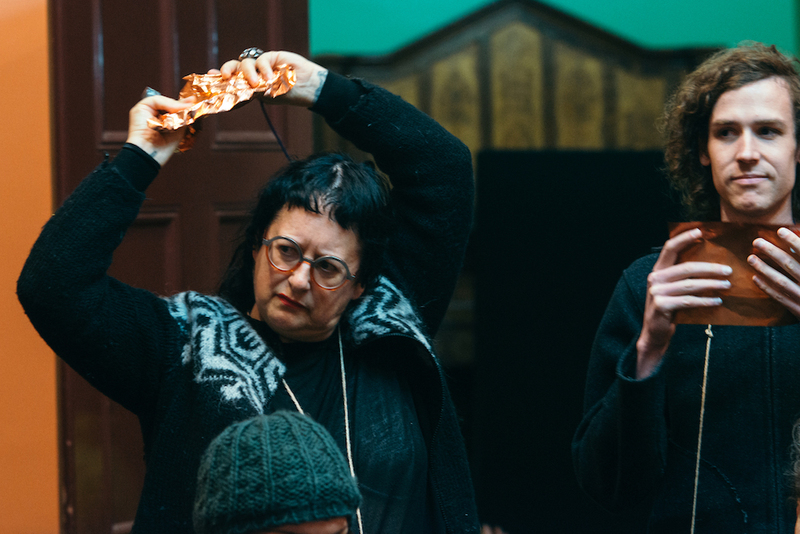 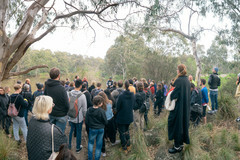 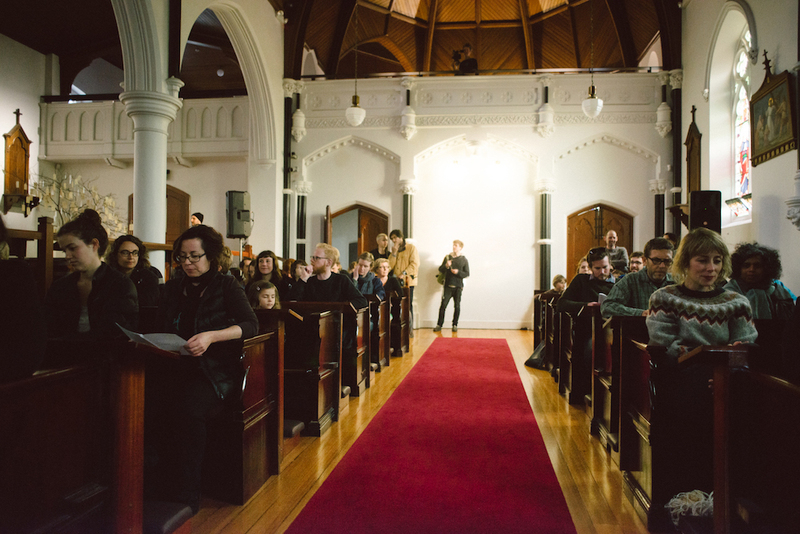 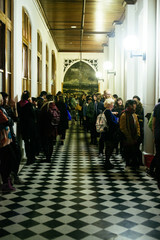 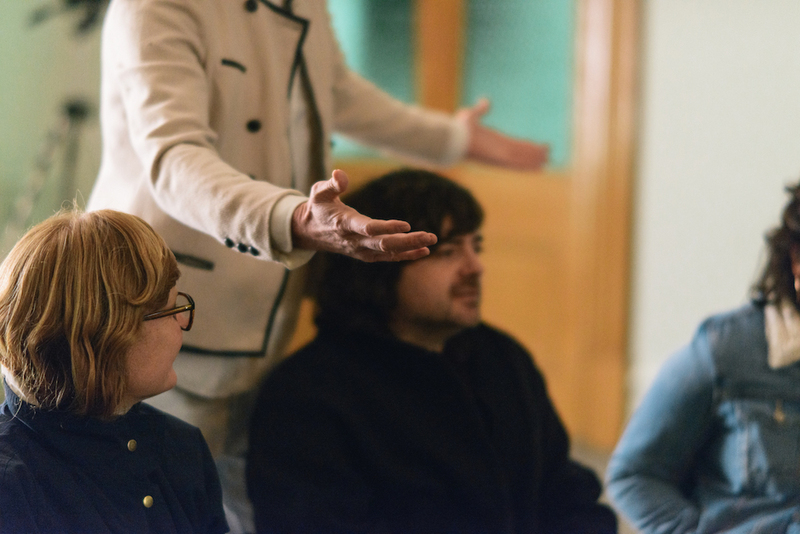 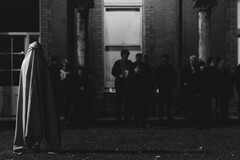 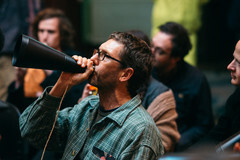 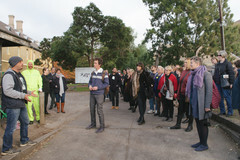 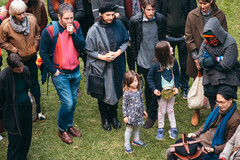 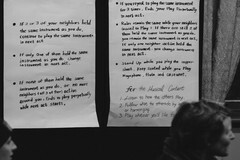 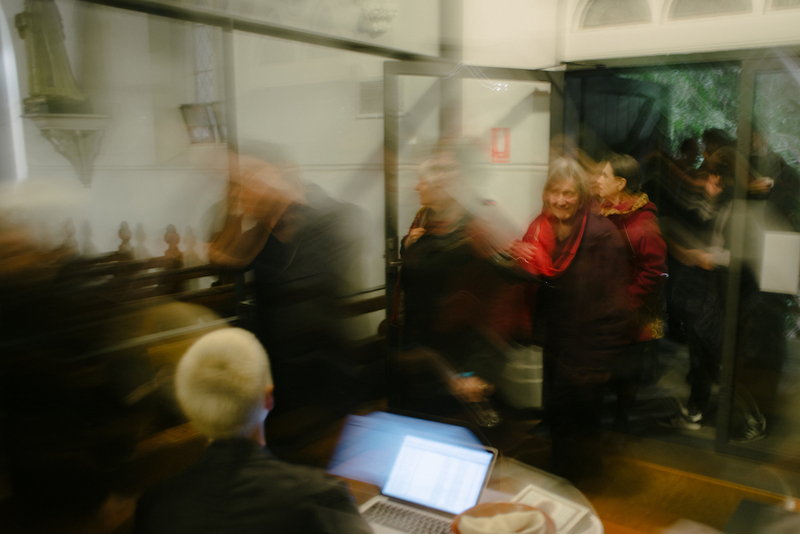 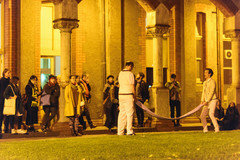 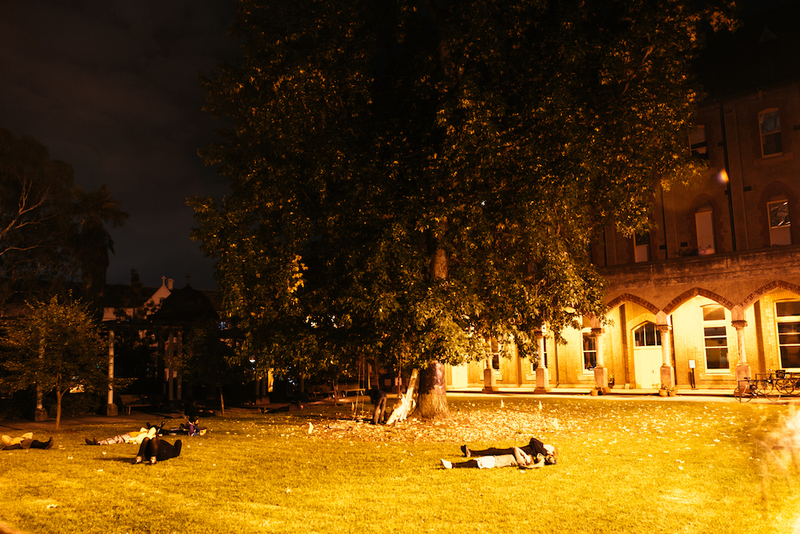 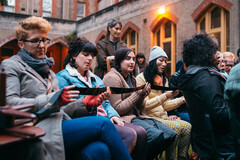 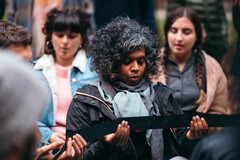 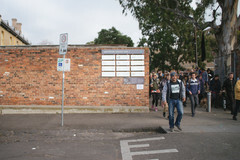 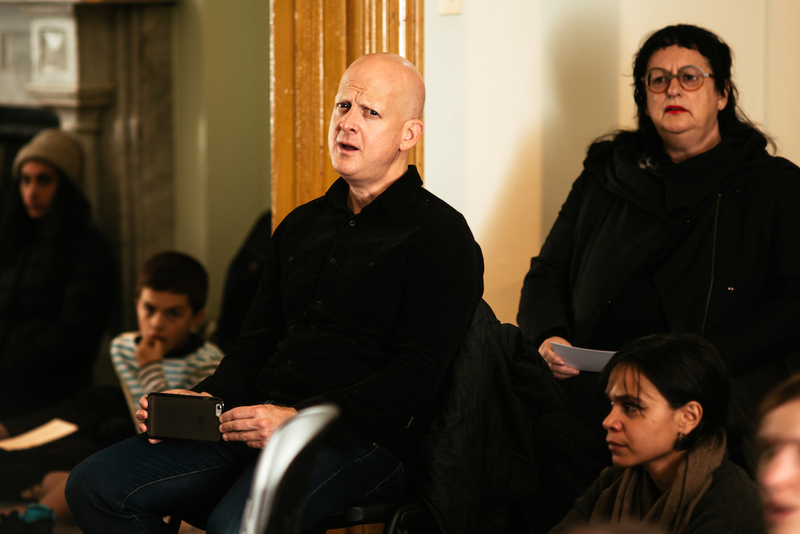 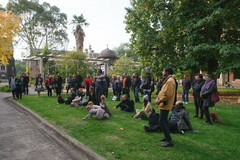 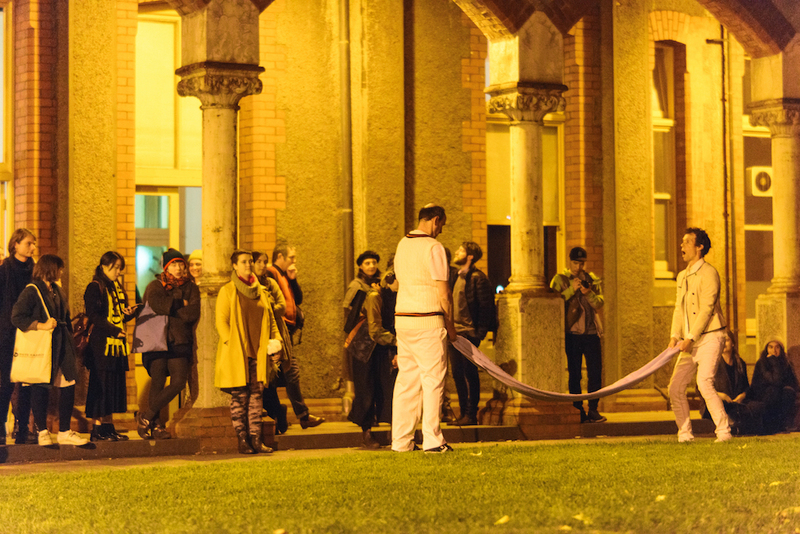 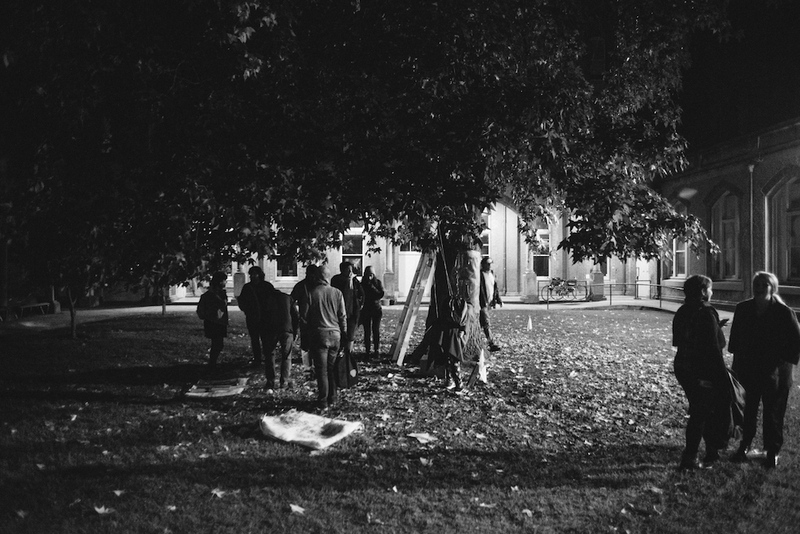 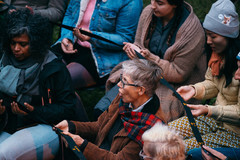 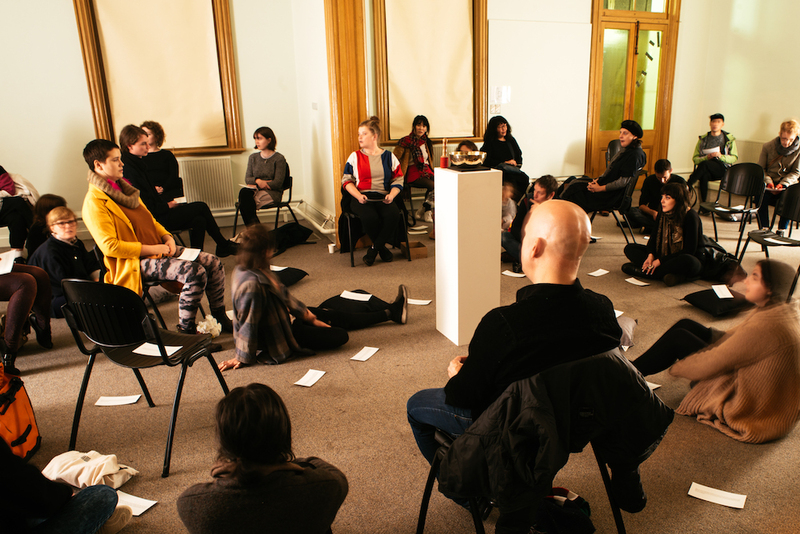 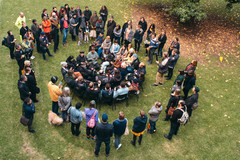 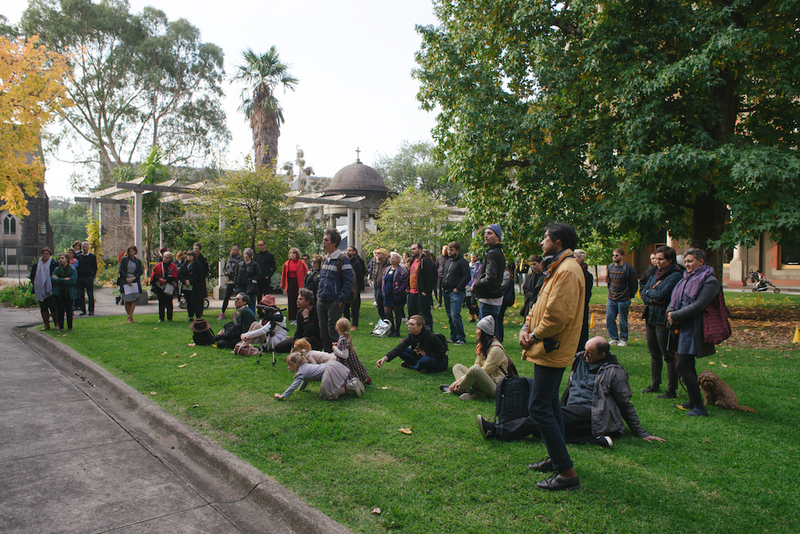 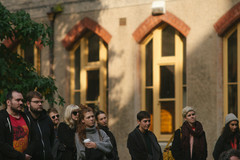 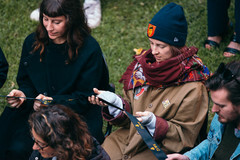 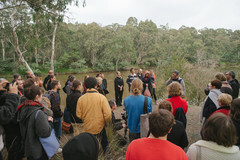 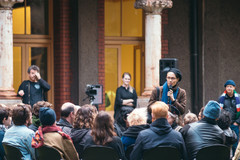 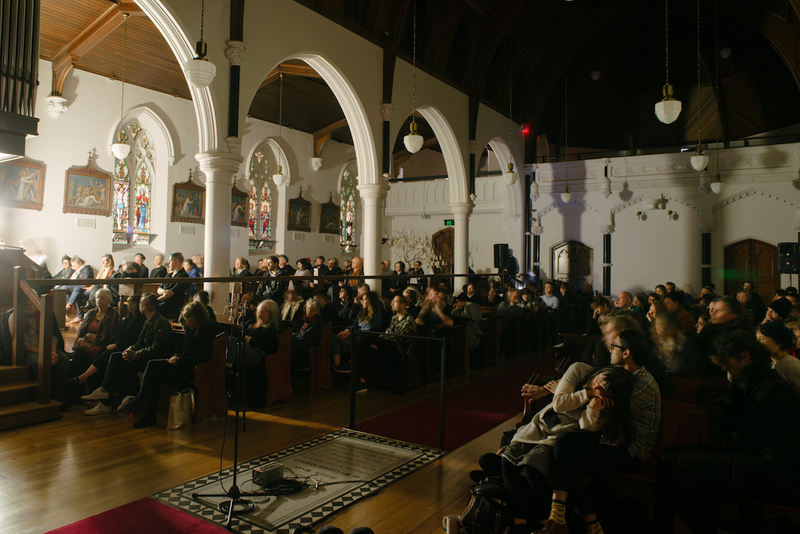 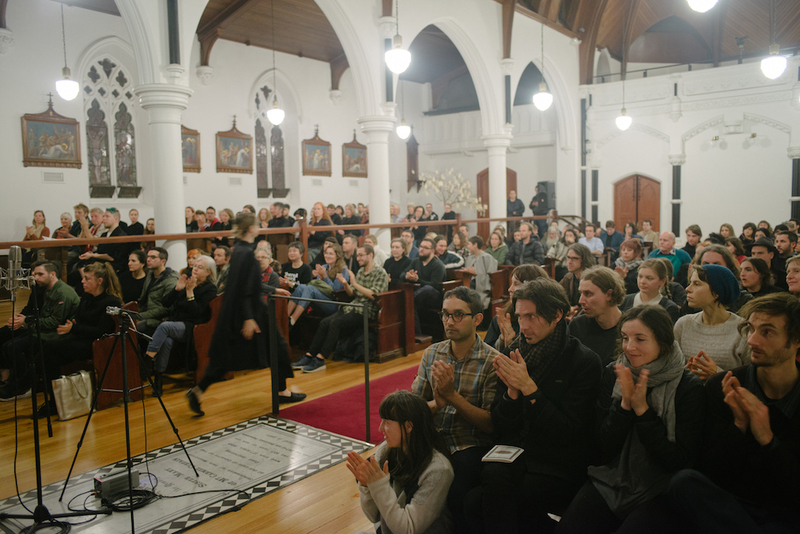 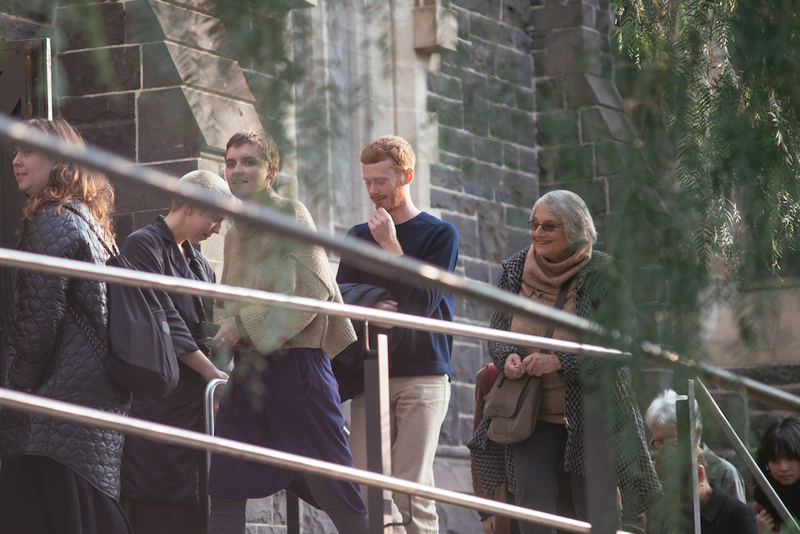 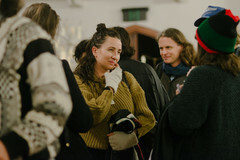 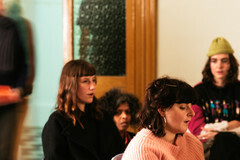 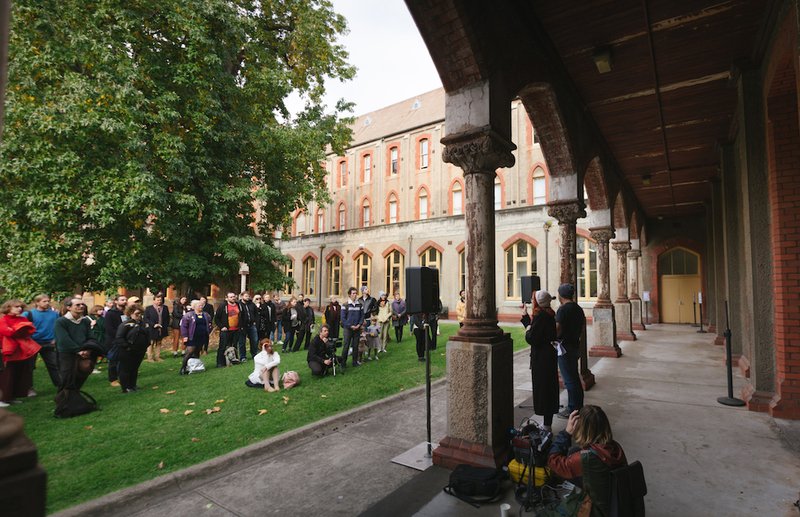 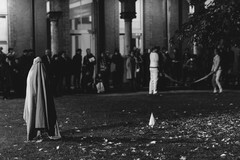 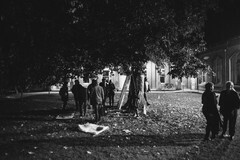 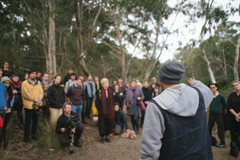 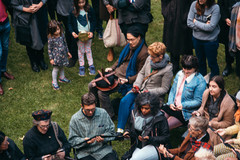 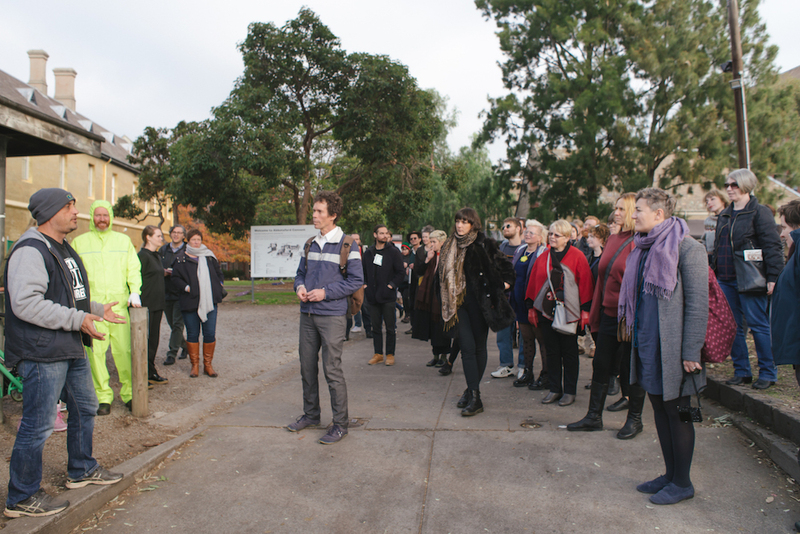 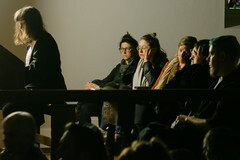 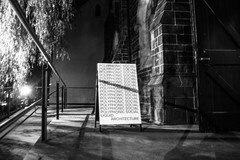 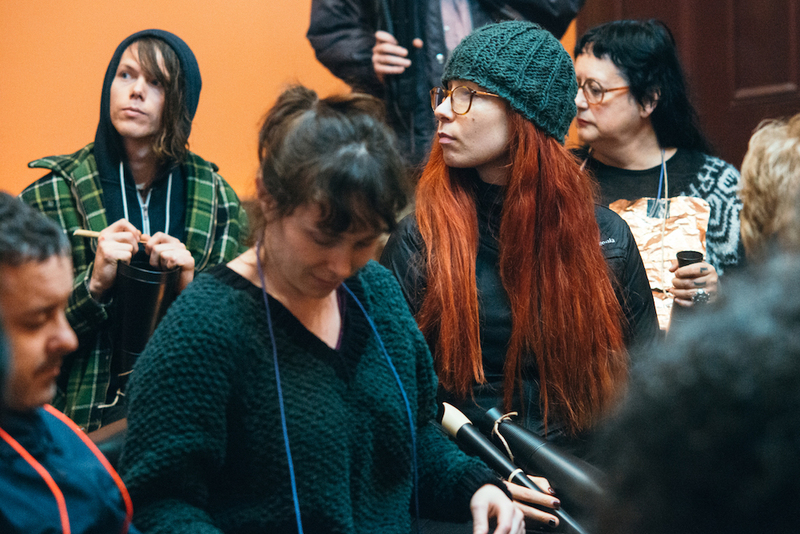 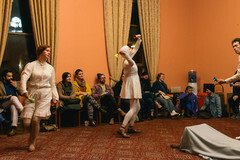 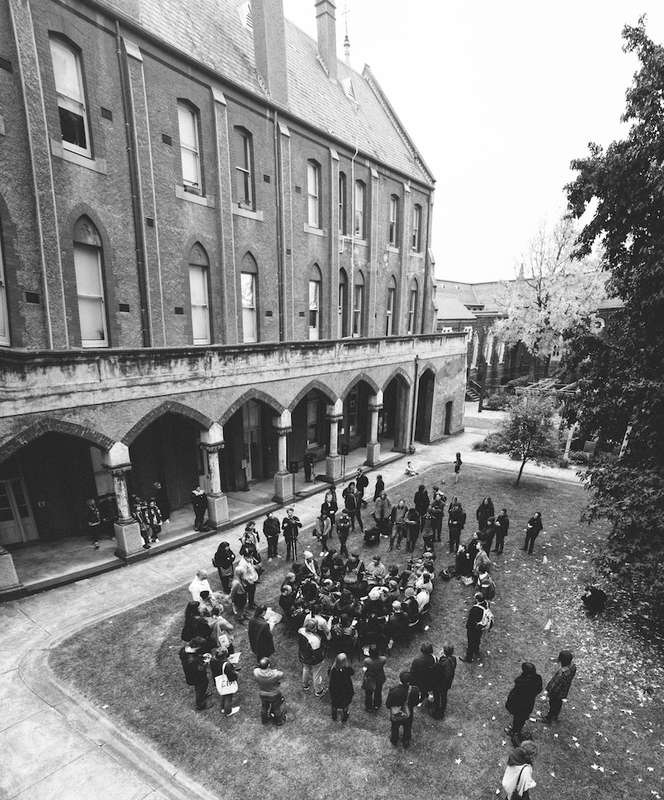 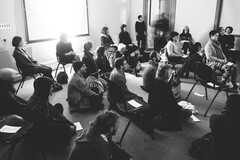 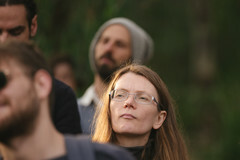 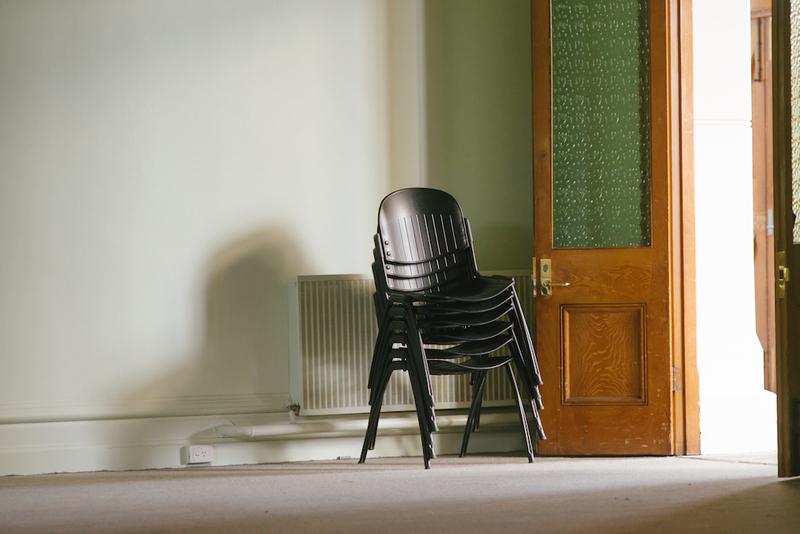 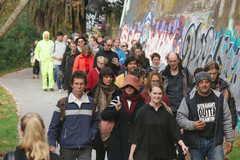 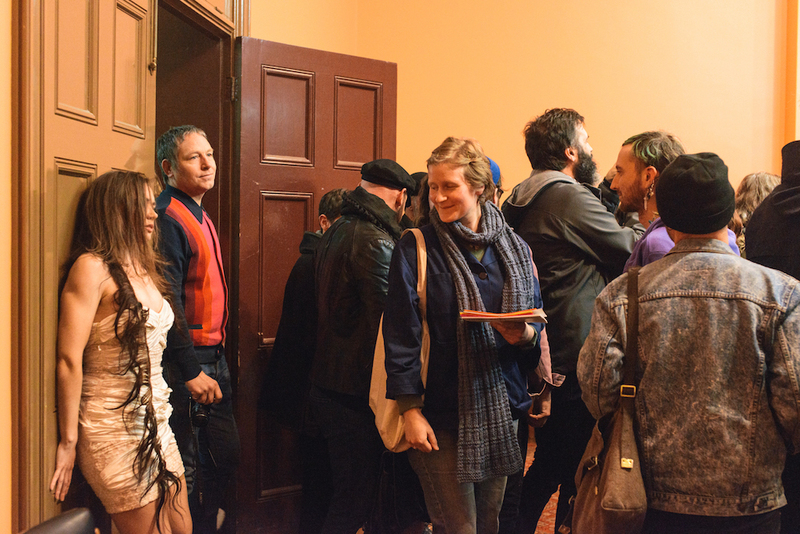 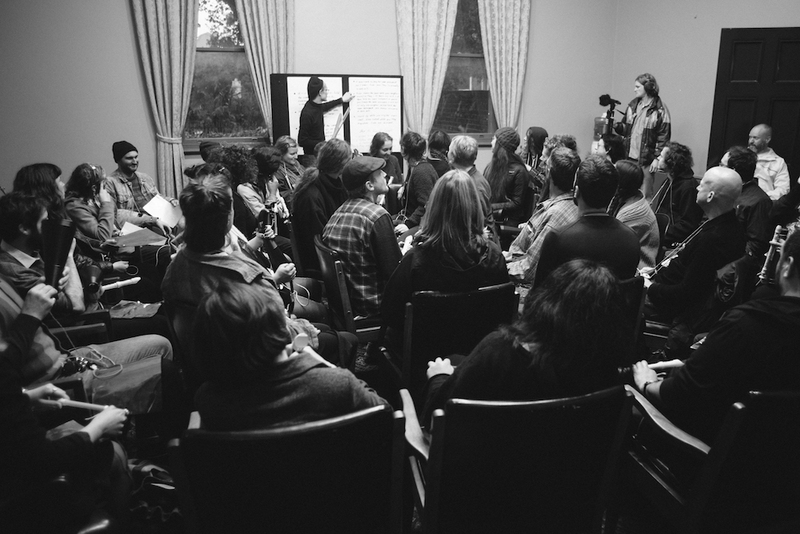 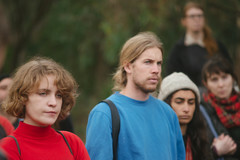 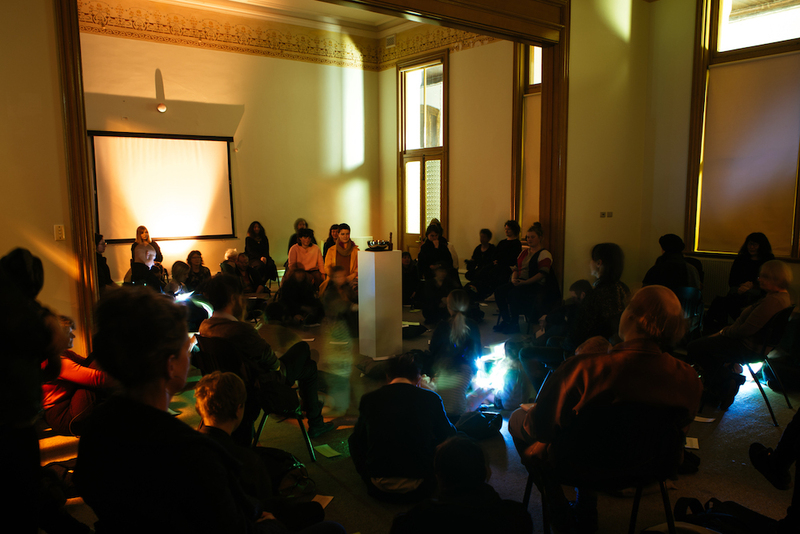 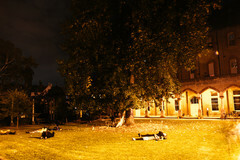 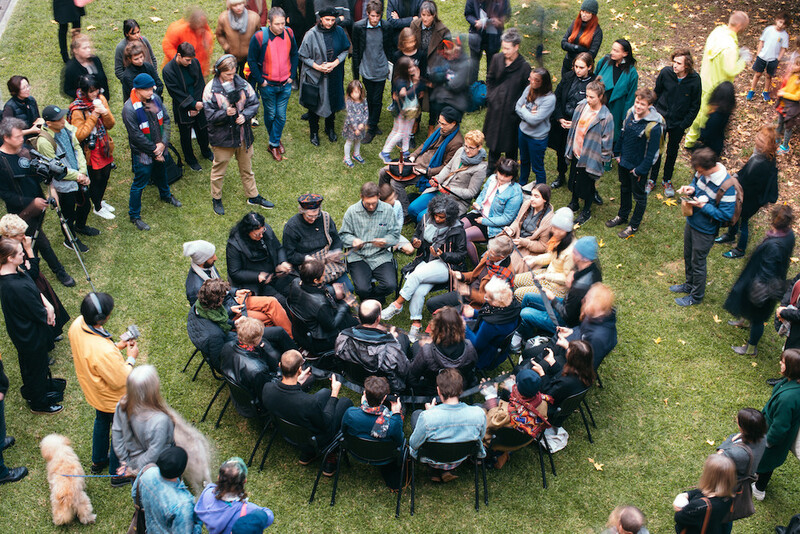 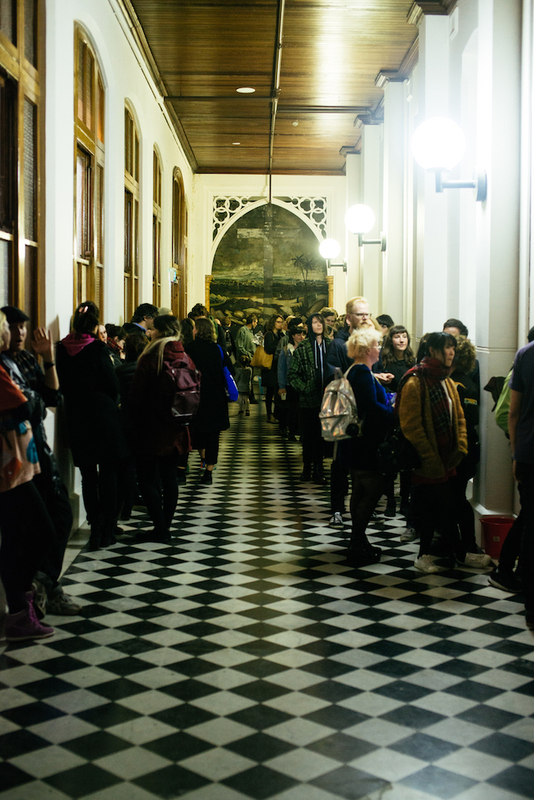 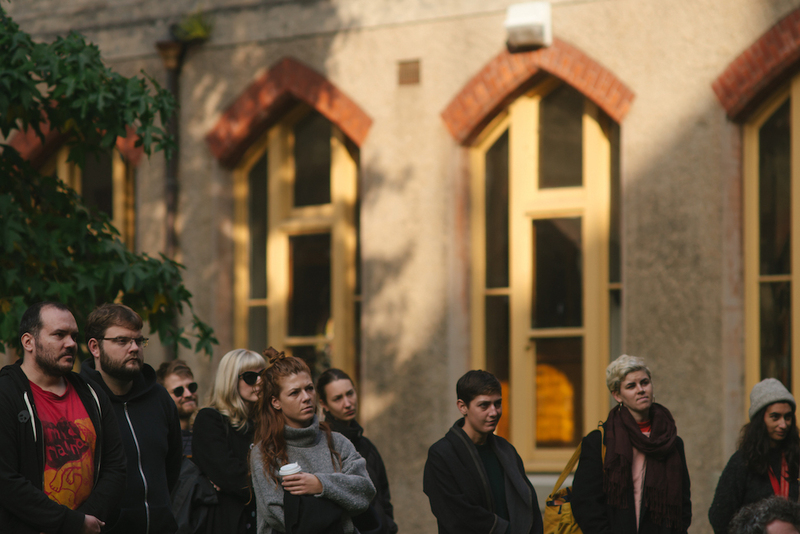 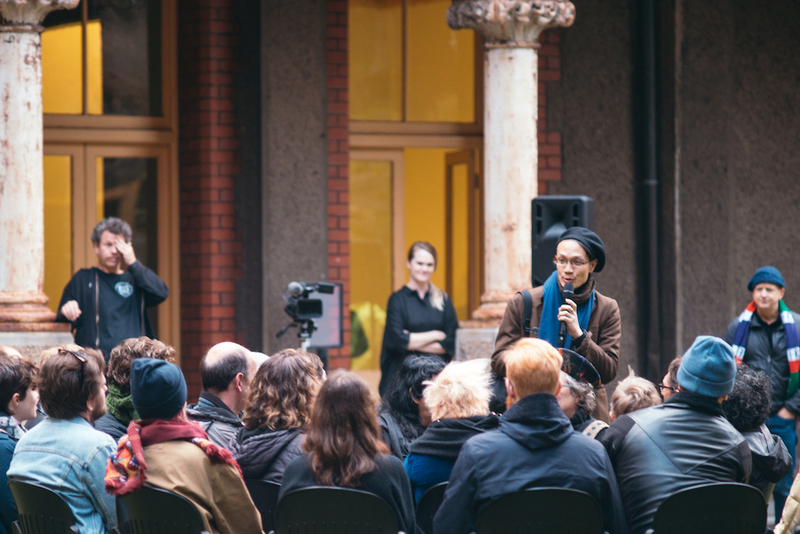 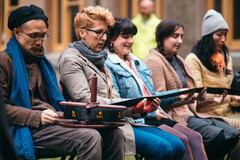 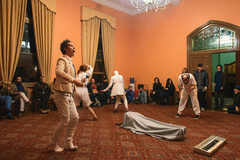 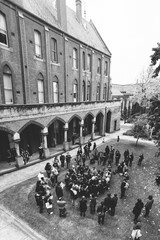 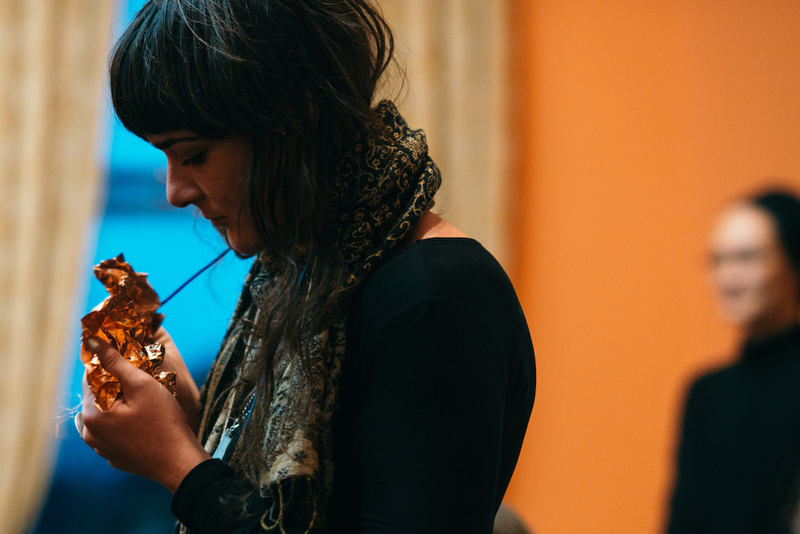 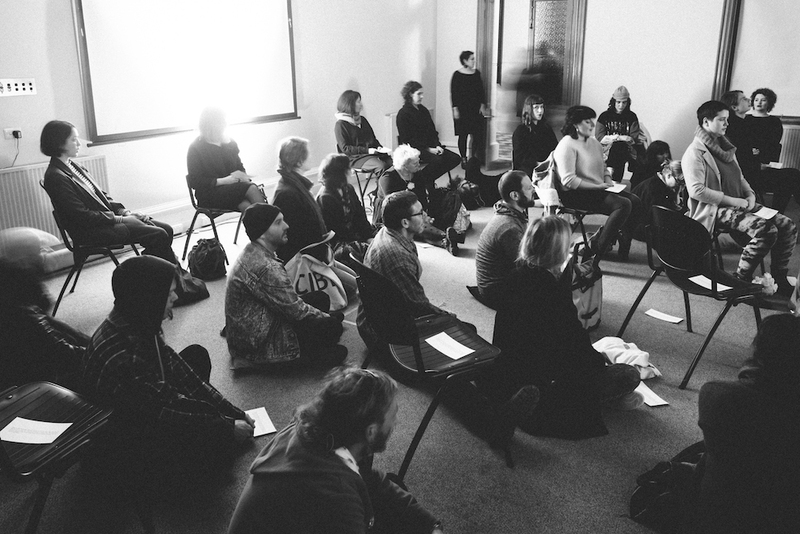 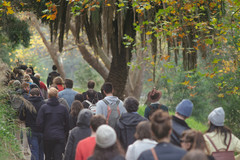 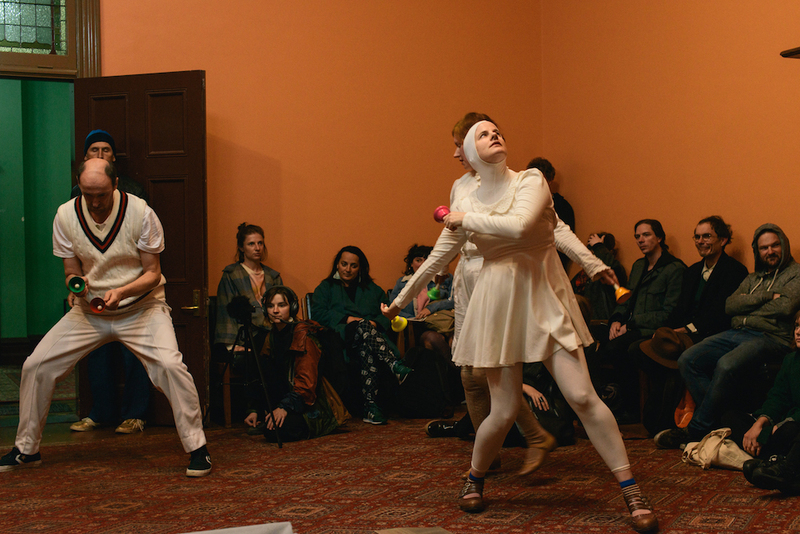 Polyphonic Social is an annual Liquid Architecture program in partnership with Abbotsford Convent supported by the City of Yarra through the Creative Yarra grants program. 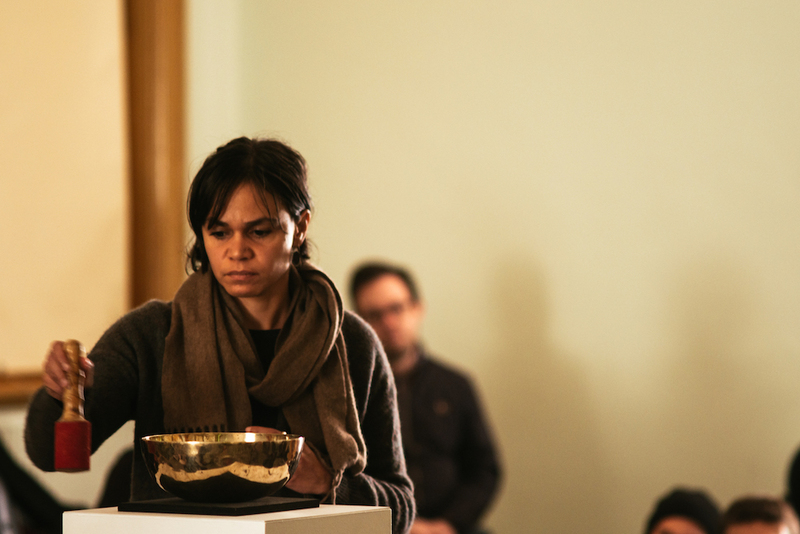 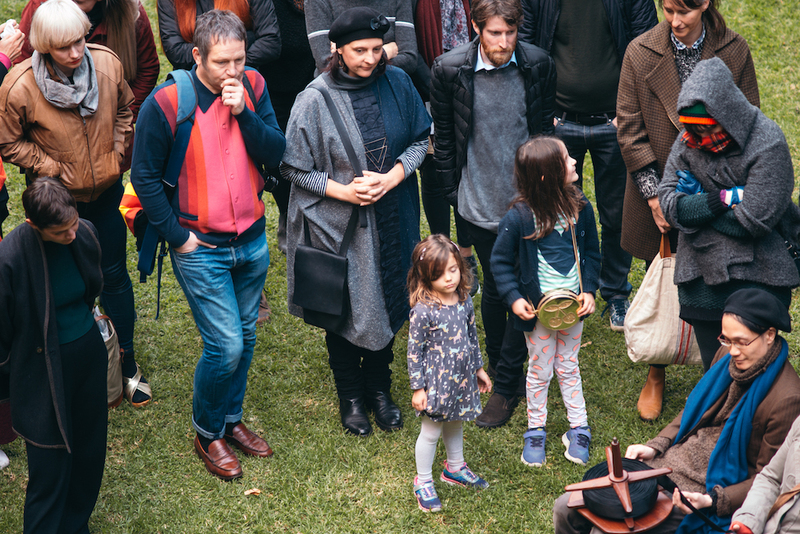 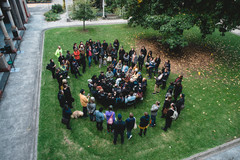 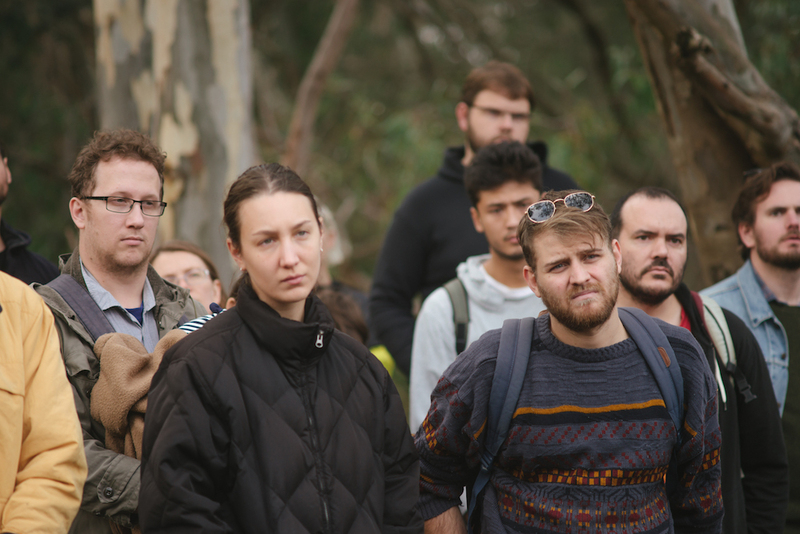 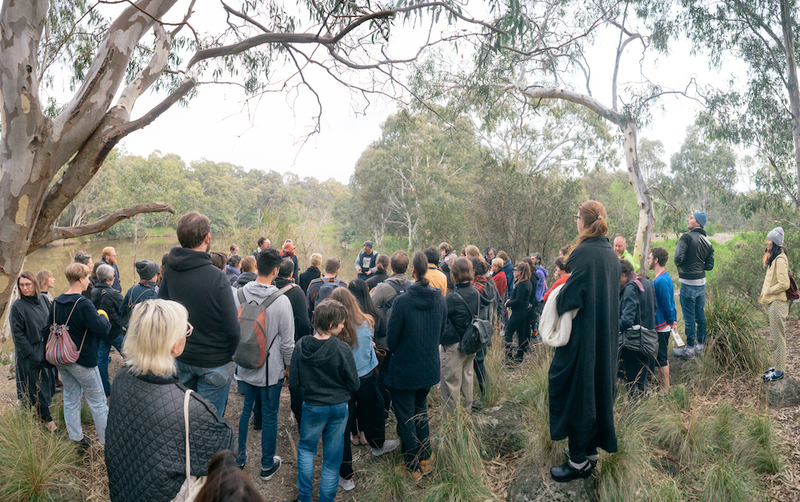 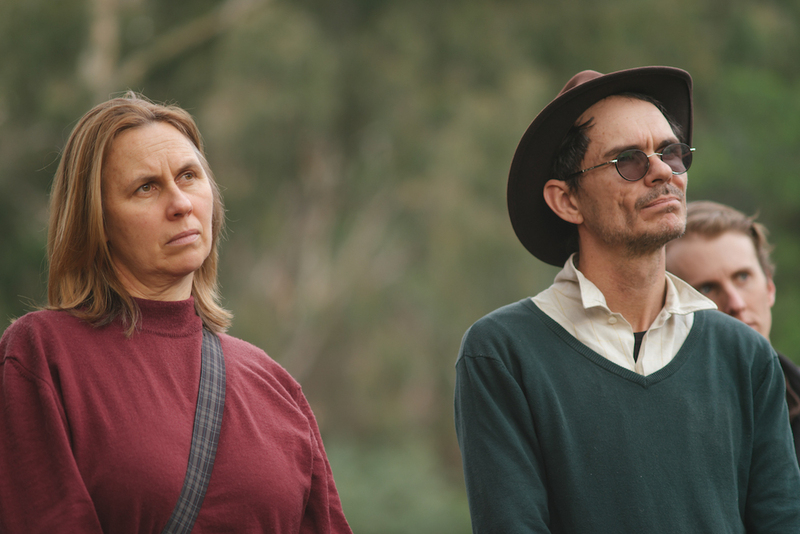 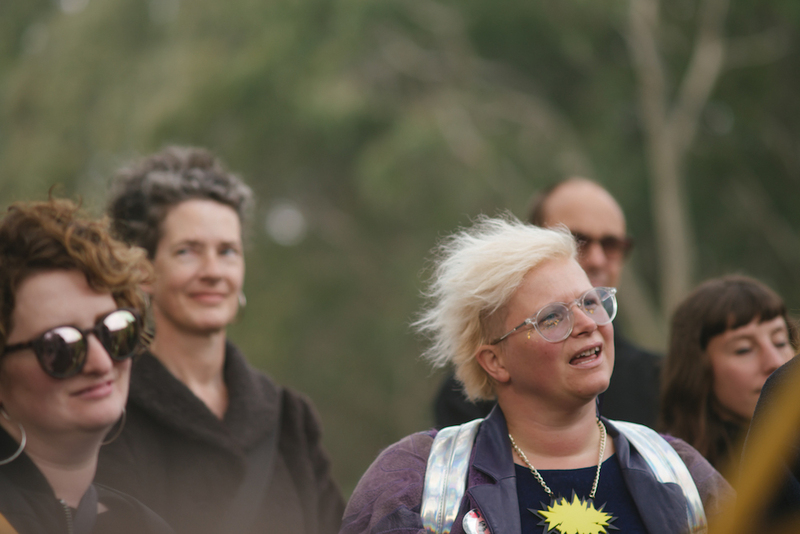 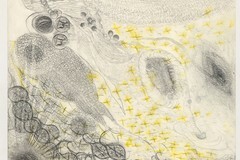 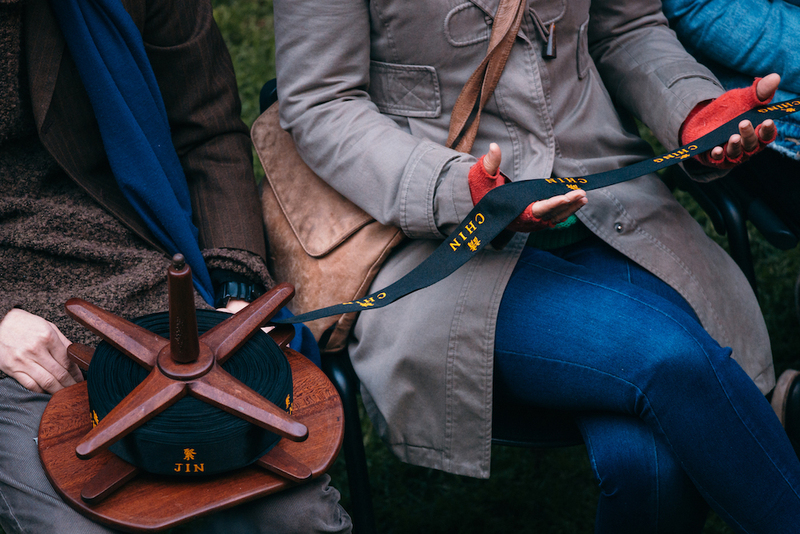 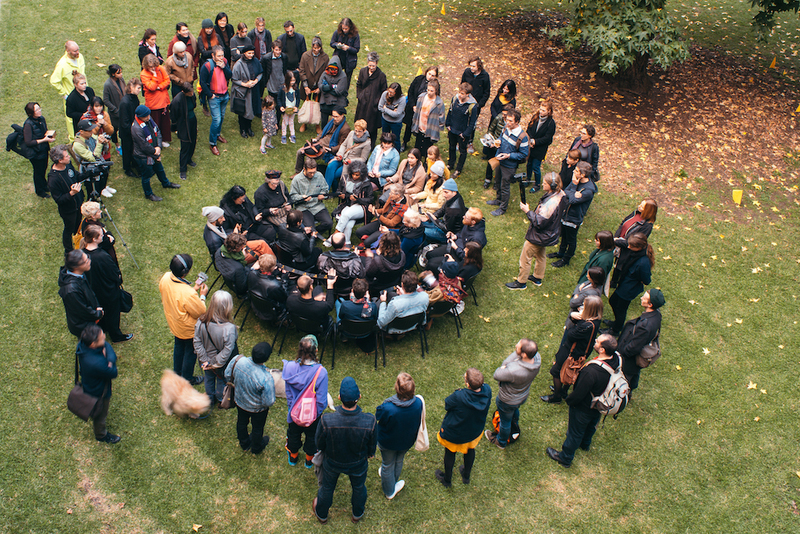 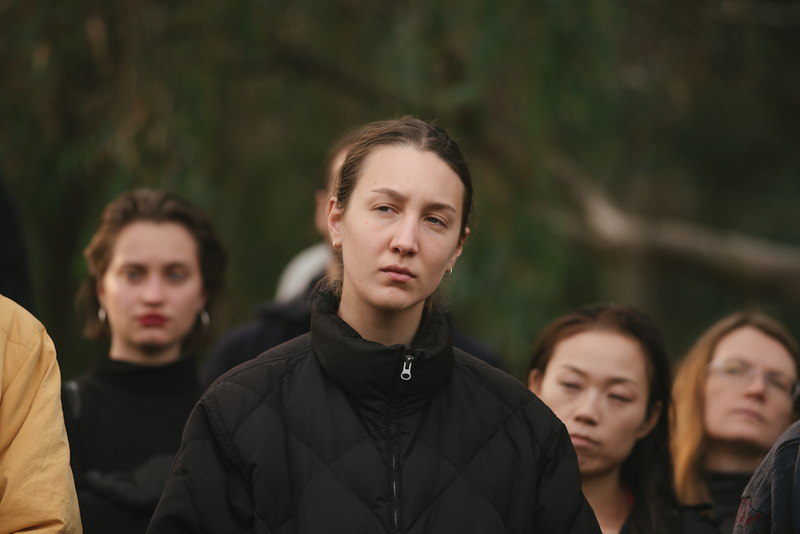 The organisers and artists acknowledge the Wurundjeri people of the Kulin Nation as the first owners of this country, and we recognise that sovereignty was never ceded. We pay our respects to their Elders, past, present and emerging. 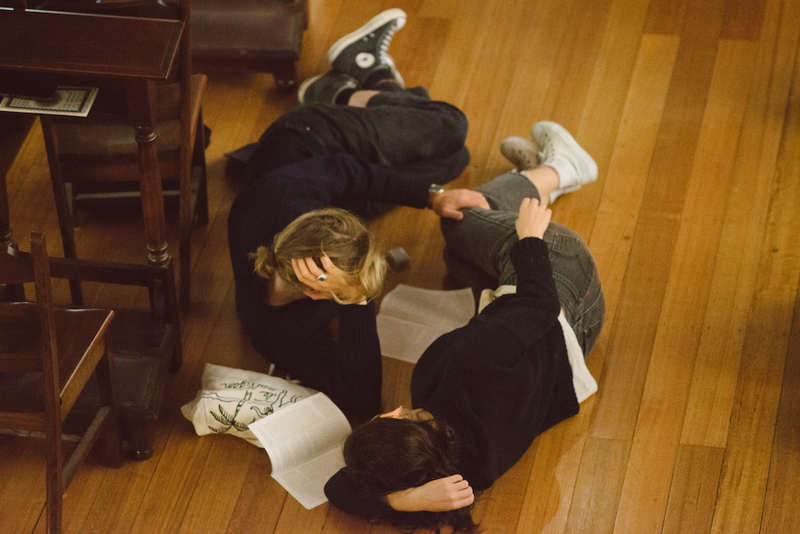 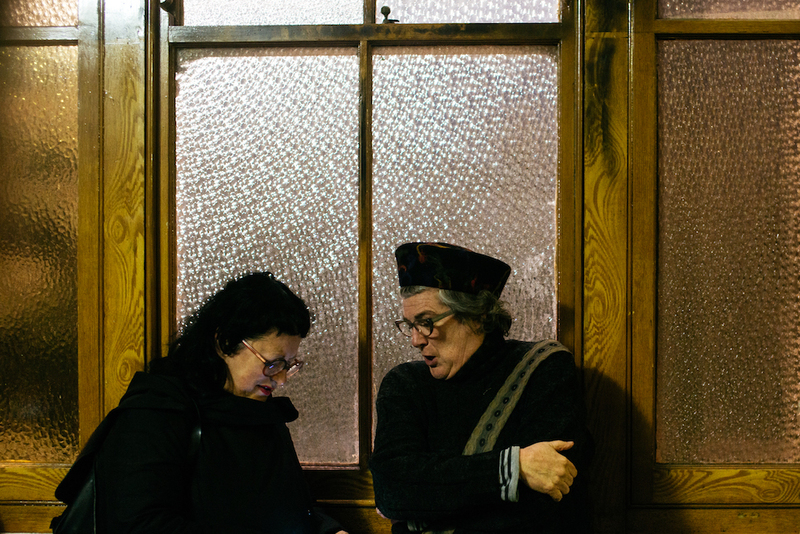 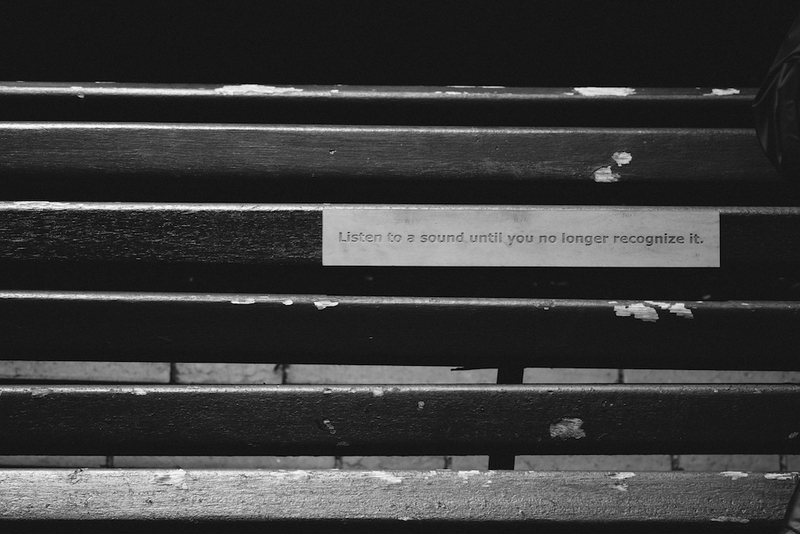 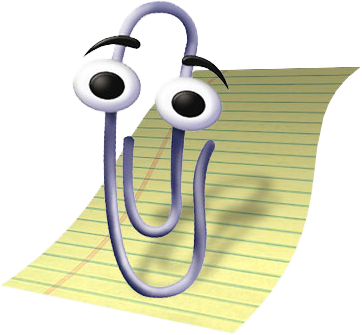 We would like to reflect that active and respectful listening is inherent in acknowledgement. Running Bathing Singing With The Hi God People; bathing each other while dressed in sleepwear, wetting the sleepwear in the process.